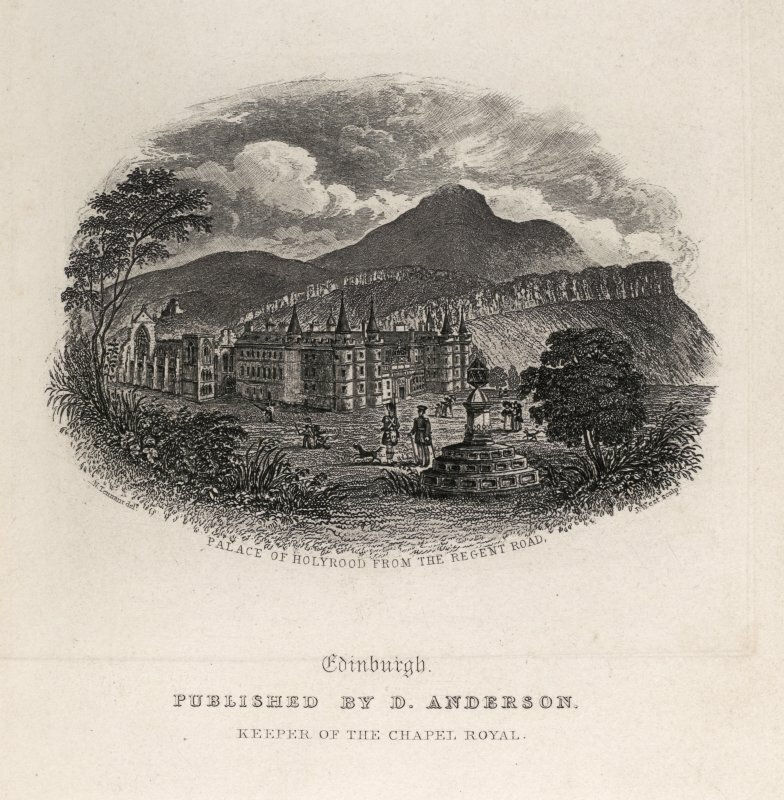 Views in Scotland is a compilation volume containing 295 engravings showing views of buildings and landscapes around Scotland, many of which are now substantially altered or gone. 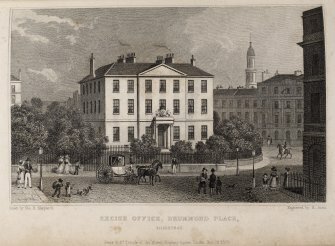 The engravings have been arranged alphabetically and bound in half leather with marbled boards possibly after 1866, which is the date of the latest engraving. 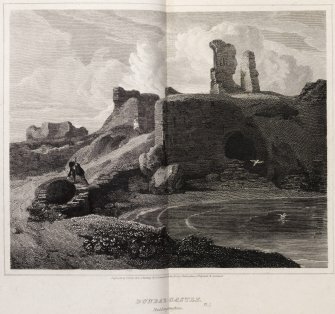 The engravings in the volume has been collected from other books and magazines and possibly bought from print sellers as well, however the collector of the engravings has not been identified. 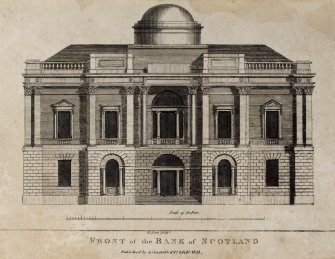 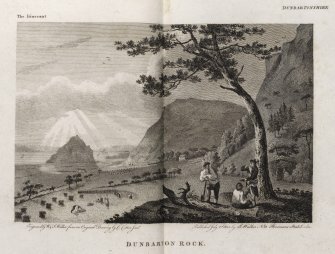 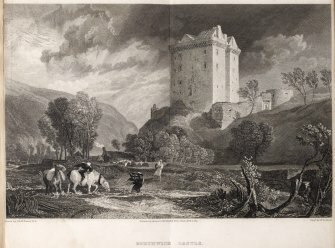 There are examples from Thomas Pennant’s 'Tour of Scotland and Journey to the Hebrides' (3rd edition 1774), 'The Gentleman's Magazine', the 1805-17 issues of 'The Scots Magazine and Edinburgh Literary Miscellany' and 'The Antiquarian & Topographical Cabinet containing a series of elegant views of the most interesting objects of curiosity in Great Britain'. 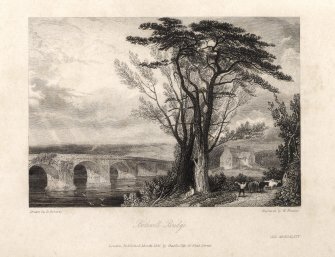 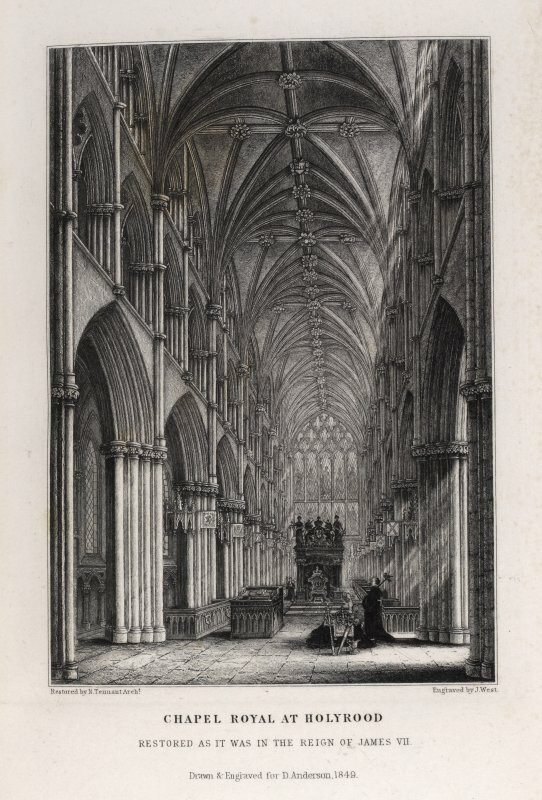 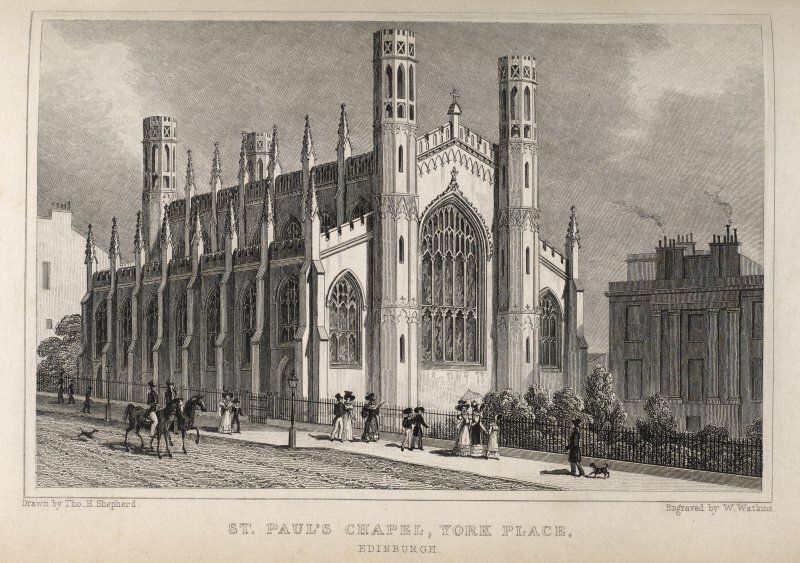 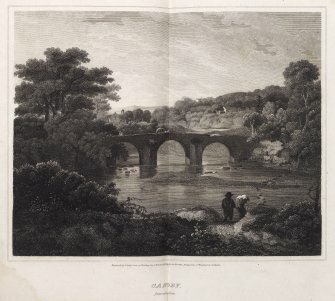 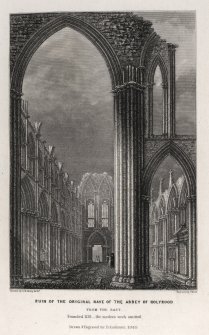 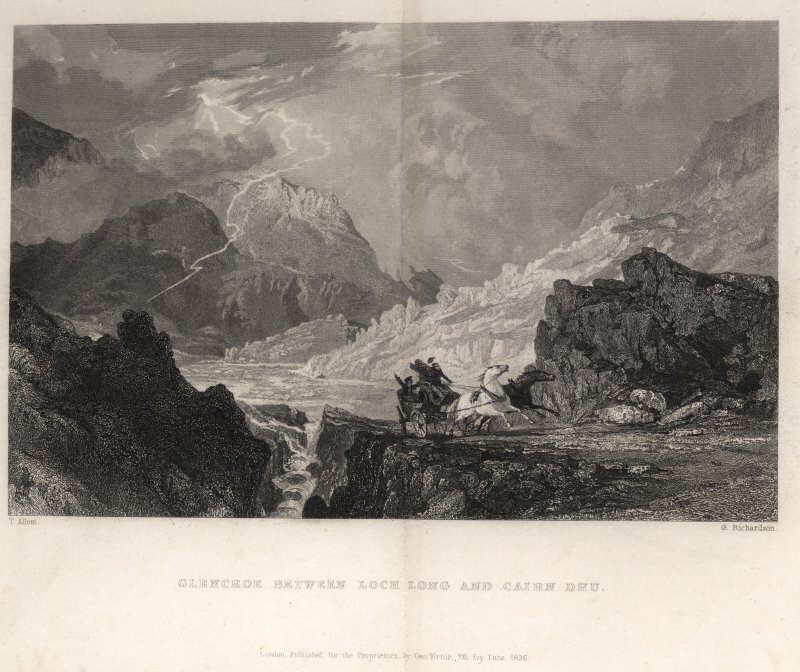 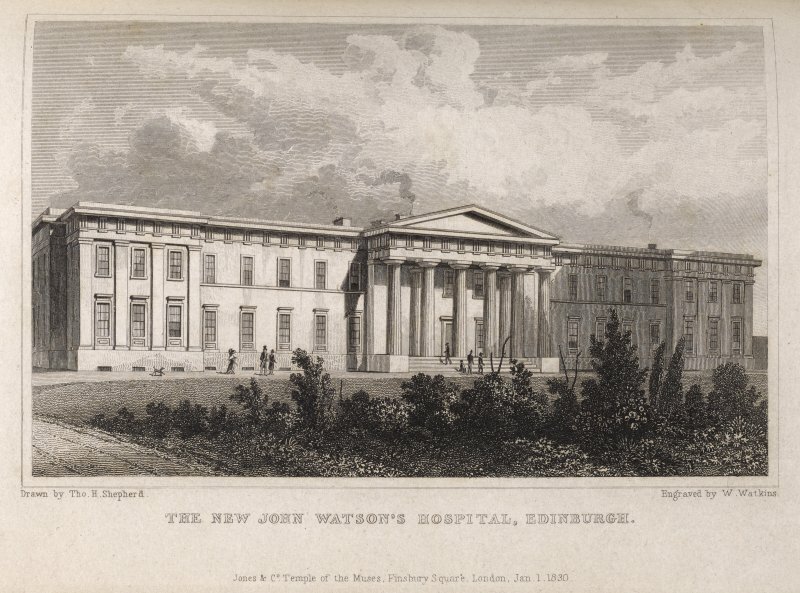 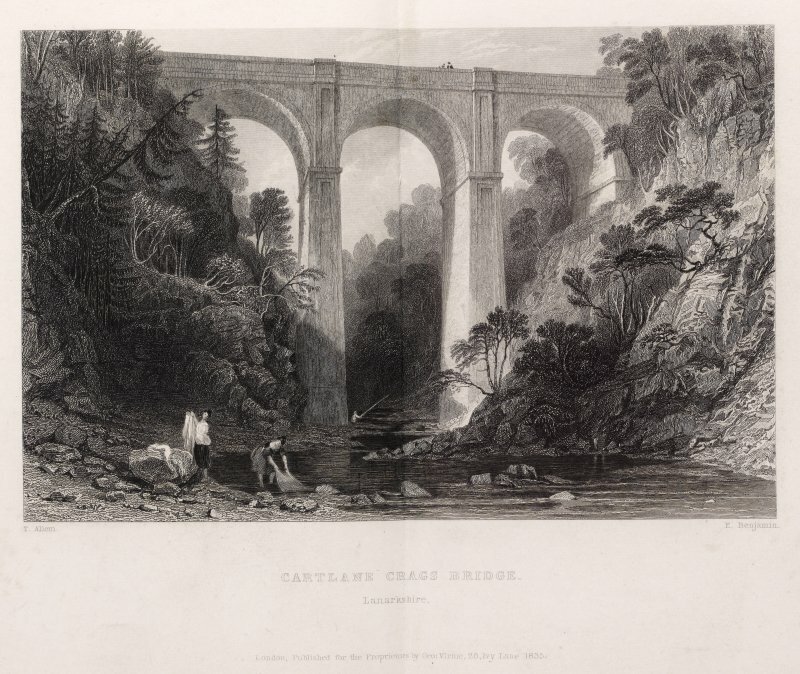 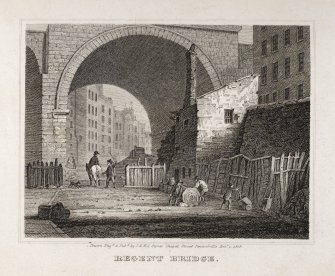 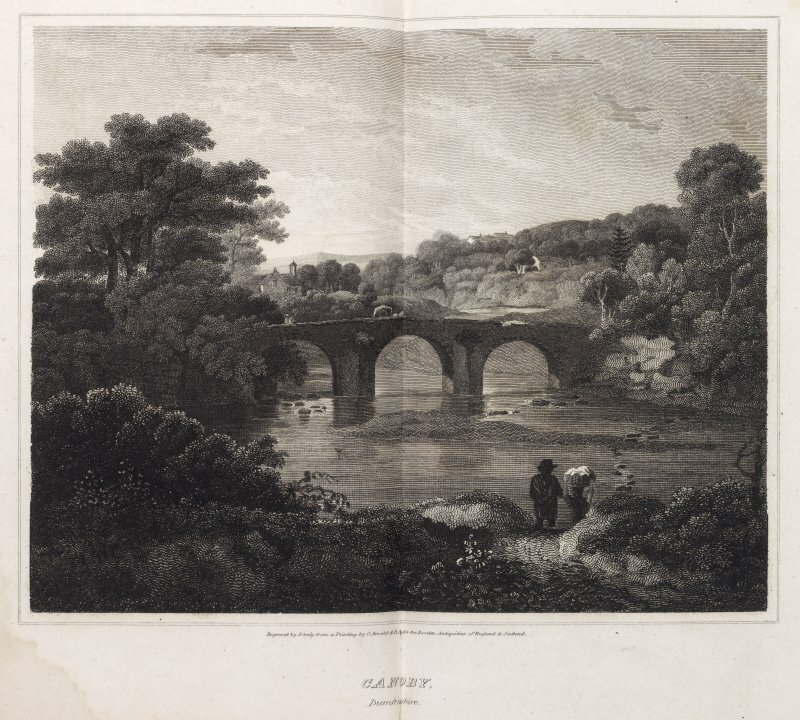 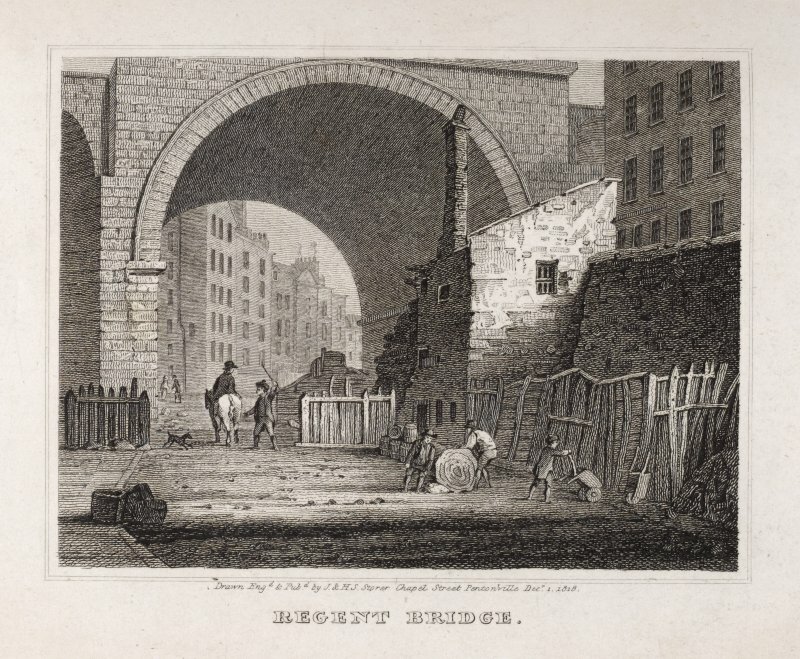 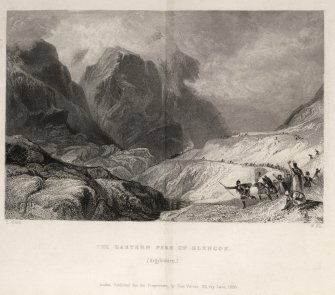 The majority of the engravings were published during the first three decades of the 19th-century and includes artists, engravers and publishers like J P Neale, J M W Turner, S Hooper, Thomas H Shepherd, Paul Sandby, Joseph Swan and P Mazell. 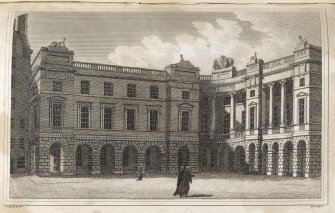 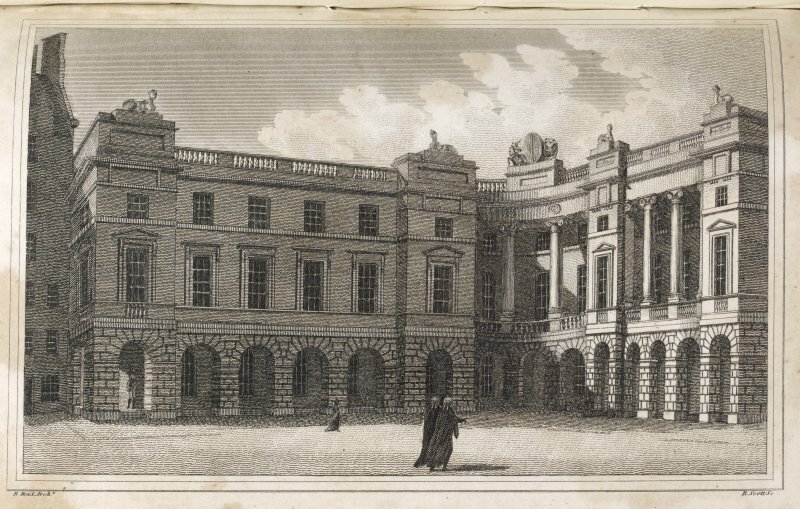 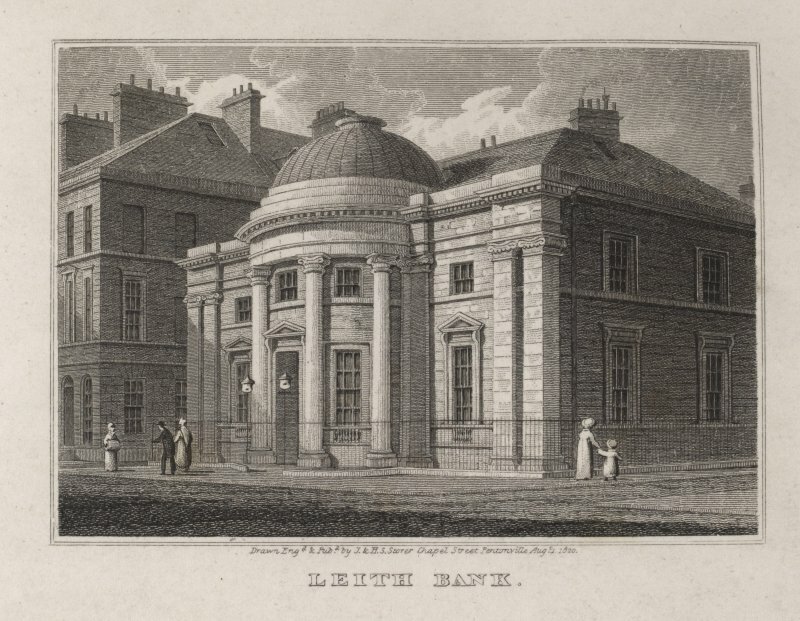 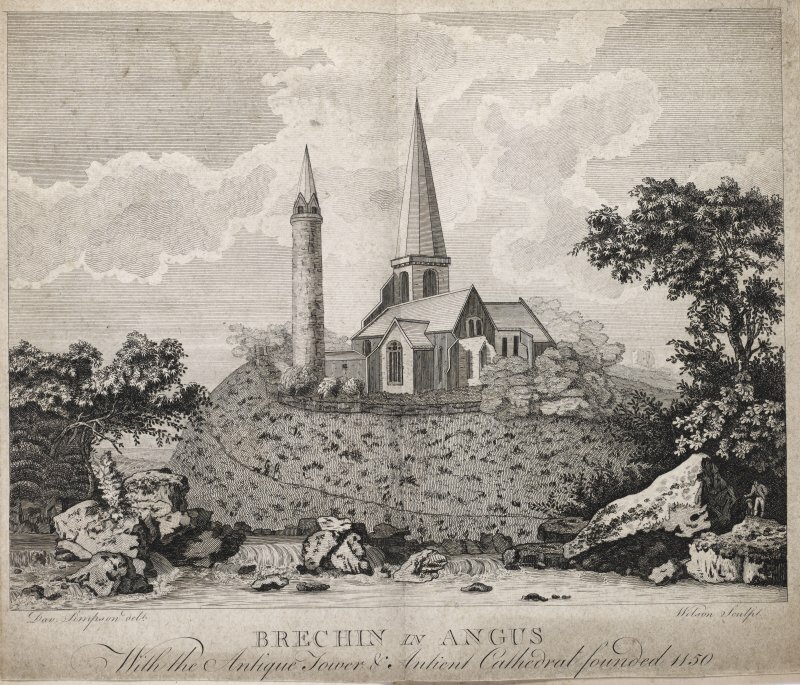 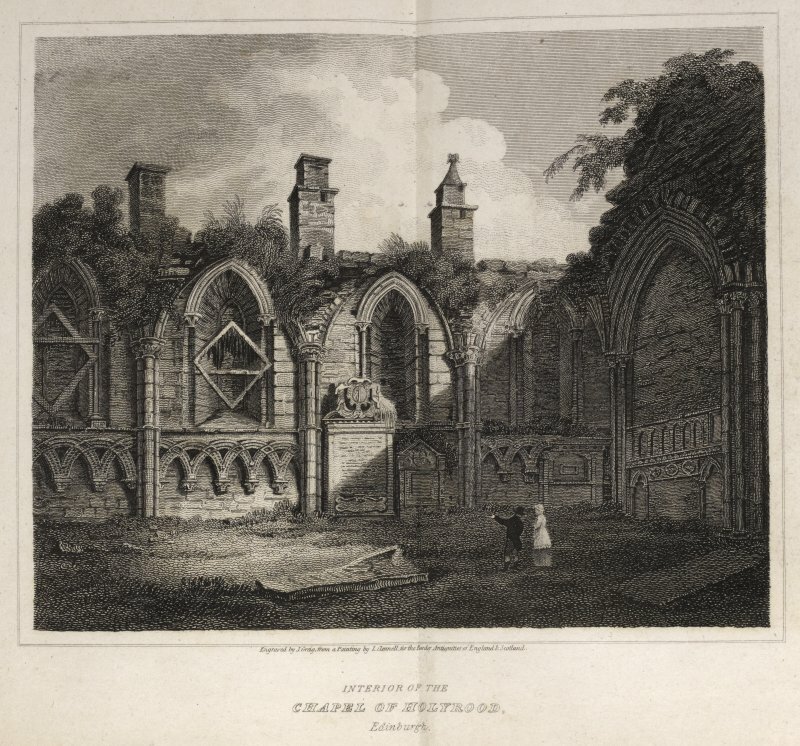 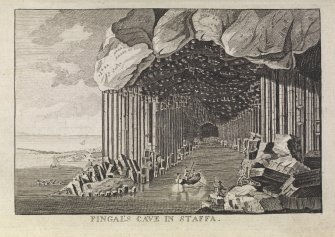 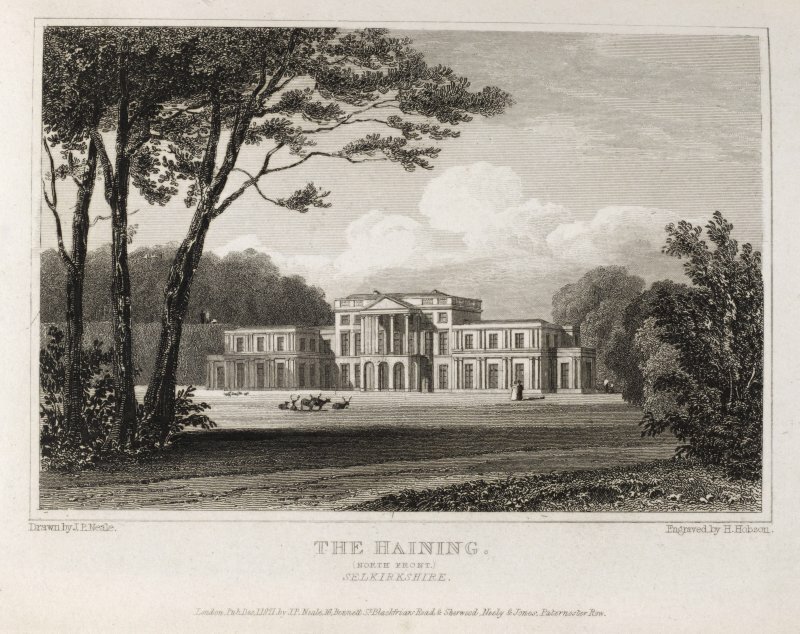 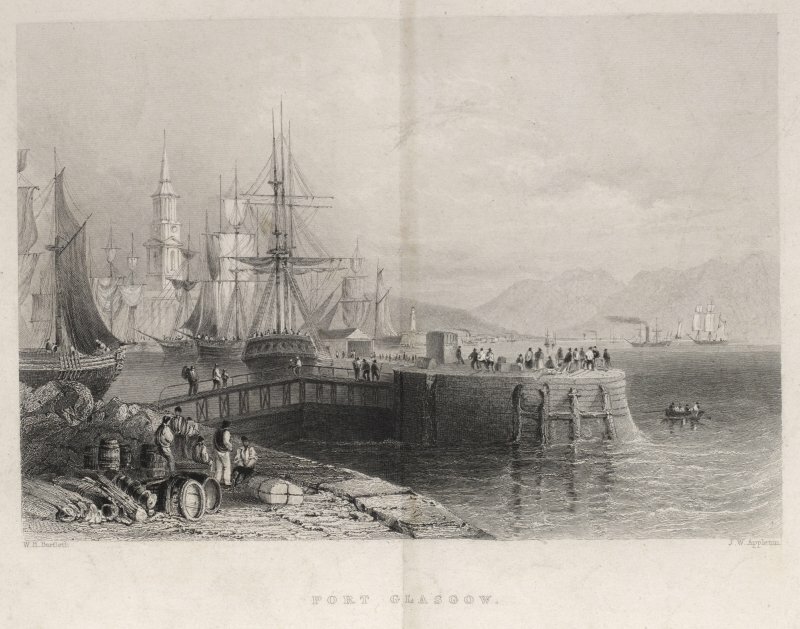 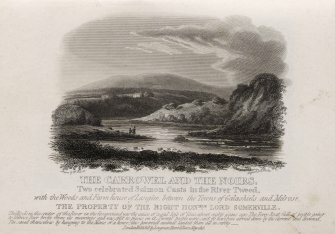 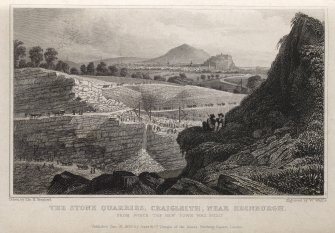 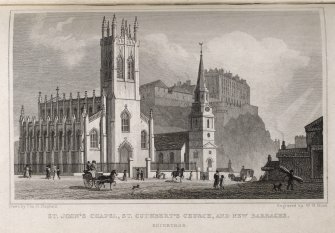 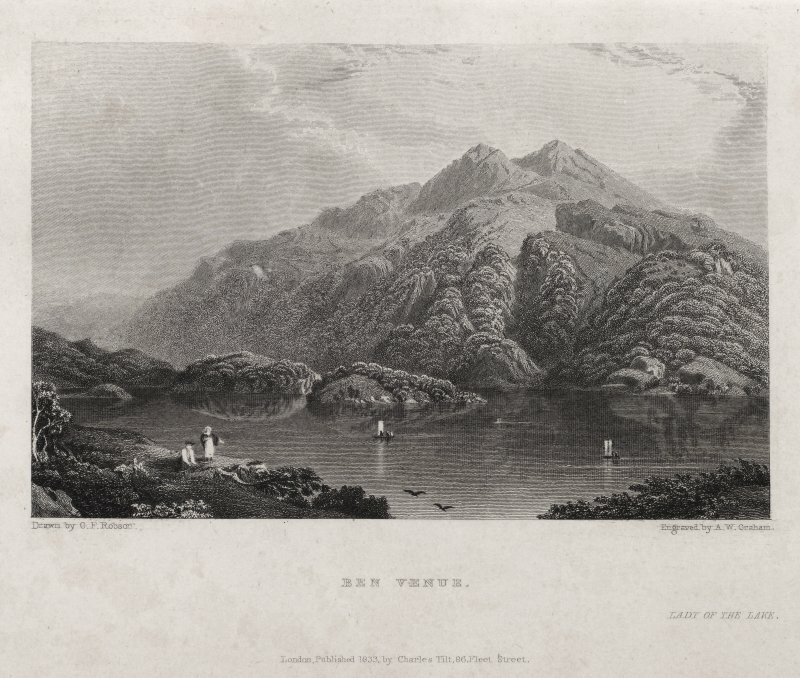 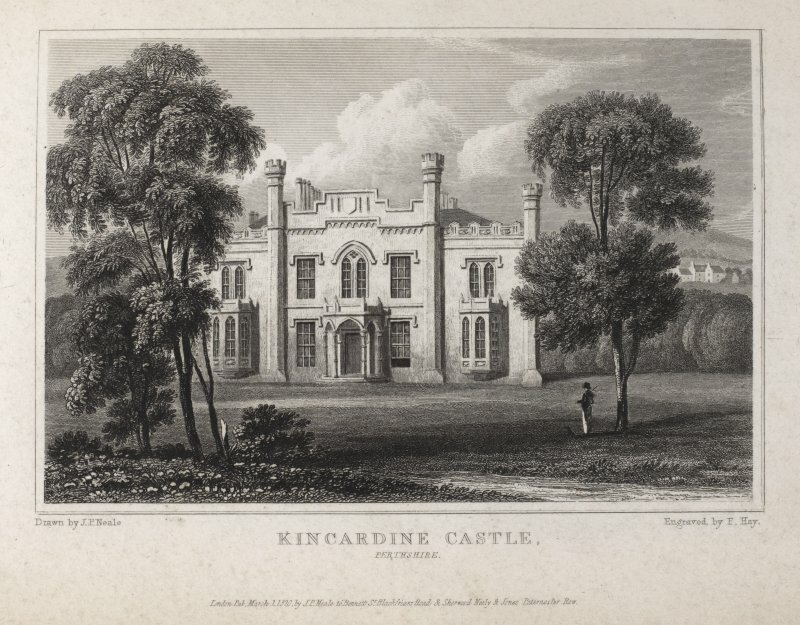 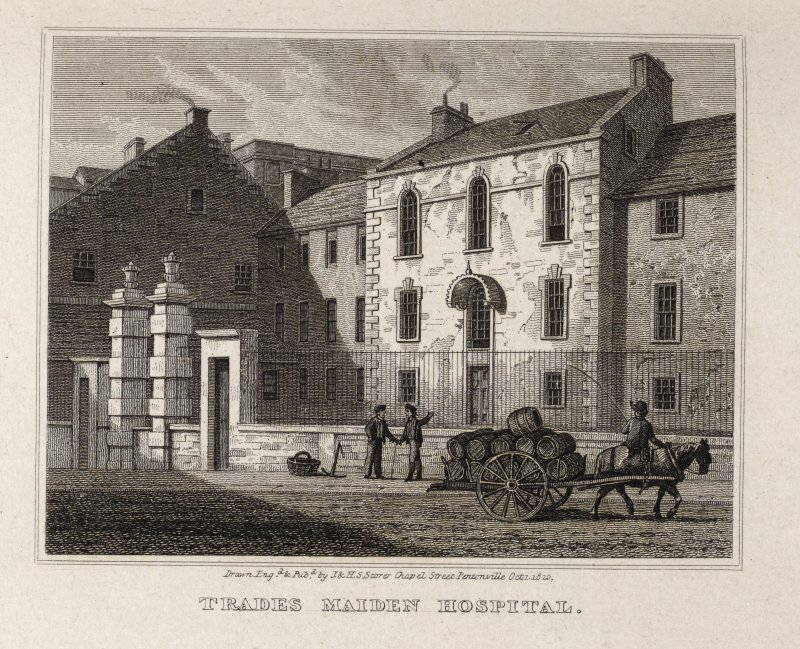 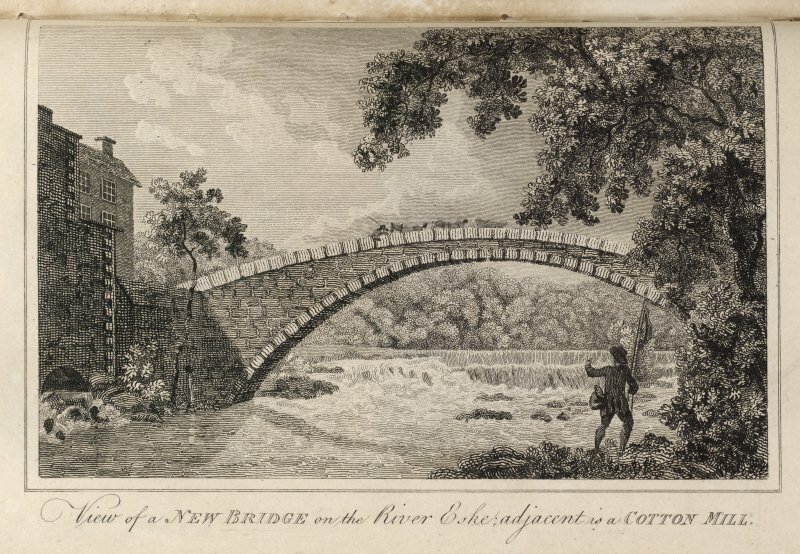 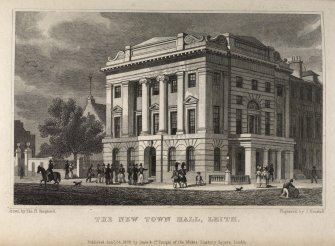 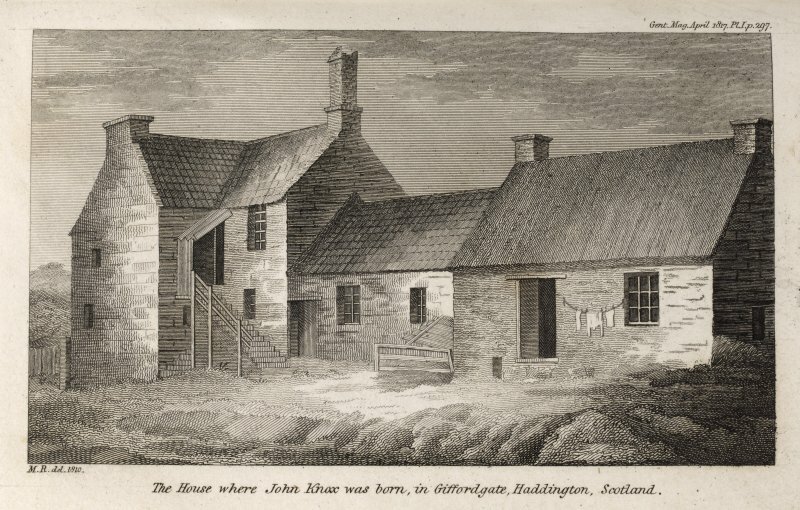 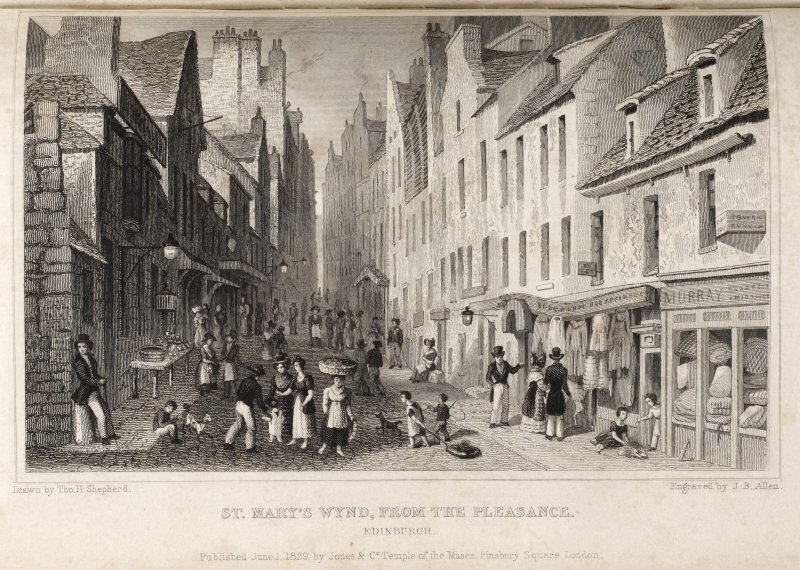 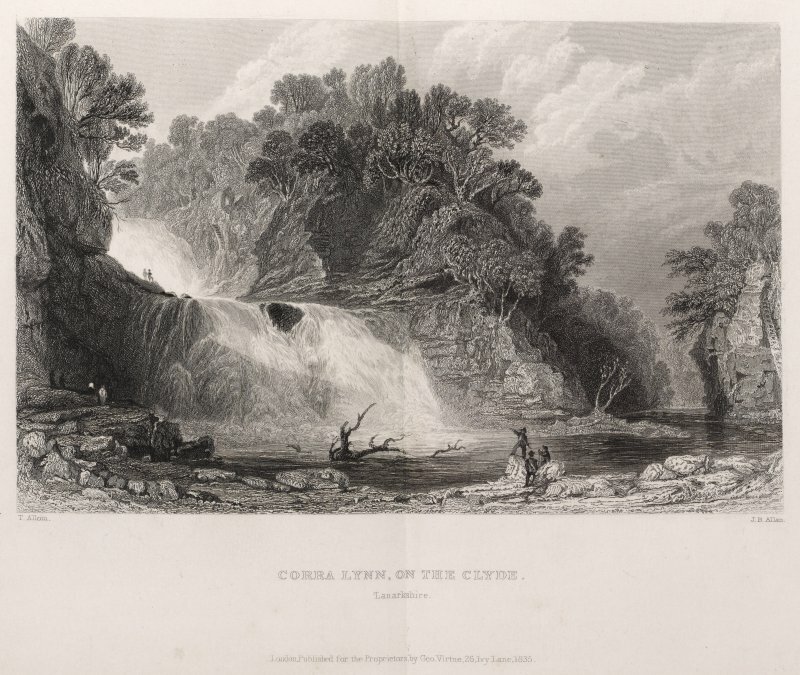 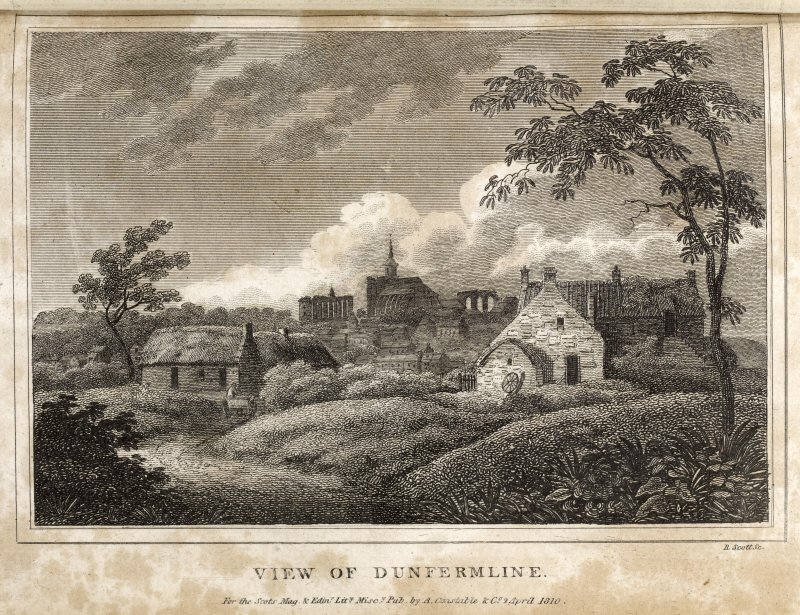 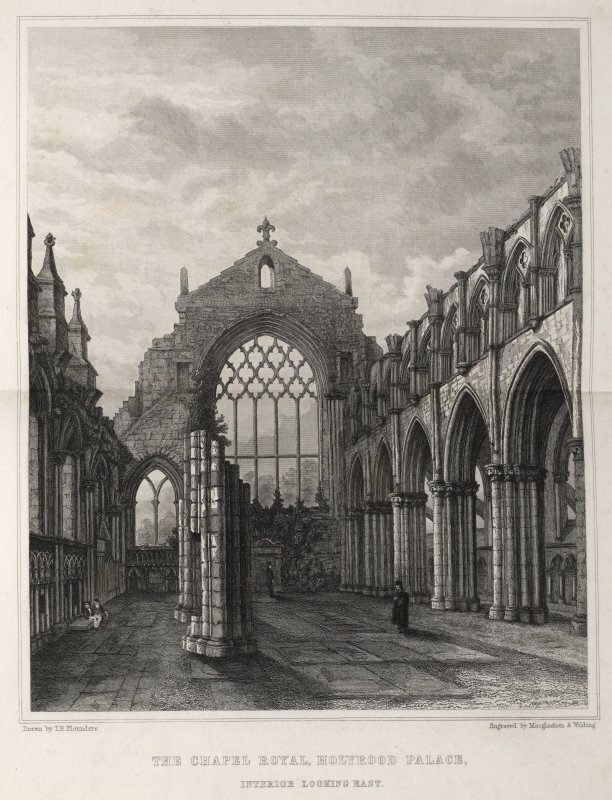 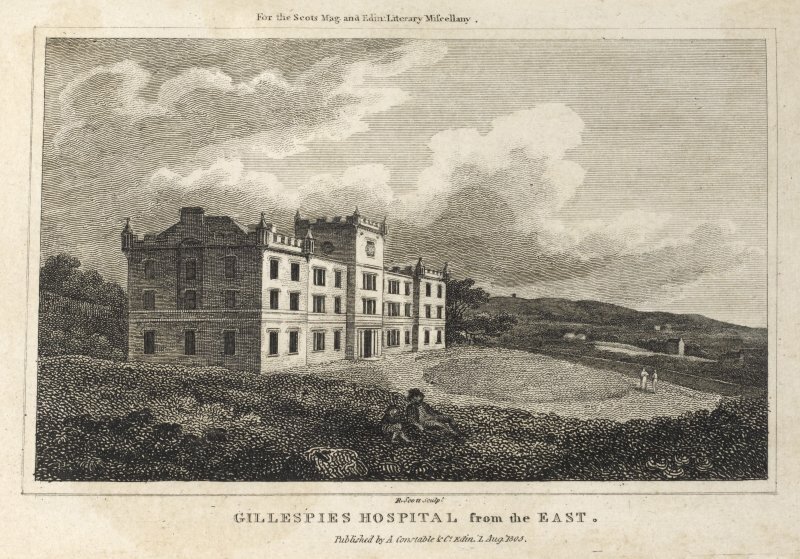 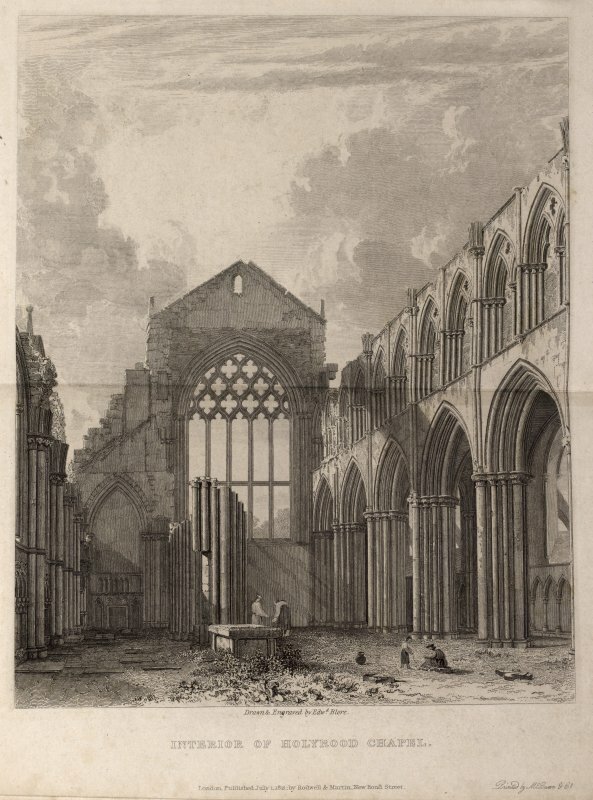 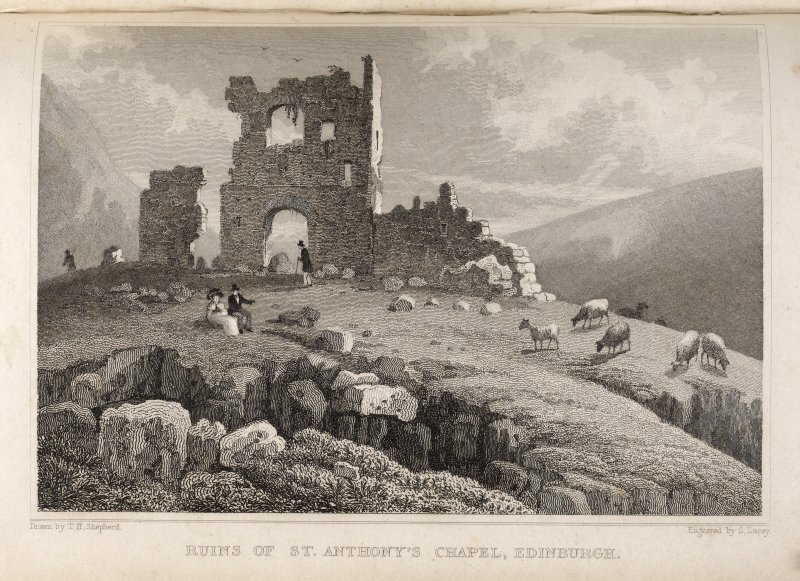 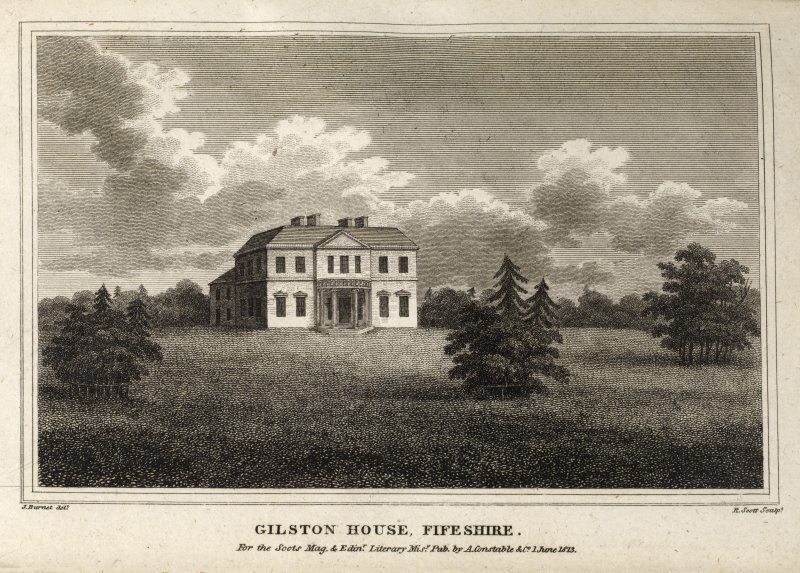 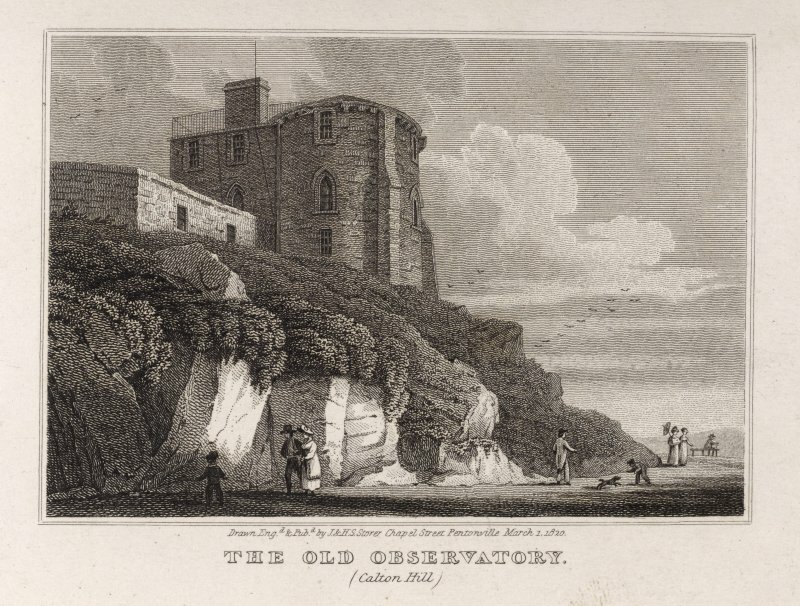 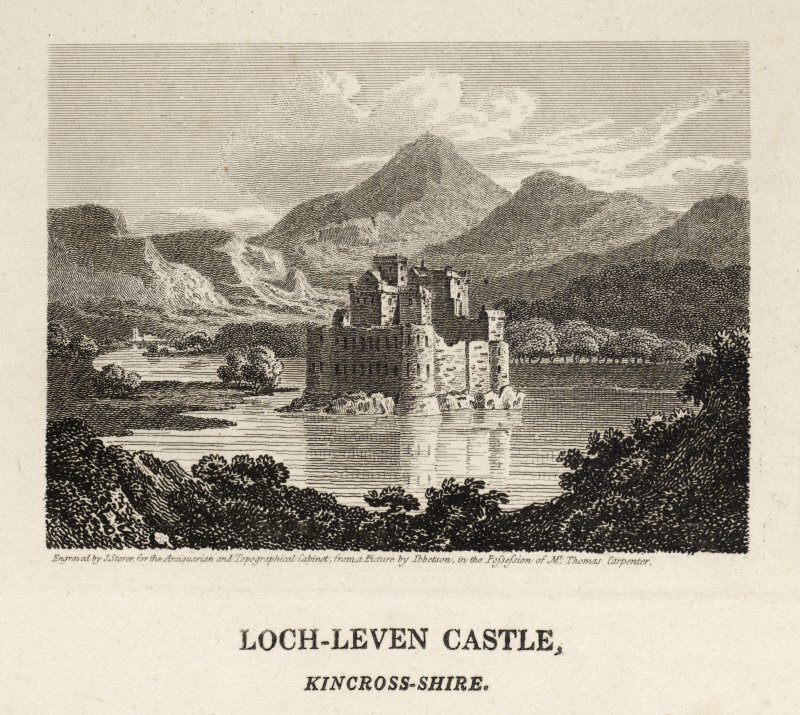 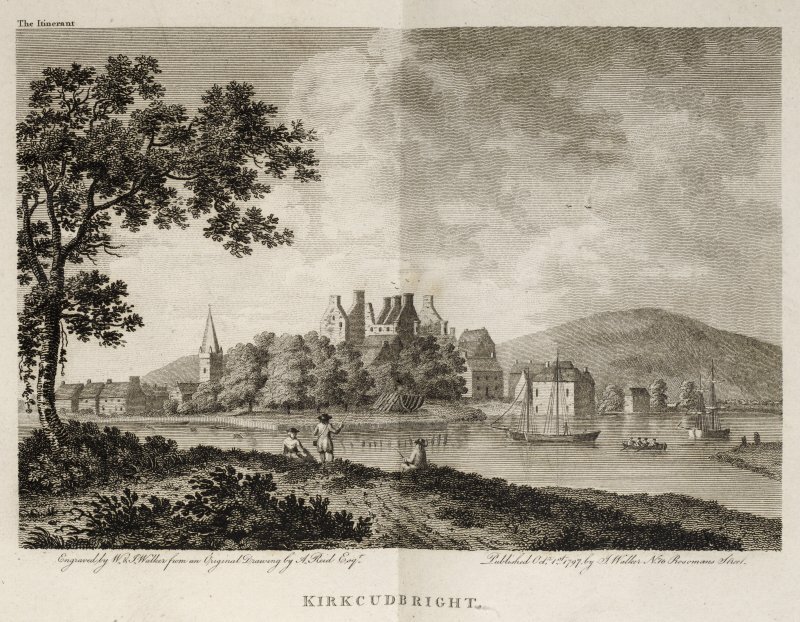 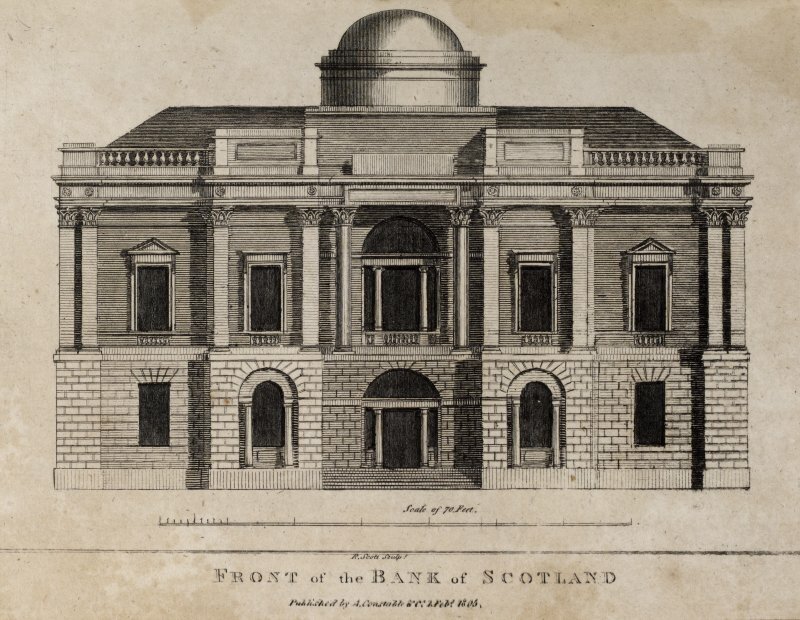 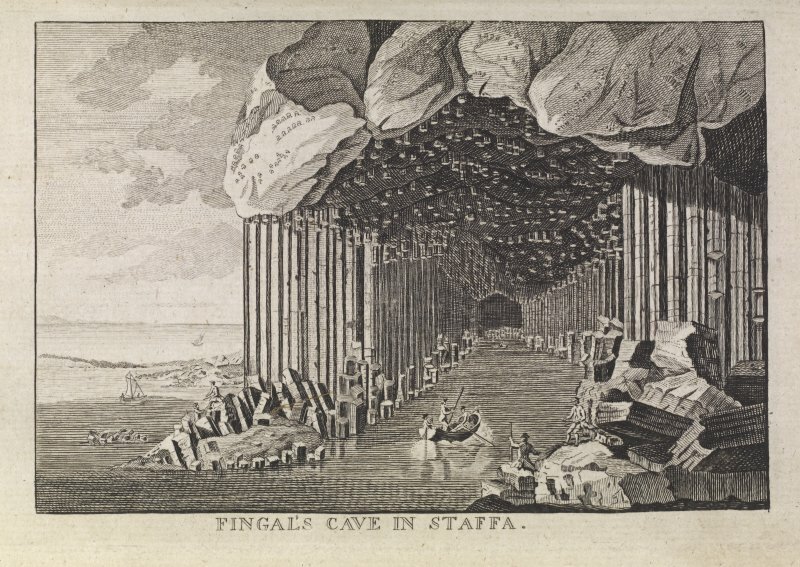 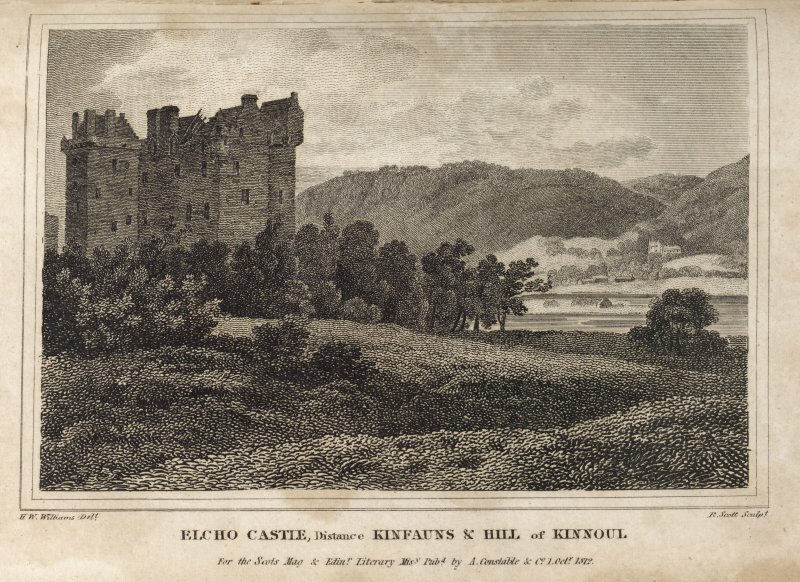 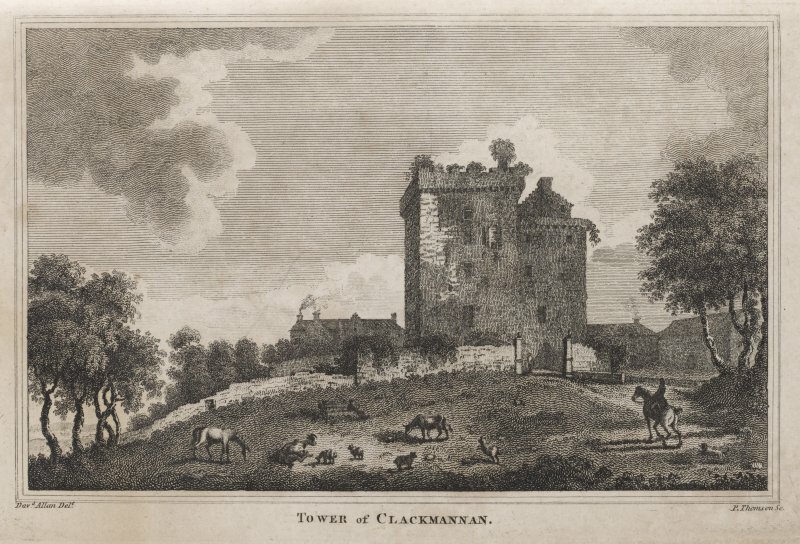 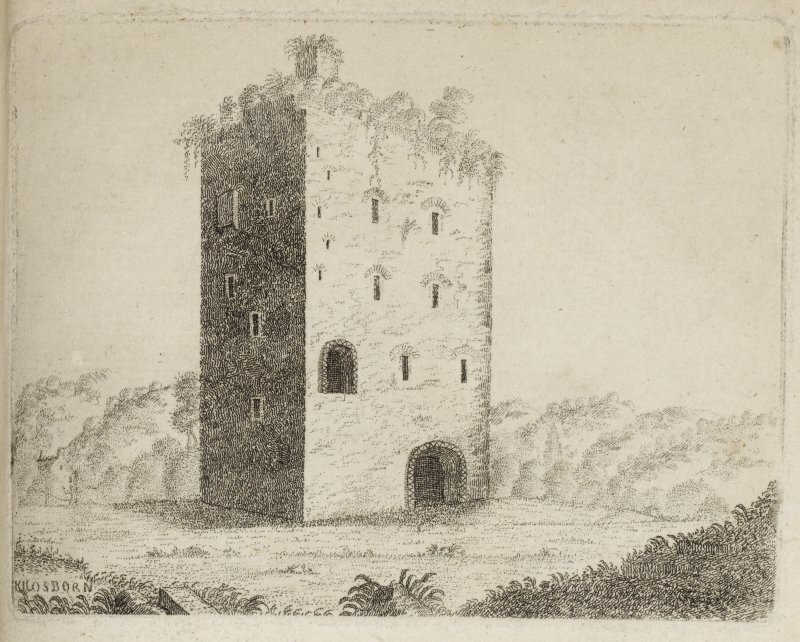 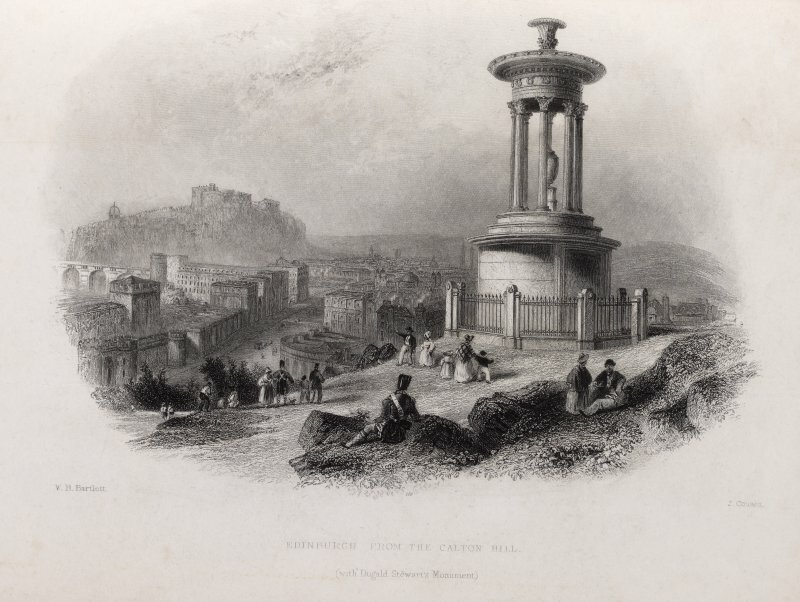 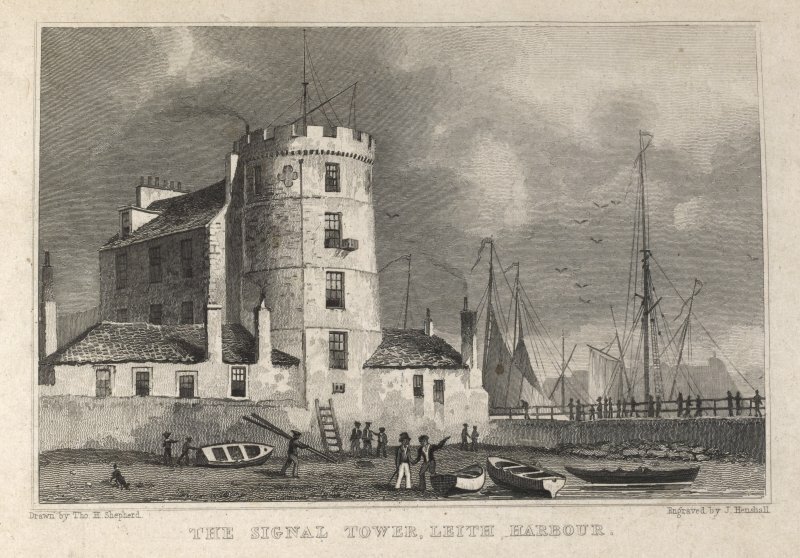 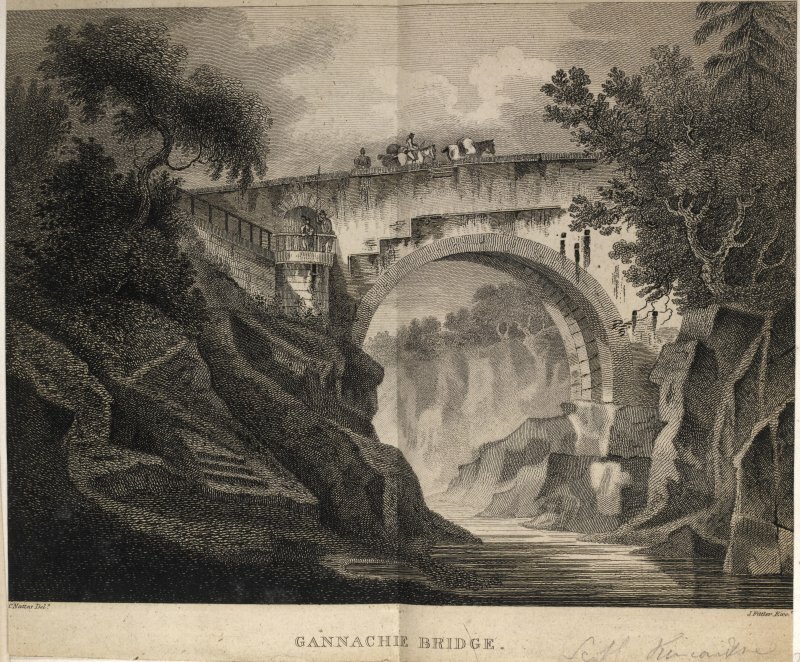 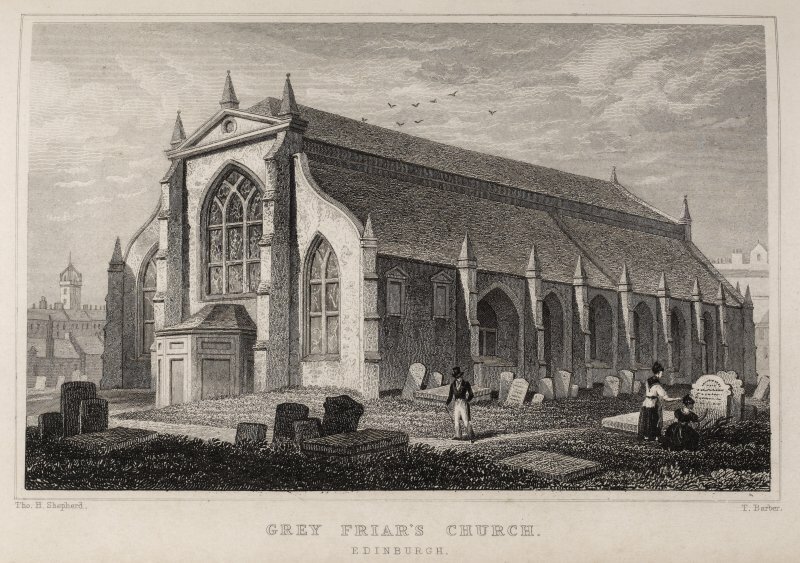 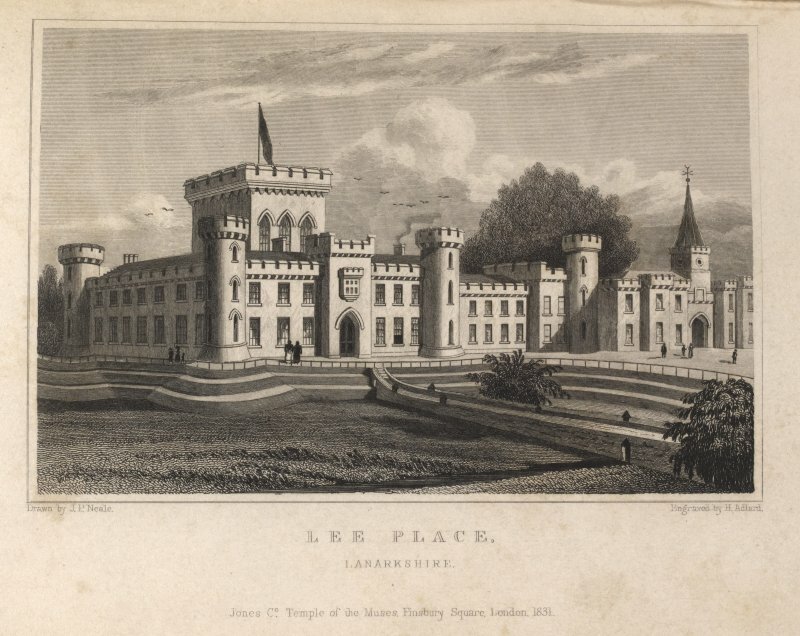 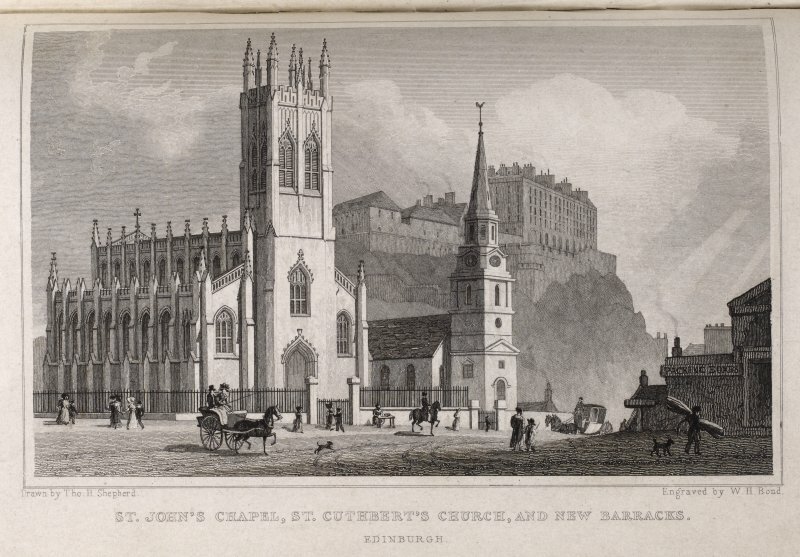 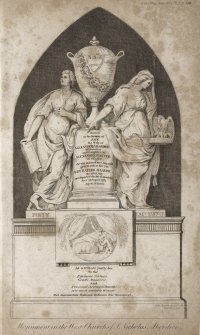 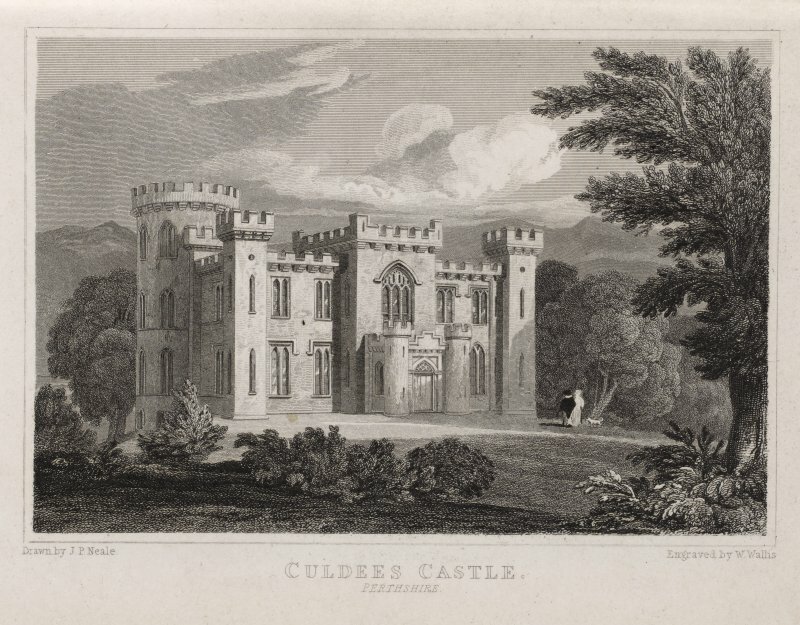 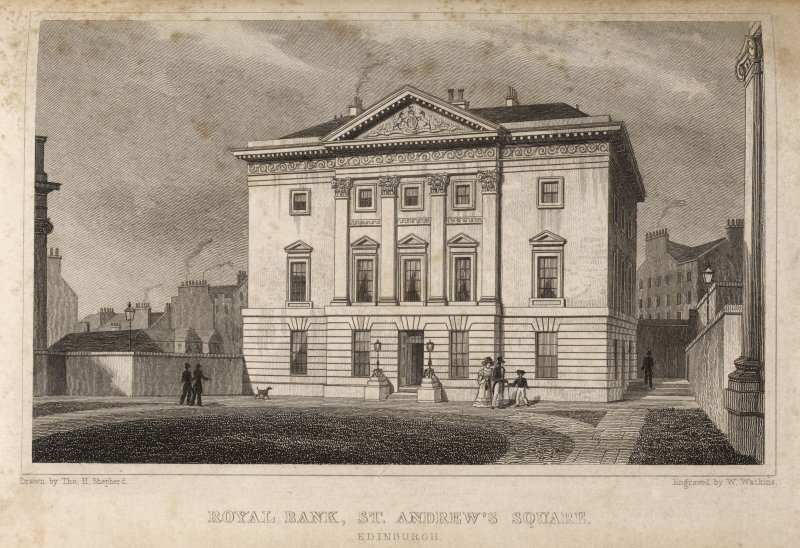 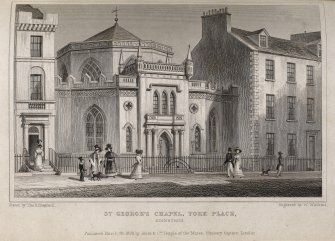 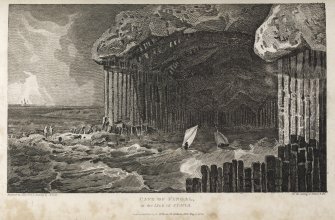 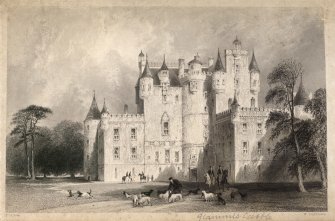 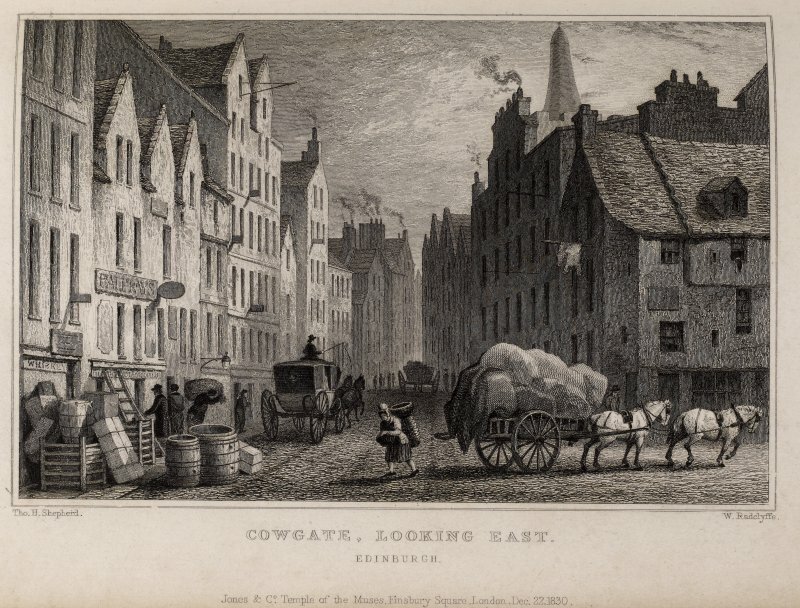 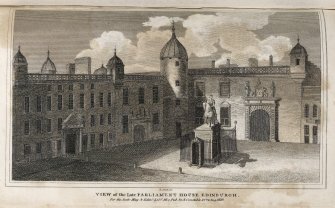 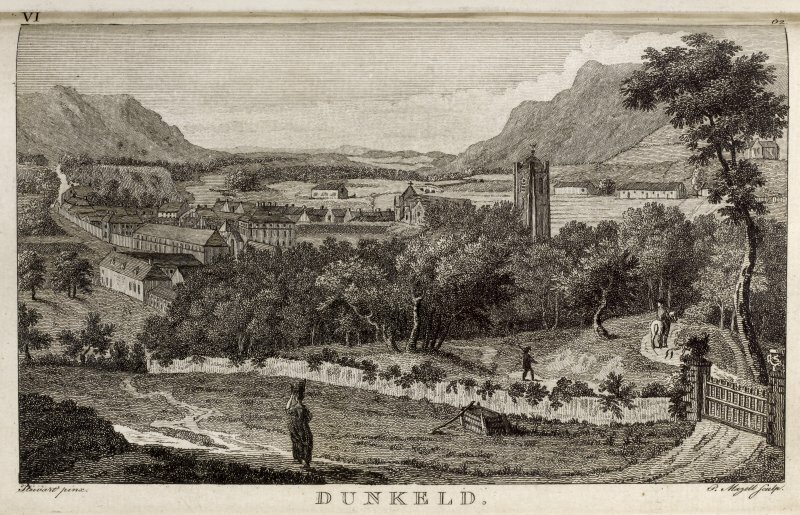 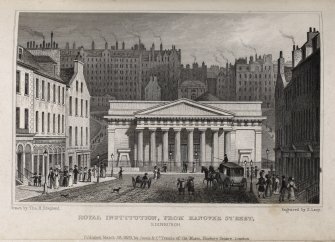 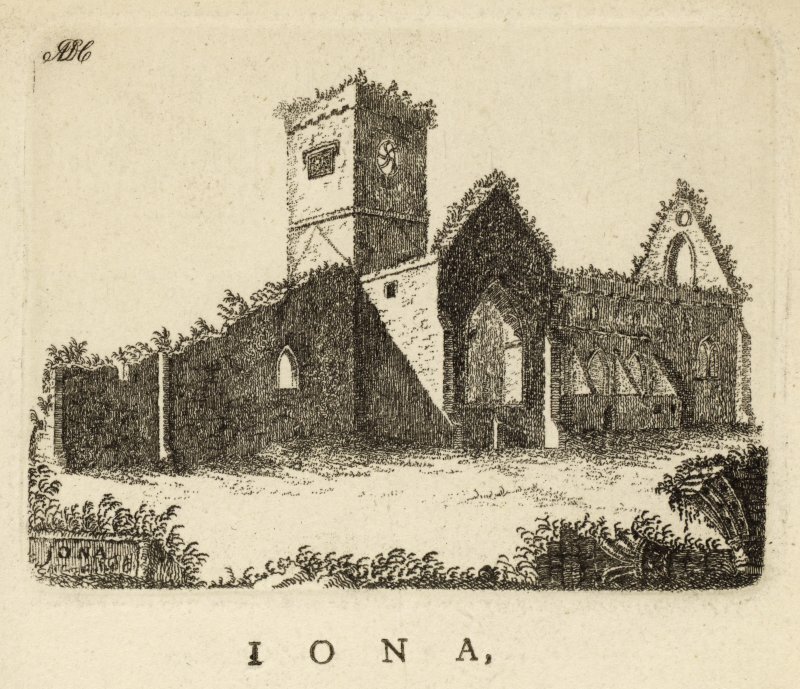 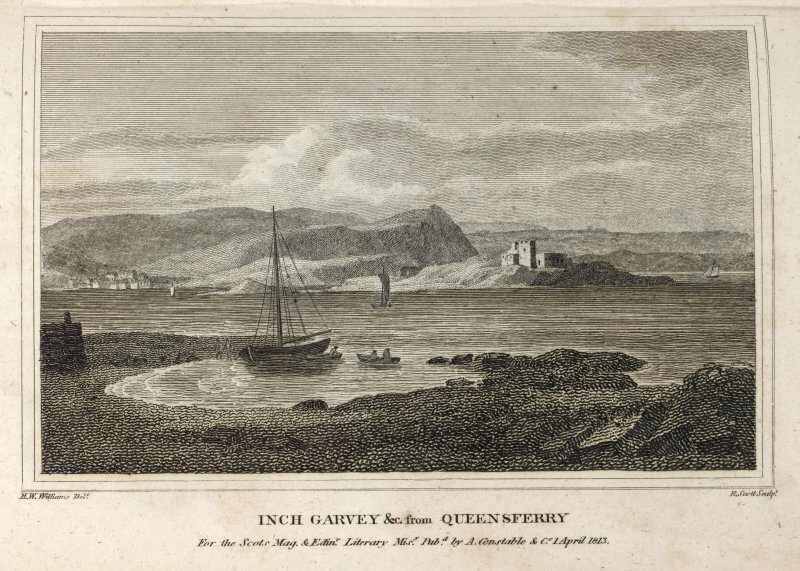 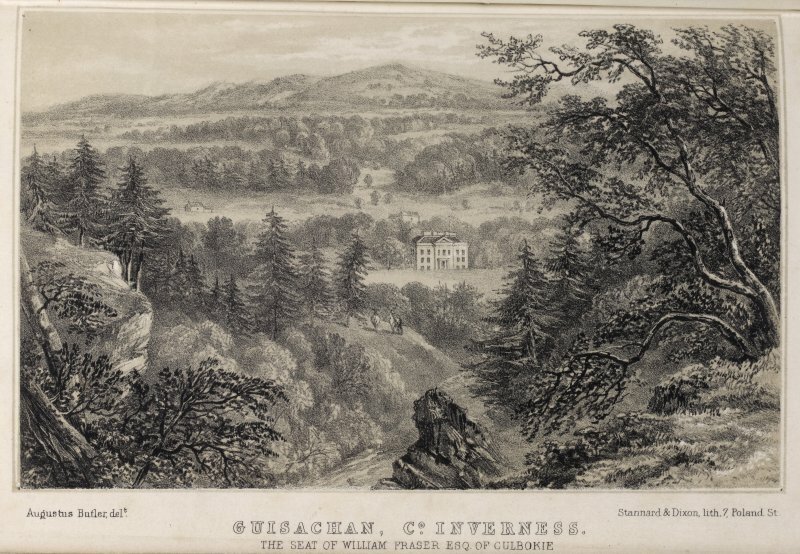 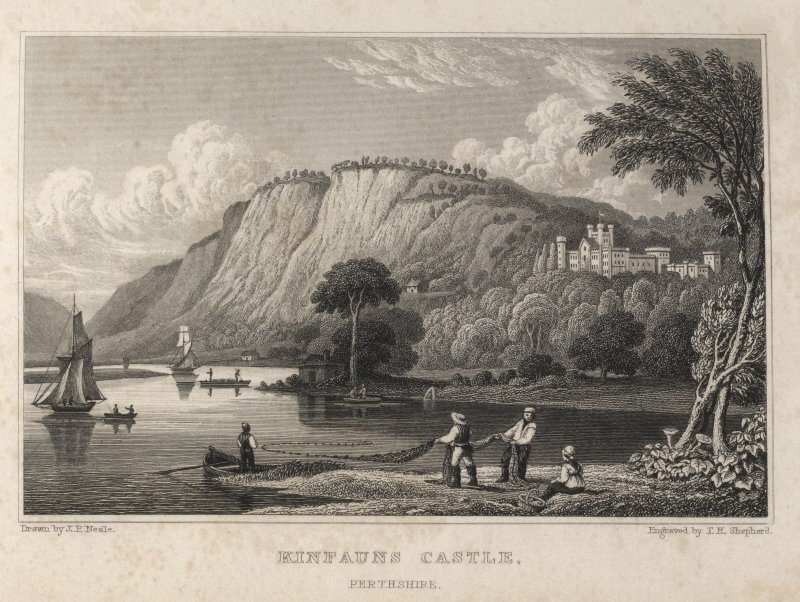 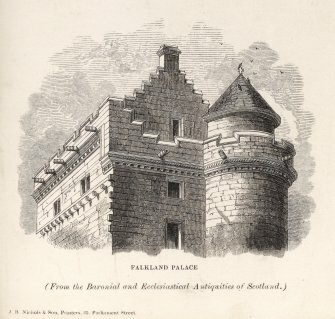 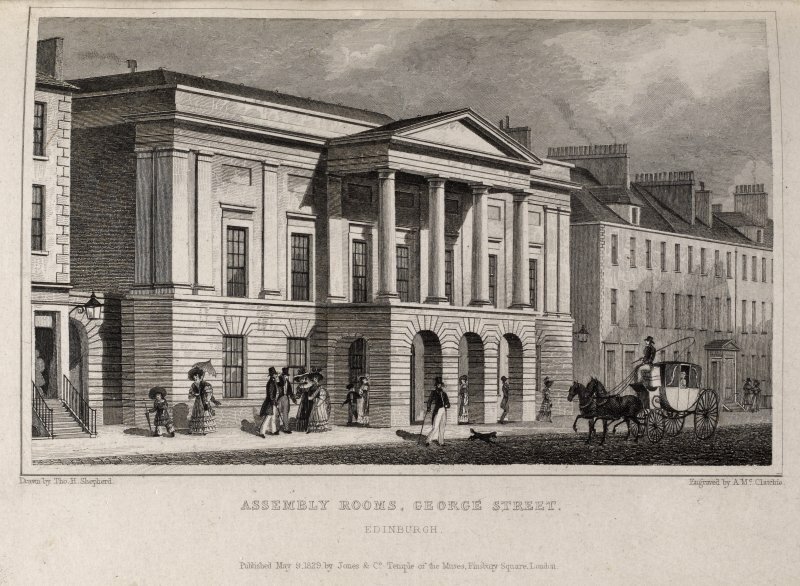 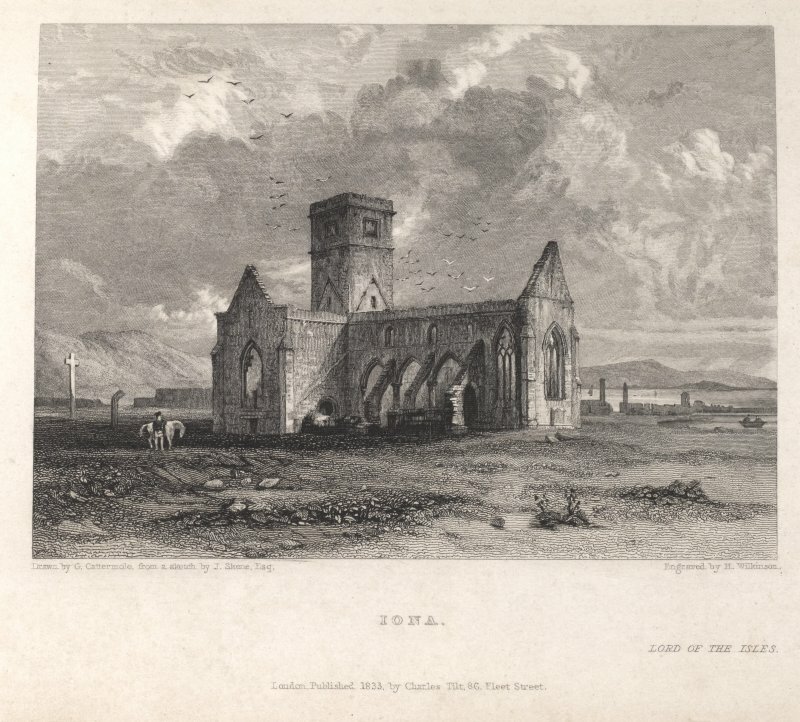 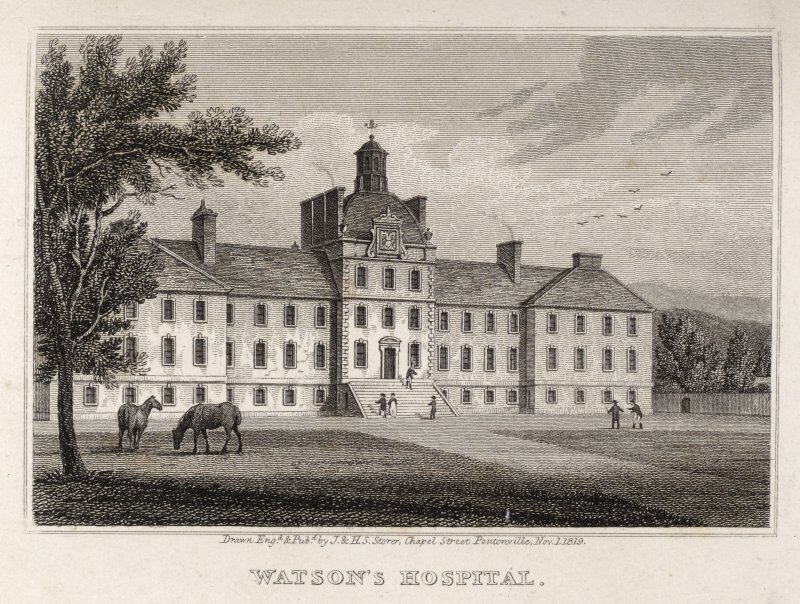 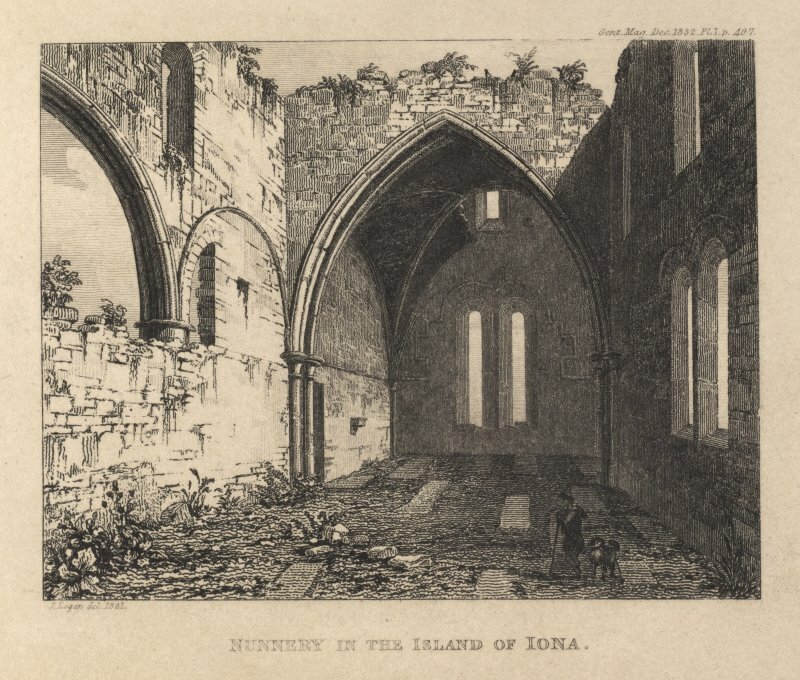 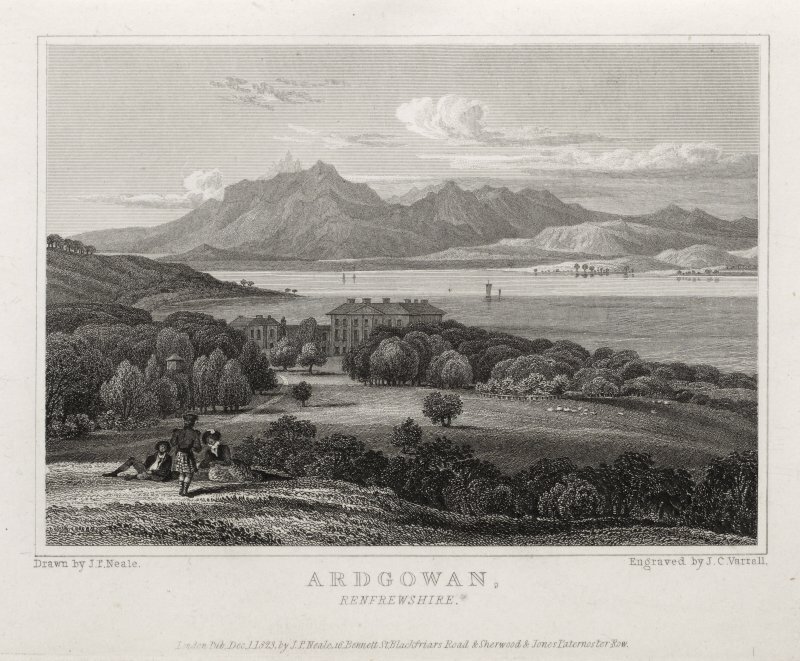 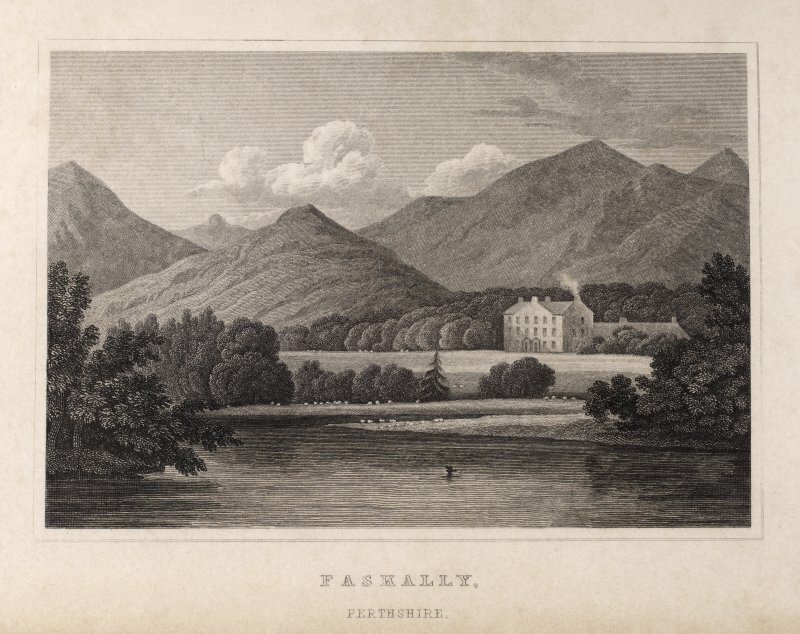 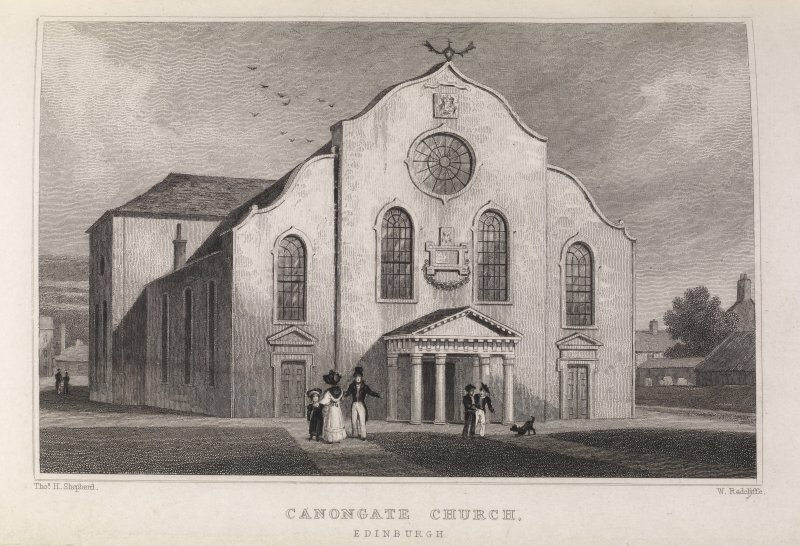 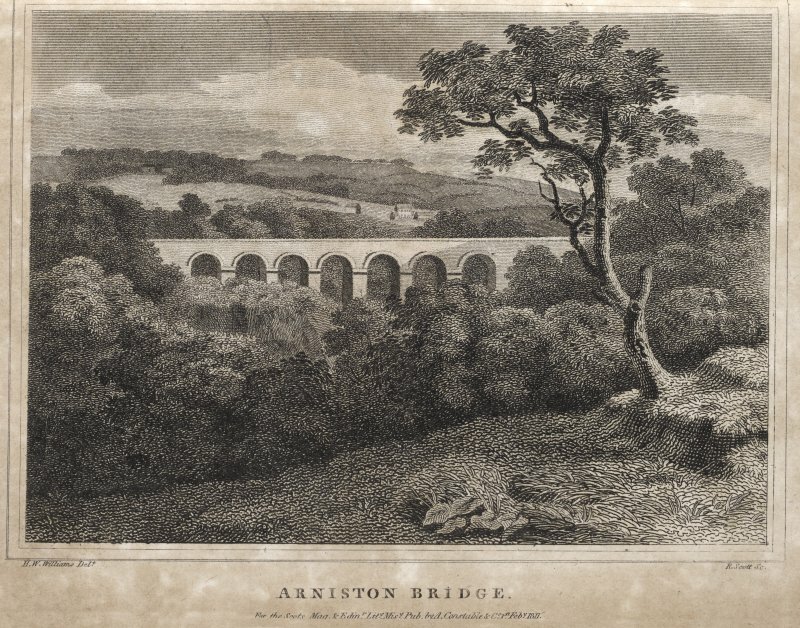 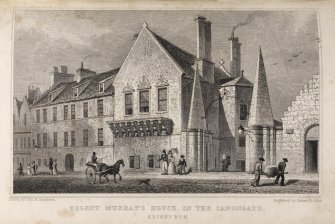 Historic Environment Scotland (HES) has an ongoing programme to digitise archive material and all the engravings in this volume are now available online and can also be seen in this gallery. 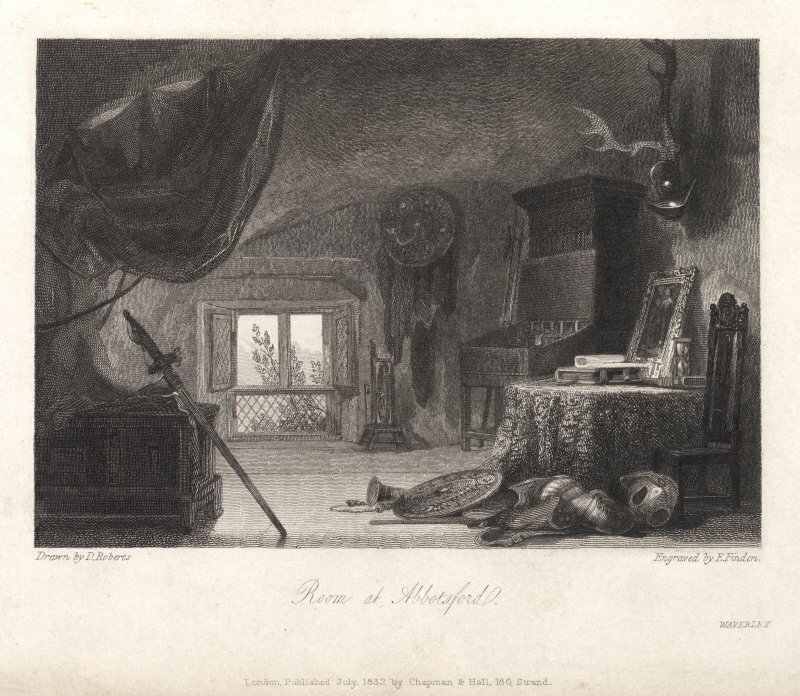 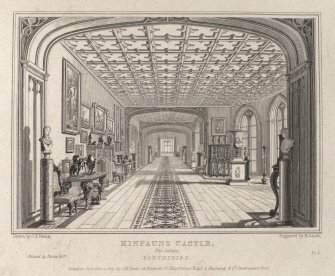 Engraving of a room at Abbotsford. 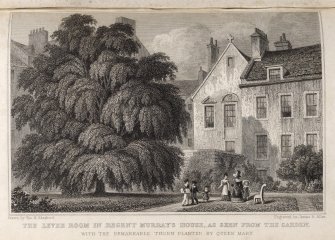 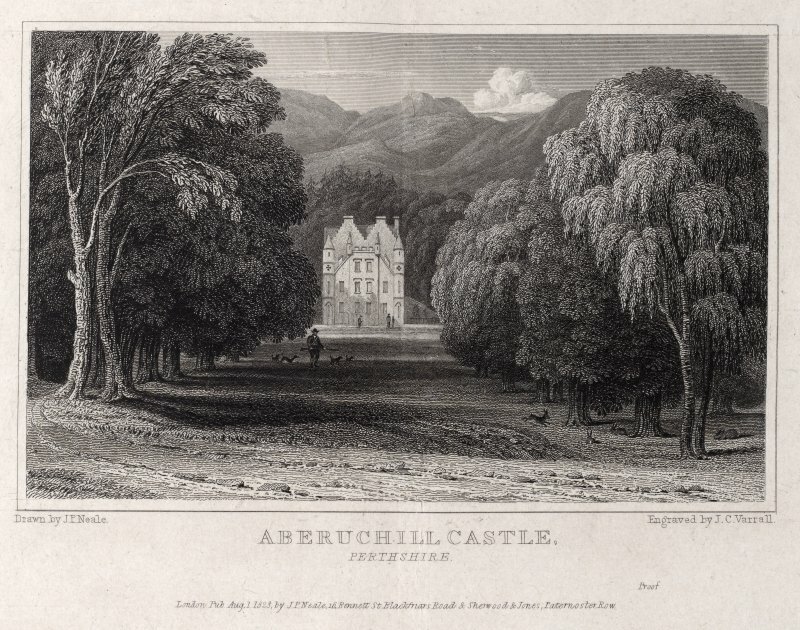 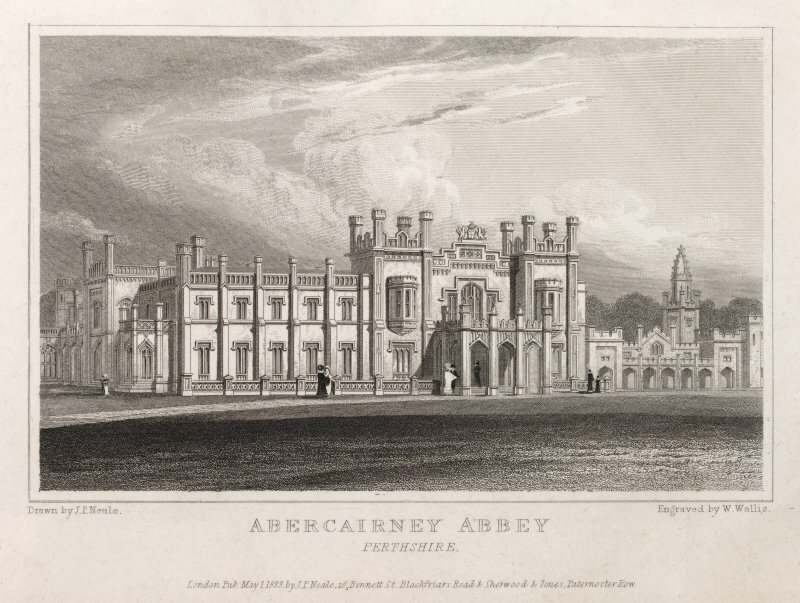 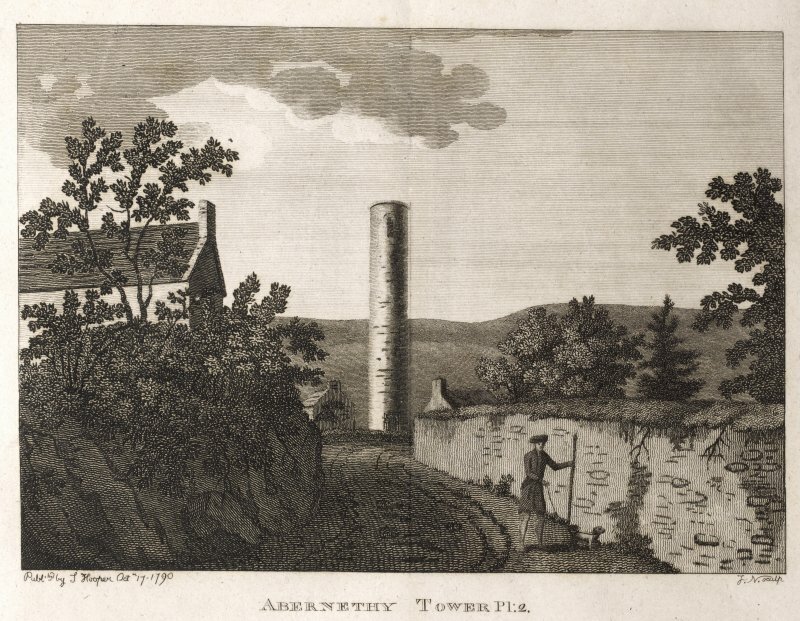 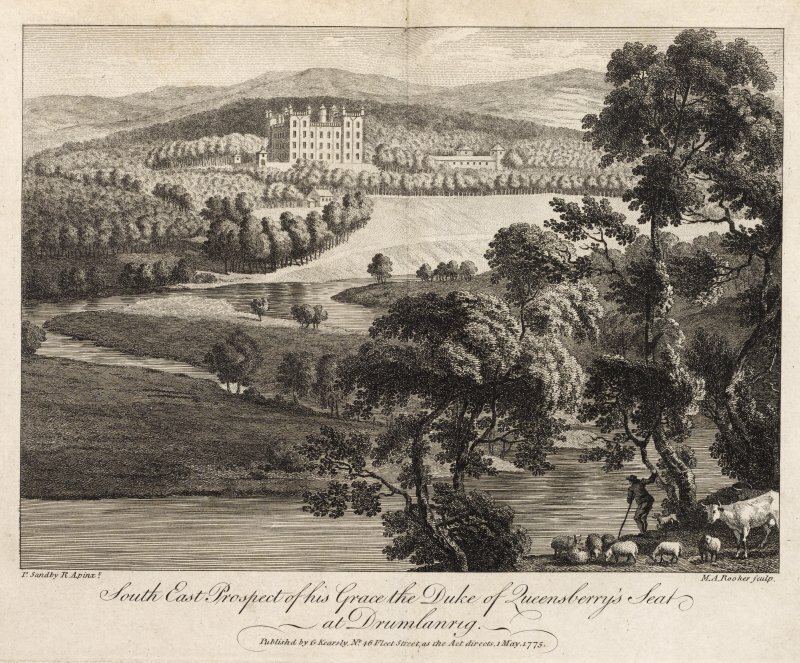 Engraving showing a general view of Abercairny Abbey. 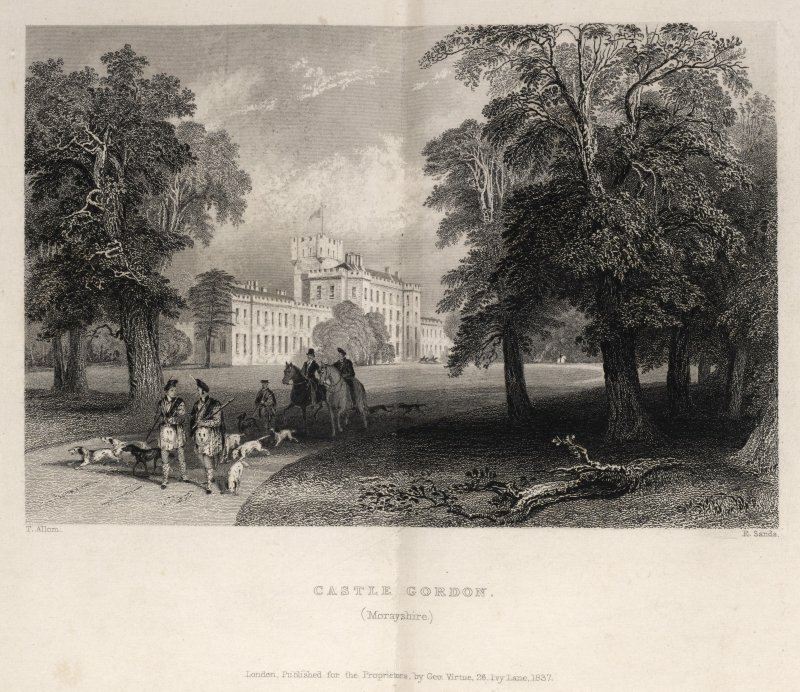 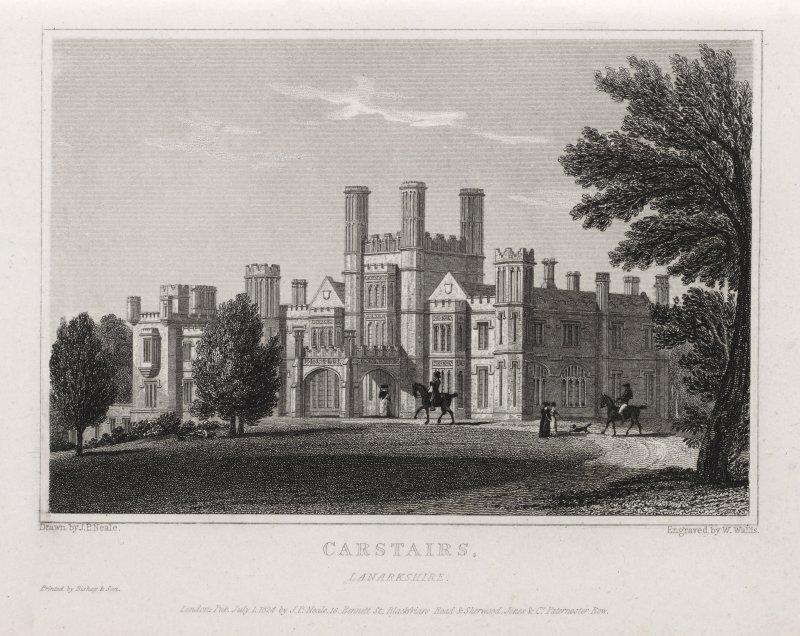 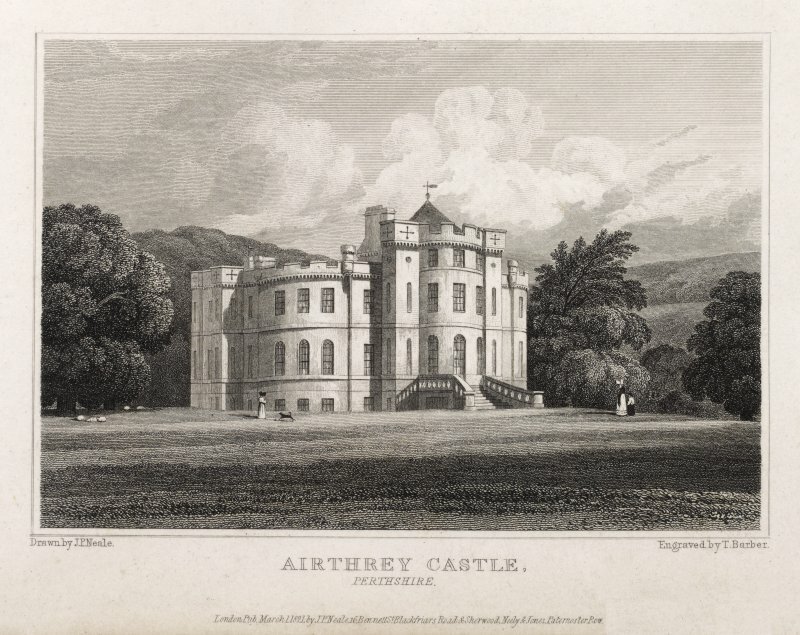 Engraving of Airthrey Castle from the lawns. 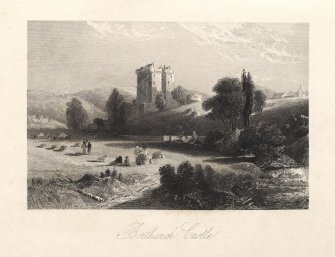 Titled 'Airthrey Castle, Perthshire. 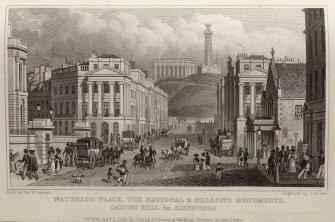 London, published March 1821 by J. P. Neale, 16 Bennett St., Blackfriars Road & Sherwood, Neely & Jones, Paternoster Row. 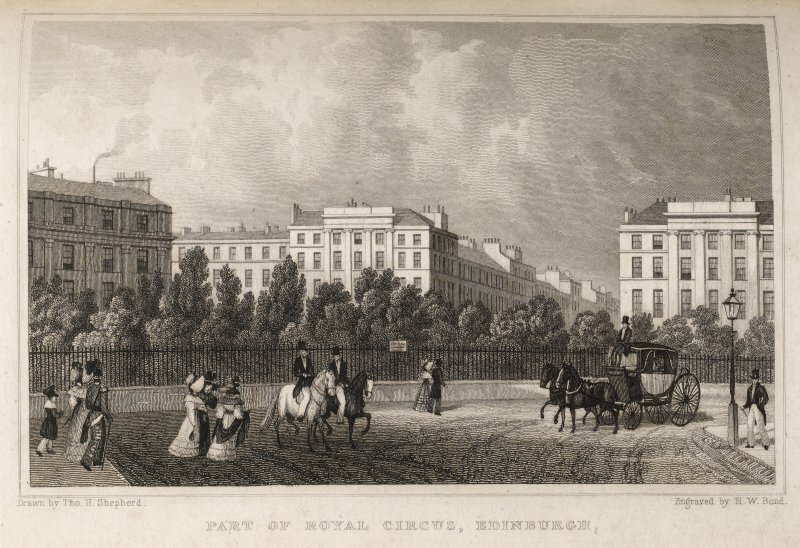 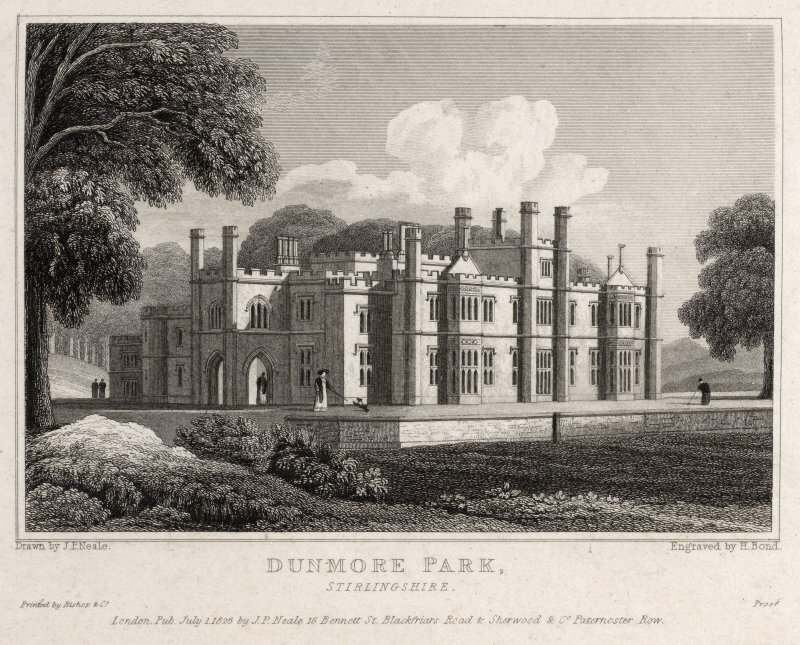 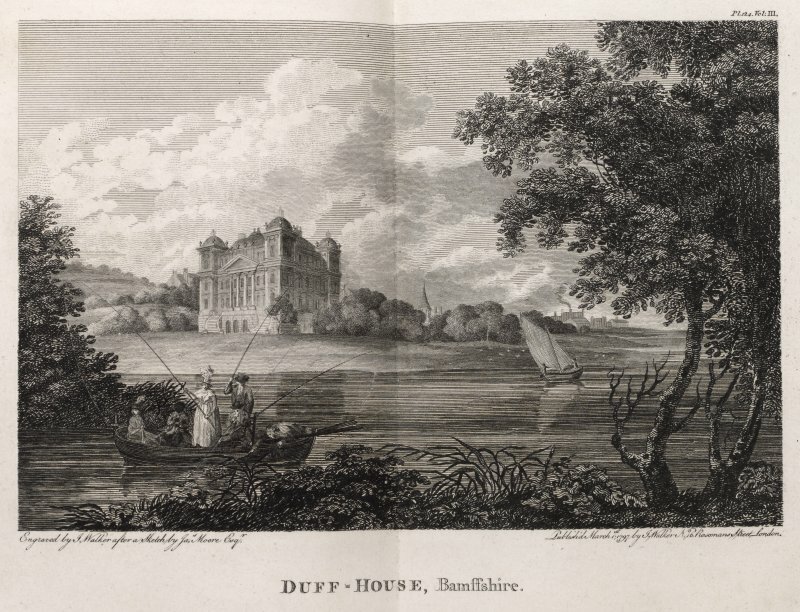 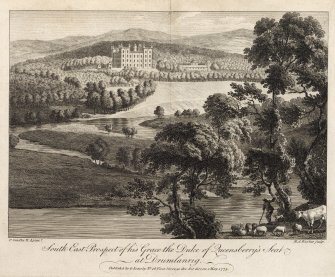 Engraving of Arbuthnott House and grounds. Drive crosses small bridge on left foreground. 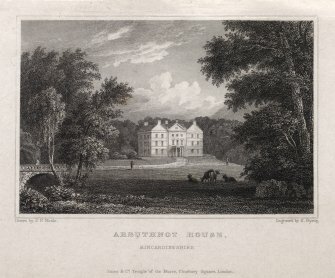 Titled 'Arbuthnot House, Kincardineshire. 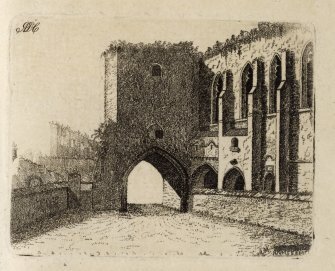 Drawn by J.P.Neale. 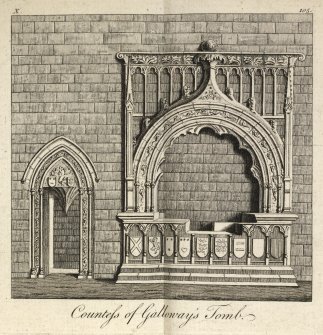 Engraved by E. Byrne. 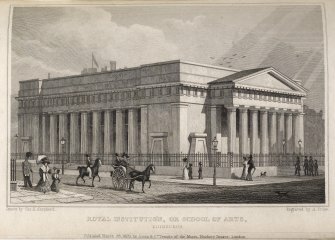 Jones & Co. Temple of the Muses, Finsbury Square, London. Engraving of Ardgowan House in its landscape, seen from the south. 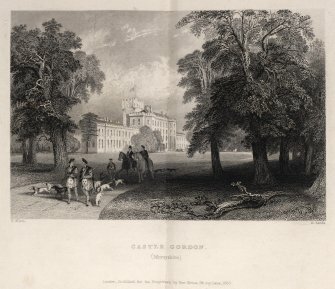 Titled 'Ardgowan, Renfrewshire. 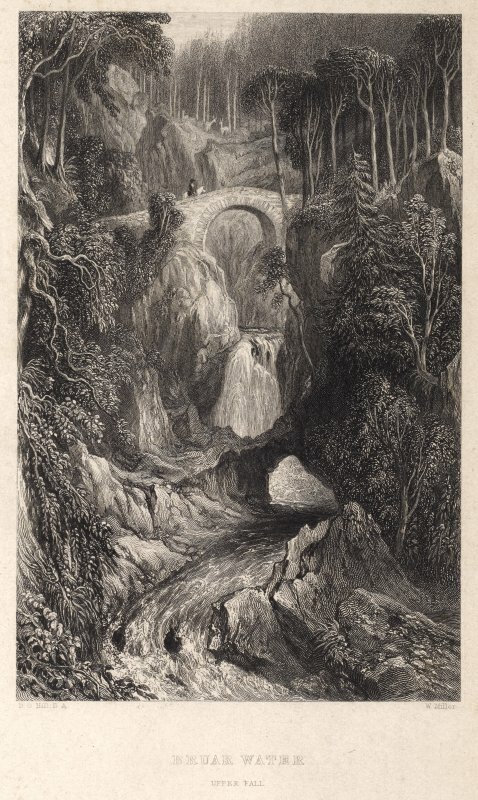 Drawn by J. P. Neale. Engraved by J. C.Varrell. 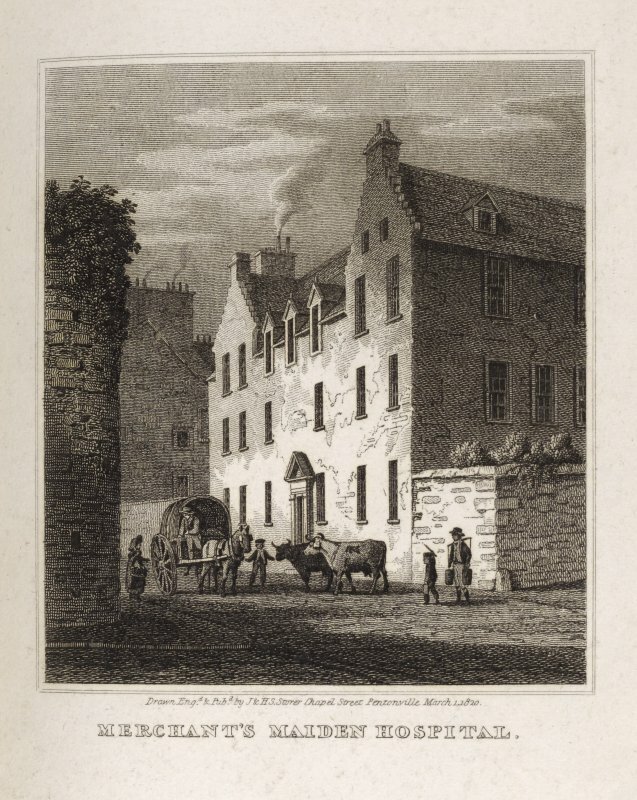 London, Pub.Dec 1 1823 by J. P. Neale, 16 Bennett St. Blackfriars Road & Sherwood & Jones, Paternoster Row. 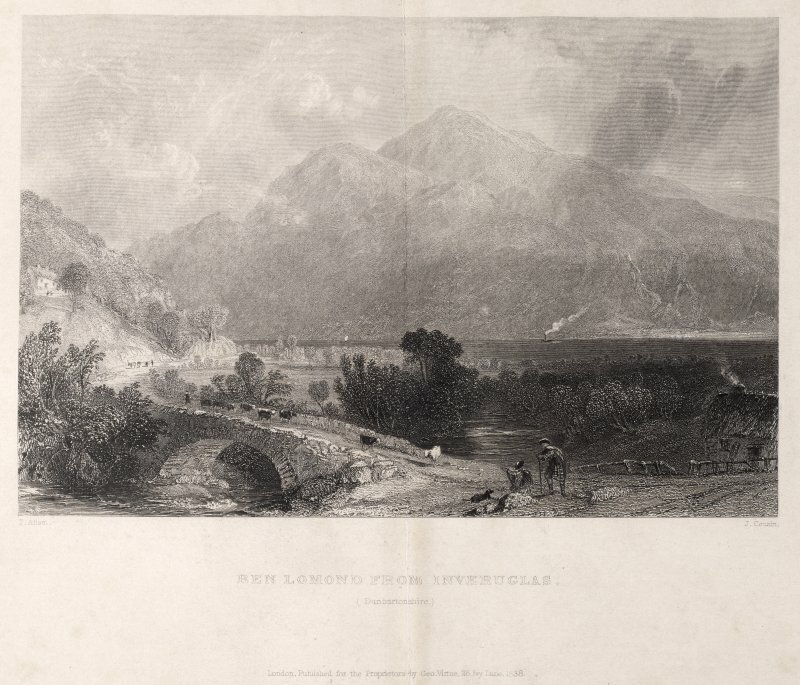 View of Ben Venue and loch with boats and figures. Titled ' Ben Venue. 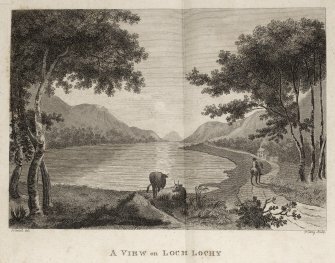 Lady of the Lake. 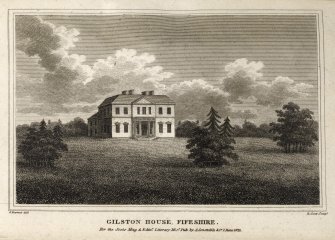 Drawn by G. F. Robson. 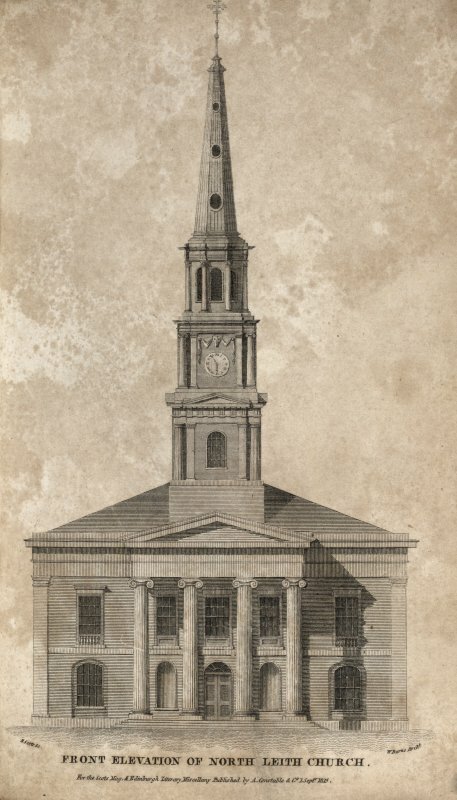 Engraved by A. W. Graham. 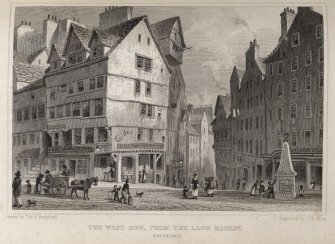 Londoon pub. 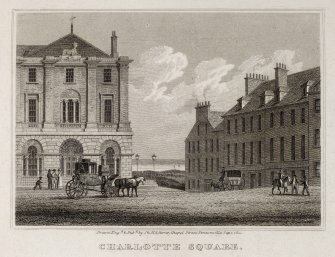 1833 by Charles Tilt, 86 Fleet Street. Engraving of Berwick Bridge with City Walls & town on left. 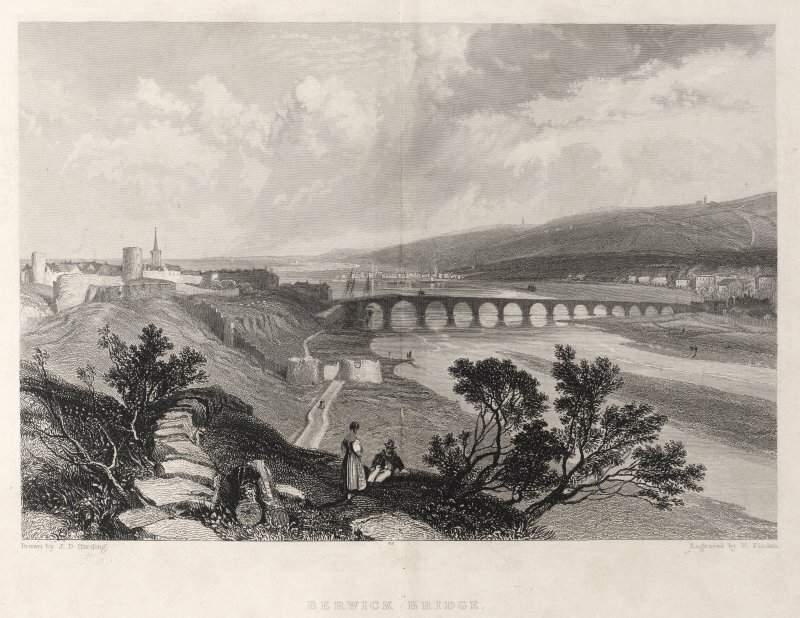 Titled 'Berwick Bridge. 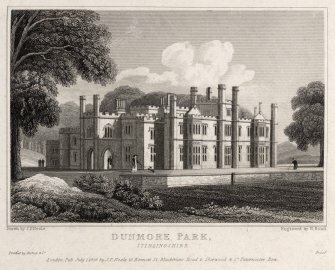 Drawn by J.D. Harding. 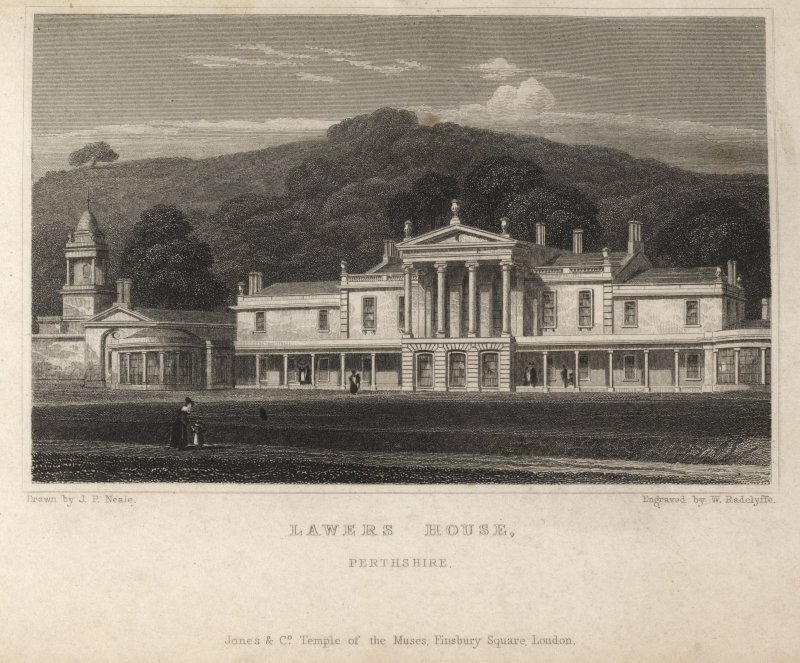 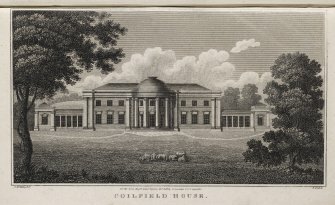 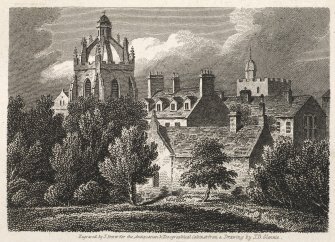 Engraved by J. Finden. 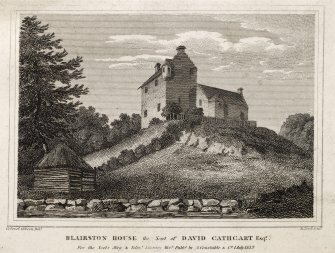 Engraving of Blairquhan House from lawns. 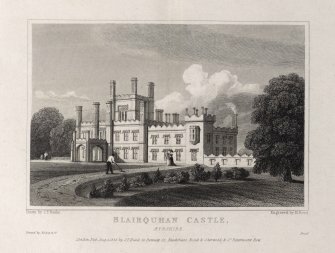 Titled 'Blairquhan Castle, Ayrshire. 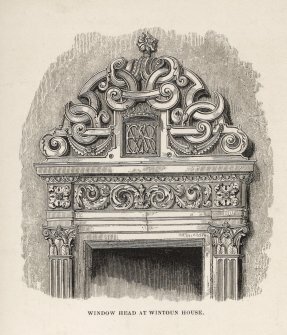 Drawn by J. P. Neale. 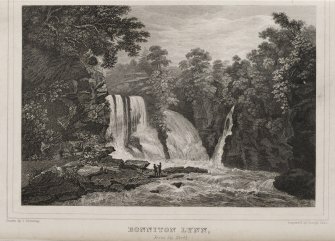 Engraved by H. Bond. 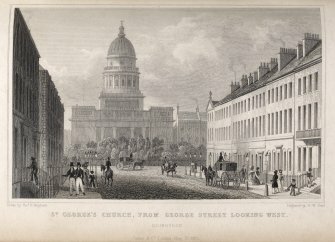 Printed by Bishop & Co. 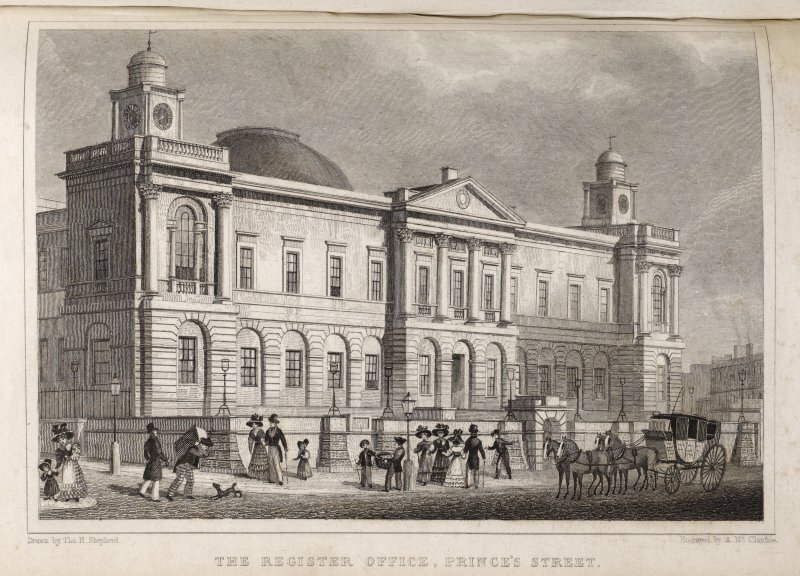 Proof. London Pub. 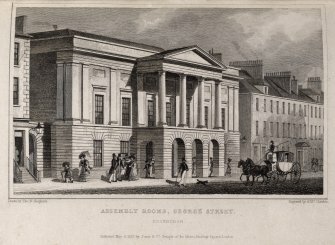 August 1826 by J. P. Neale, 16 Bennett St. Blackfriars Road & Sherwood & Co. Paternoster Row. 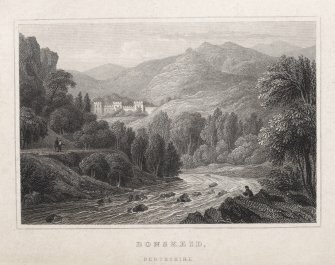 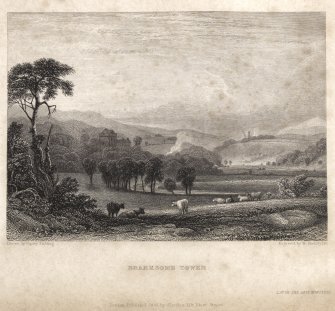 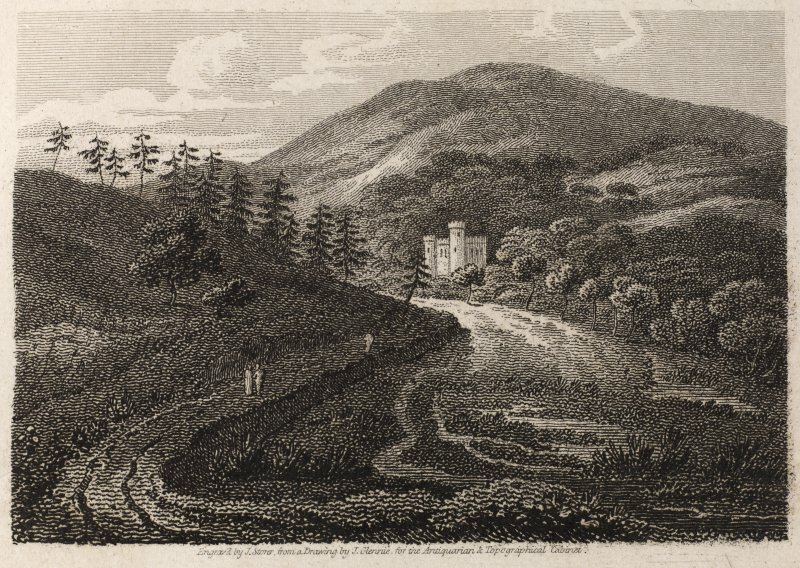 Engraving of Bonskeid House in a landscape. Titled 'Bonskeid, Perthshire. 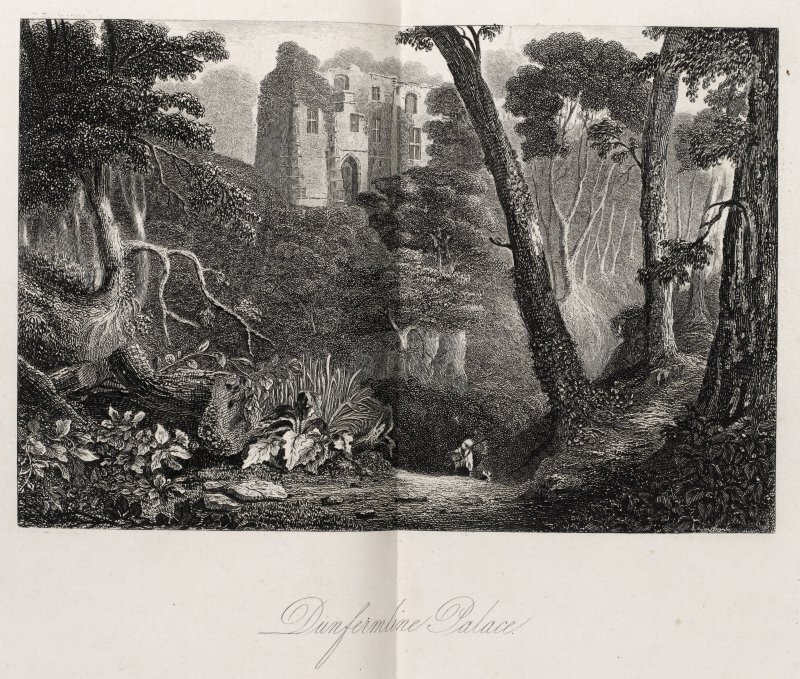 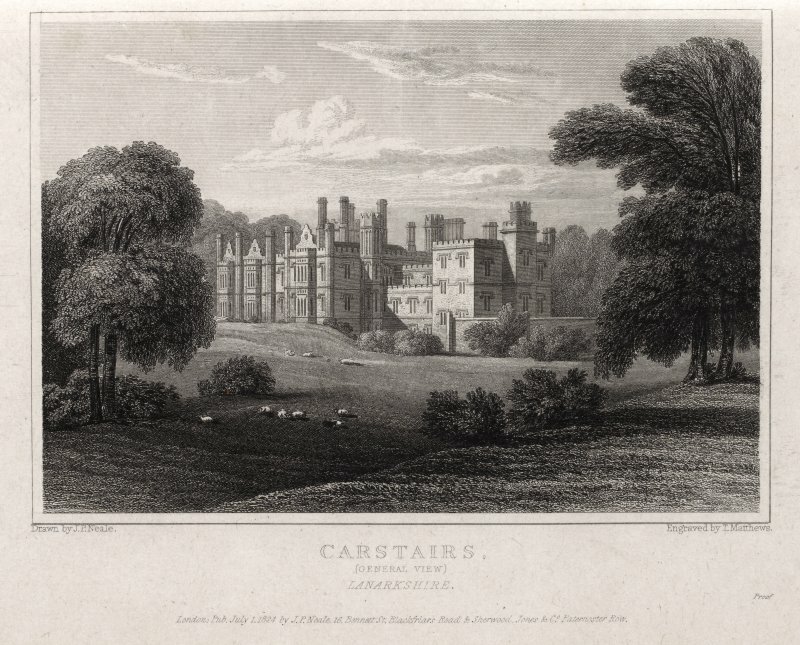 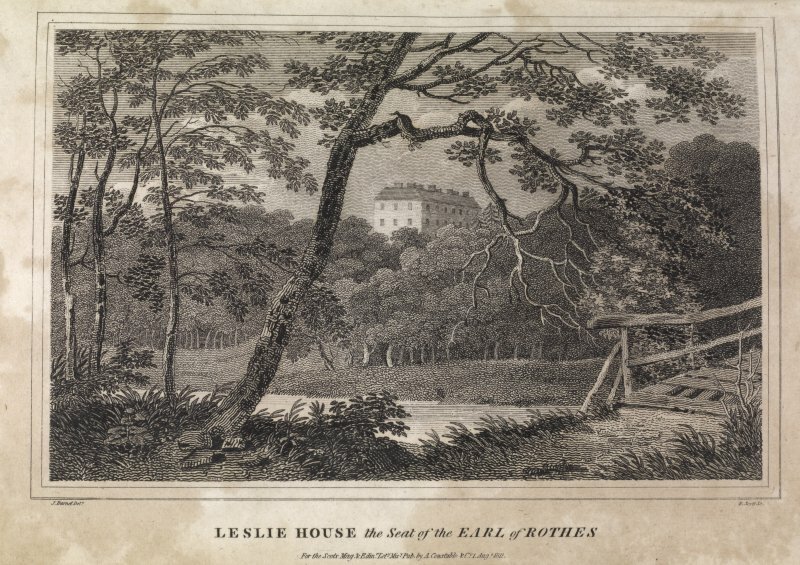 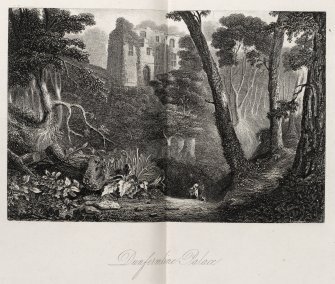 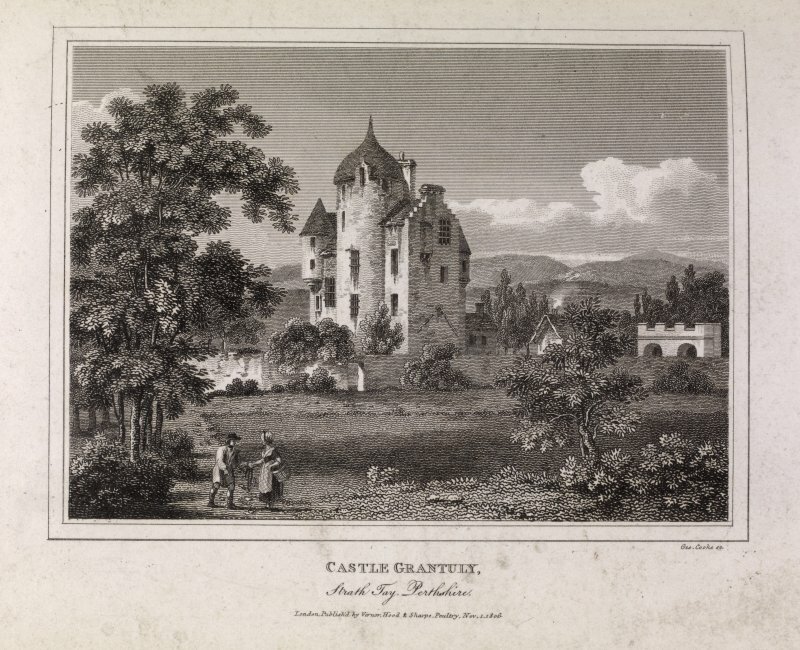 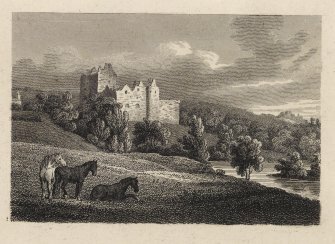 Engraving of Crathes Castle amid trees. 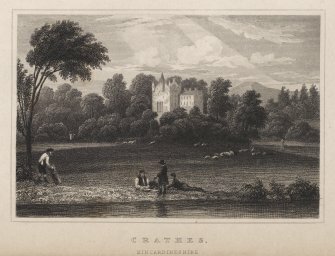 Titled: 'Crathes Kincardineshire. 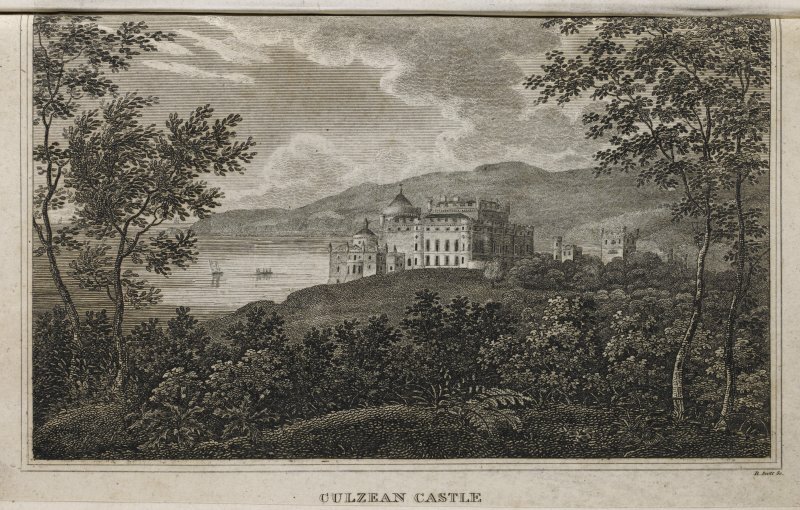 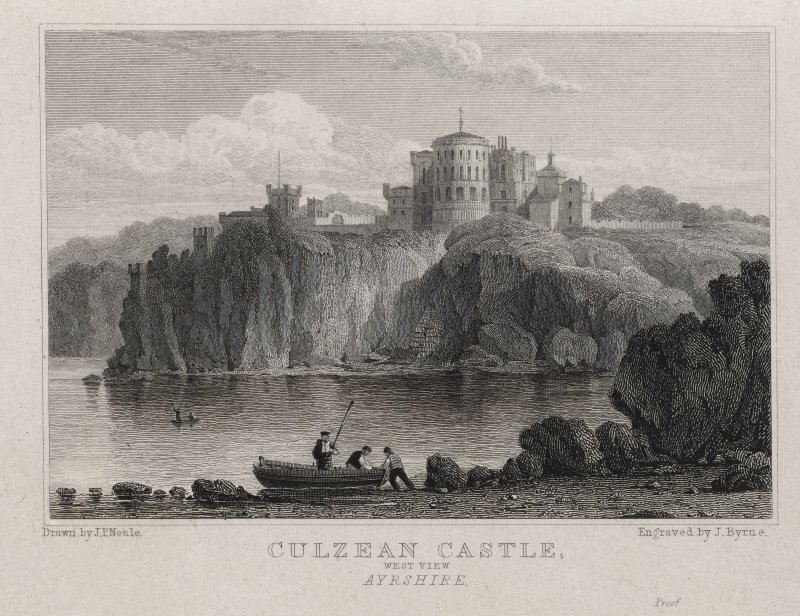 Engraving of Culzean Castle & outbuildings on clifftop from south. 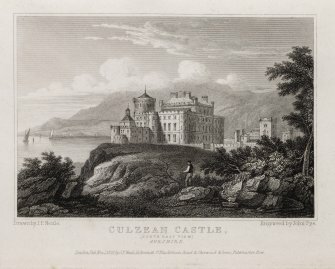 Titled: 'Culzean Castle (South East view) Ayrshire, Drawn by J.P.Neale. 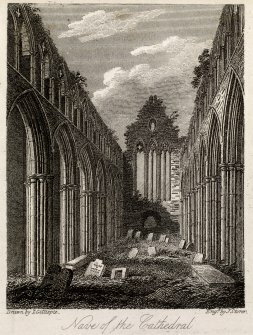 Engraved by John Pye. 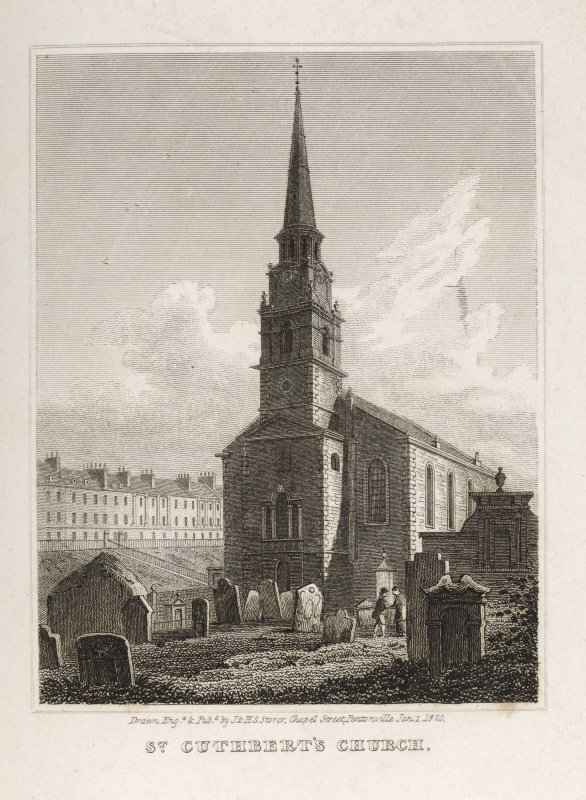 London, published Nov.1st 1823, by J.P.Neale, 16 Bennett St., Blackfriars Road, & Sherwood & Jones, Paternoster Row. Engraving of Culzean Castle from the sea. Titled: 'Culzean Castle West View, Ayrshire. Drawn by J.P.Neale. 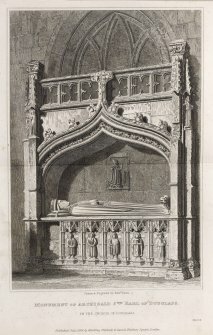 Engraved by J. Byrne. London Pub. 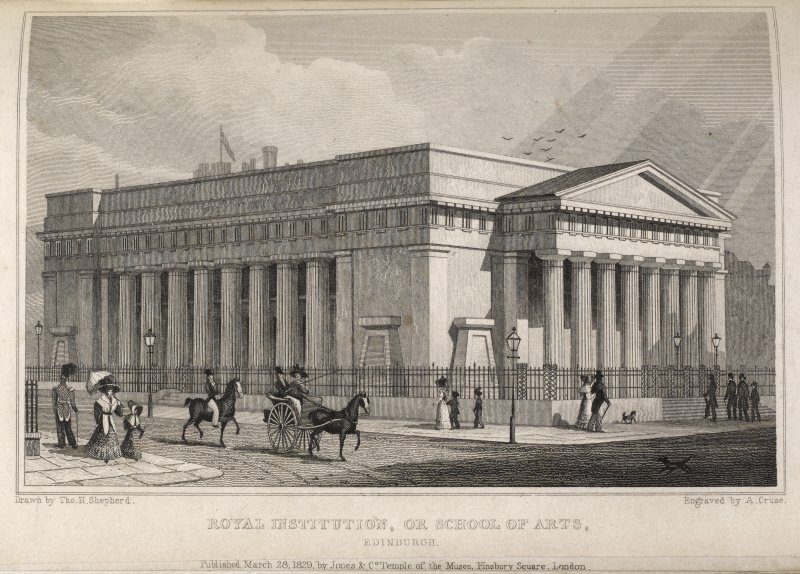 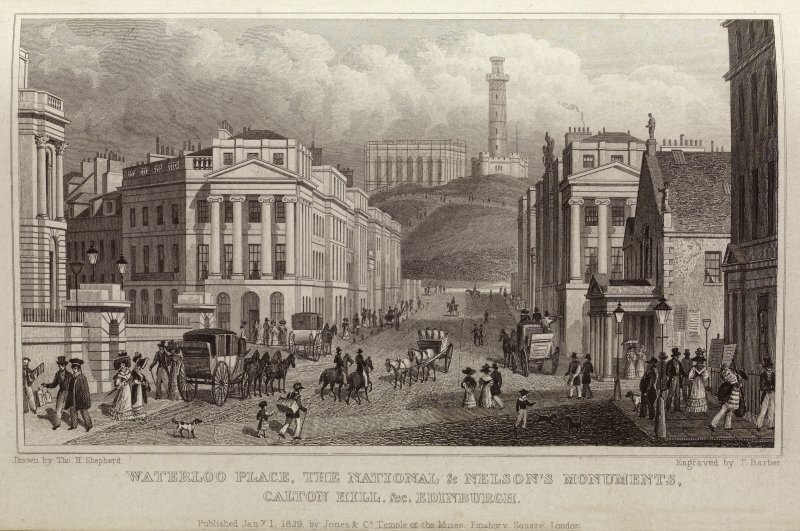 Aug.1st 1823 by J.P.Neale, 16 Bennett St., Blackfriars Road & Sherwood & Jones, Paternoster Row'. 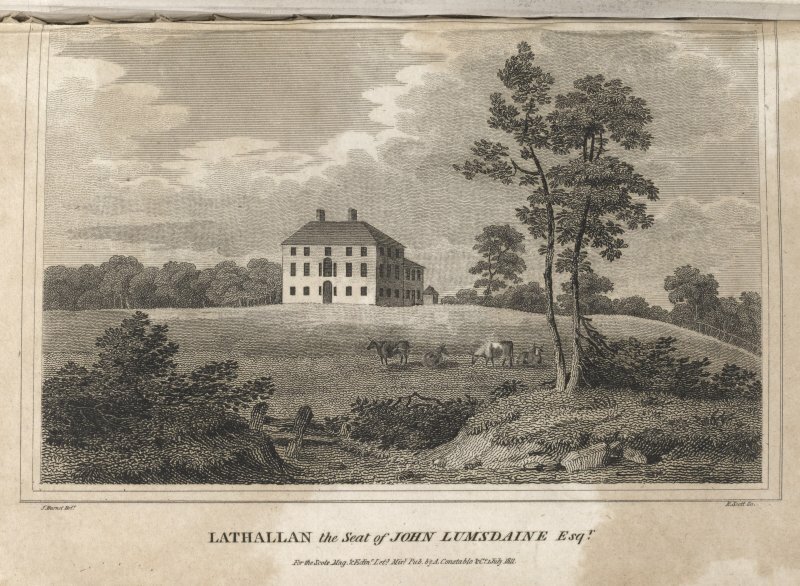 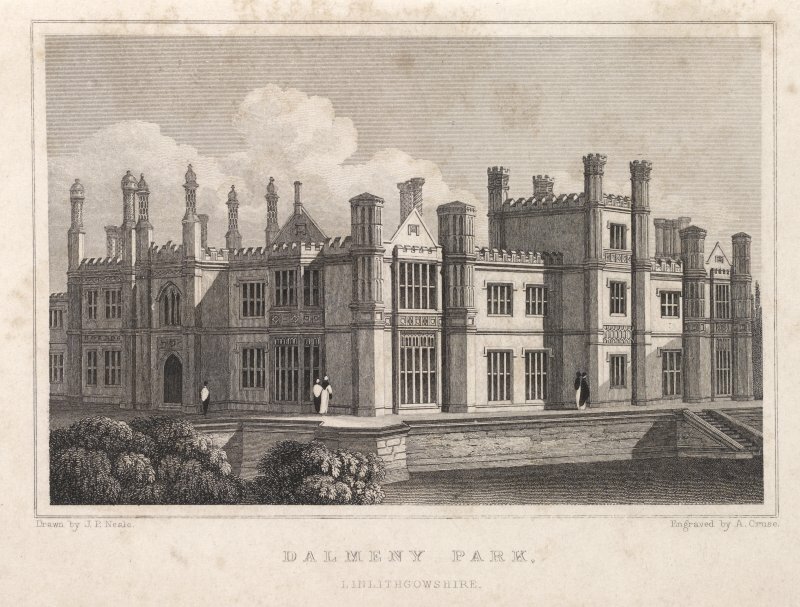 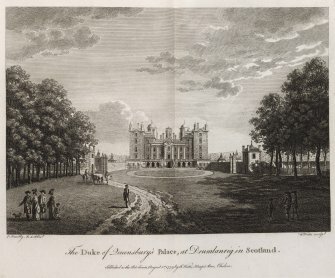 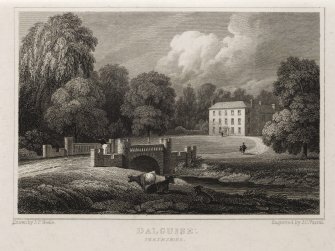 Engraving of Dalbeth House, showing 2 & 3 - storey house surrounded by lawns & trees. 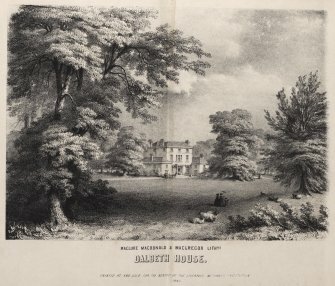 Titled: 'Dalbeth House. 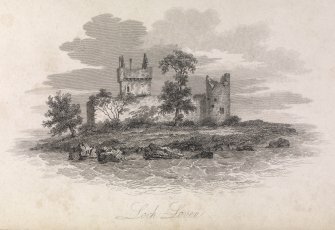 Maclure, Macdonald & Macgregor, Lithrs. Printed and sold for the benefit of the Liverpool Mechanics Institution, 1842'. 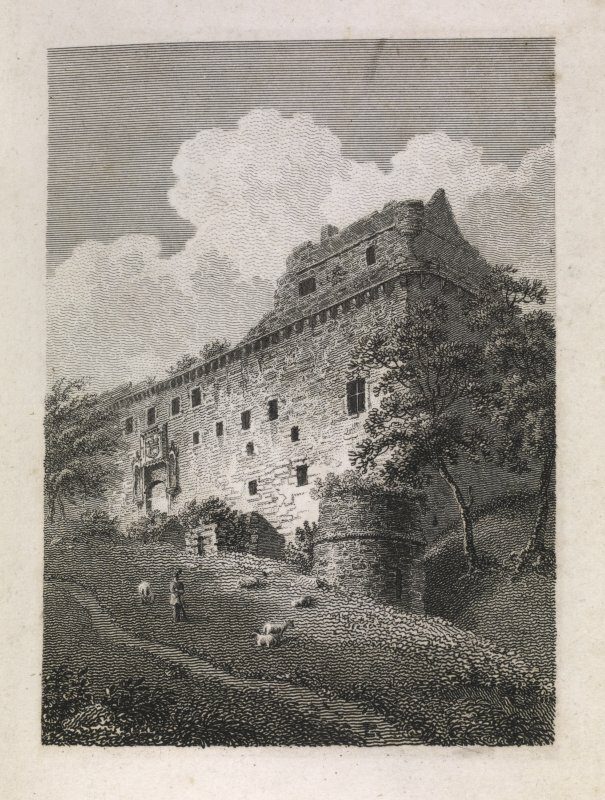 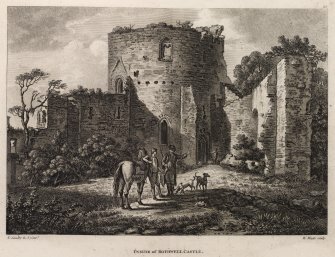 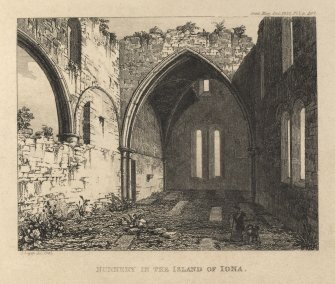 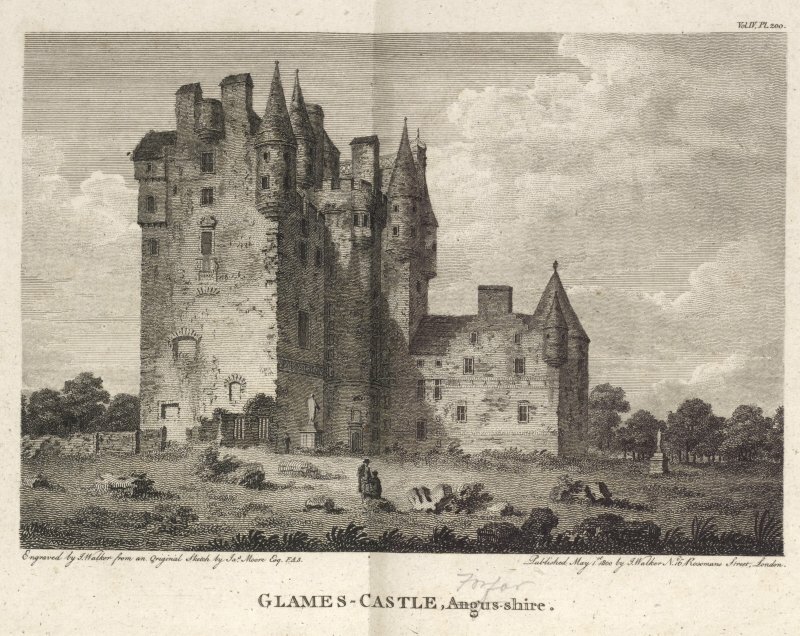 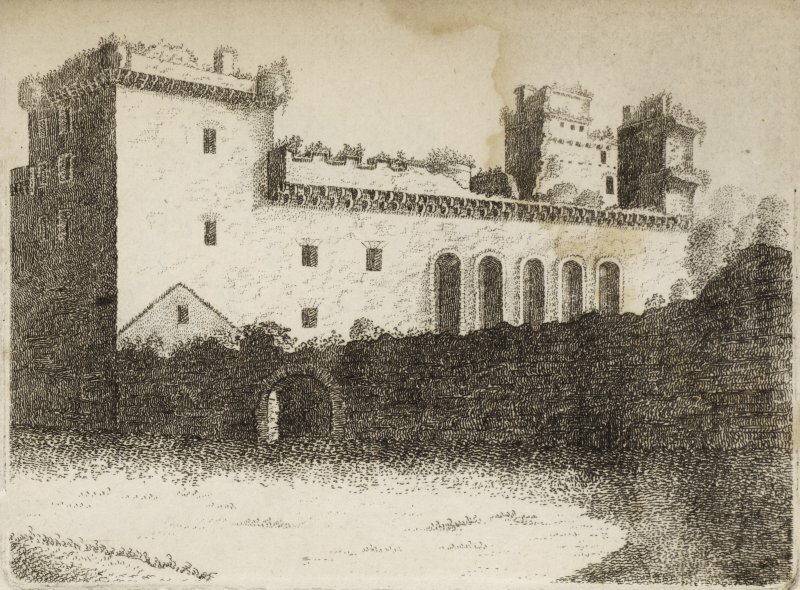 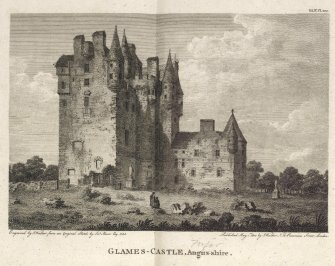 Engraving of Doune Castle showing main entrance beyond round tower. 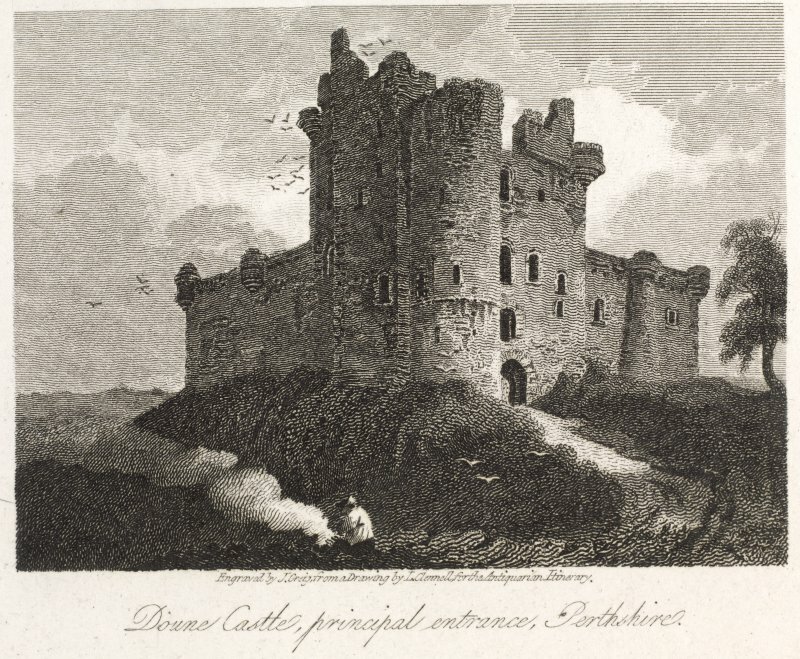 Titled: 'Doune Castle, principal entrance, Perthshire. 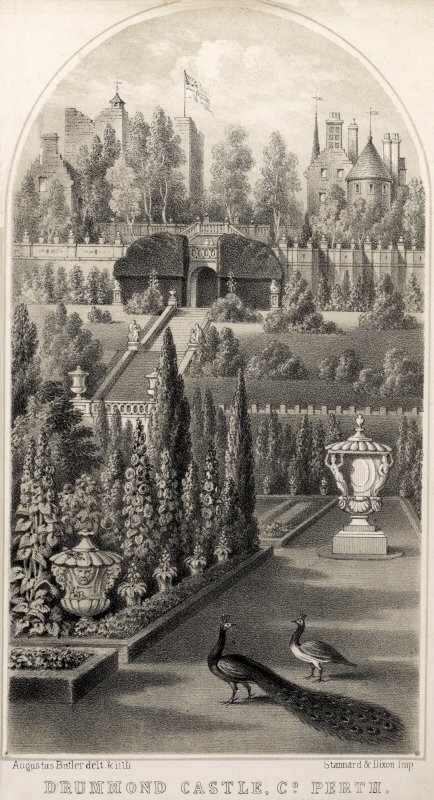 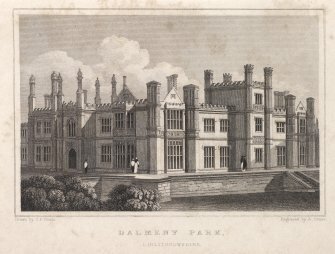 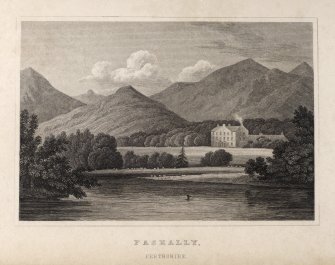 Engraved by J. Greig from a drawing by J. Clennell for The Antiquarian Itinerary. Published for the Proprietors Mar.1st 1815 by W. Clarke. 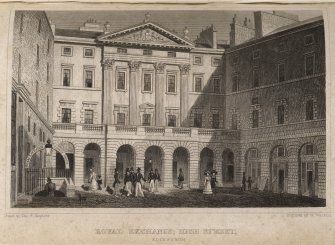 New bond Street'. 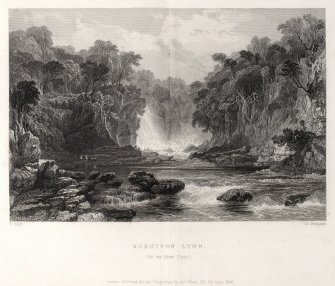 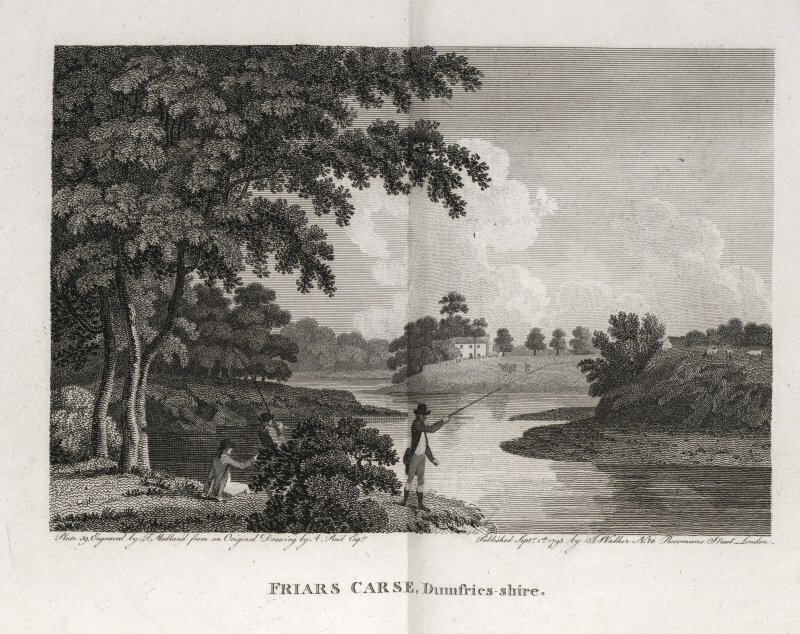 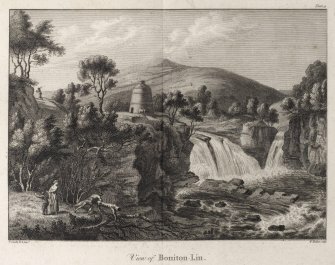 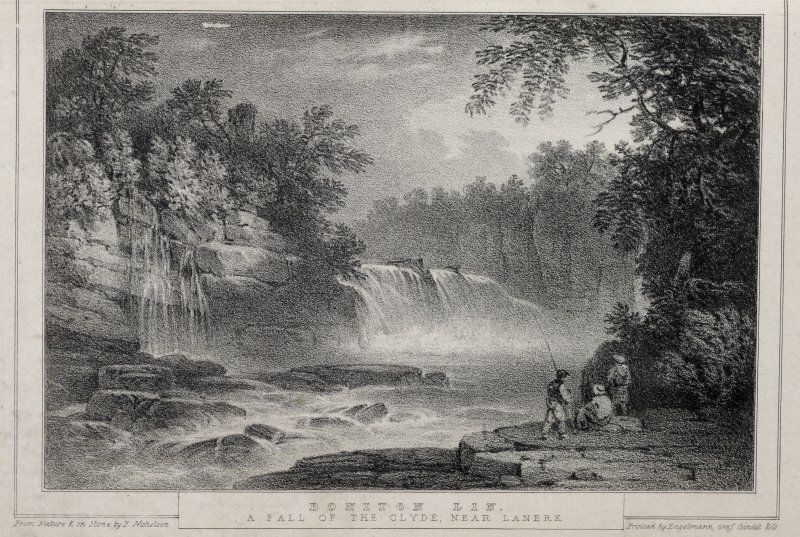 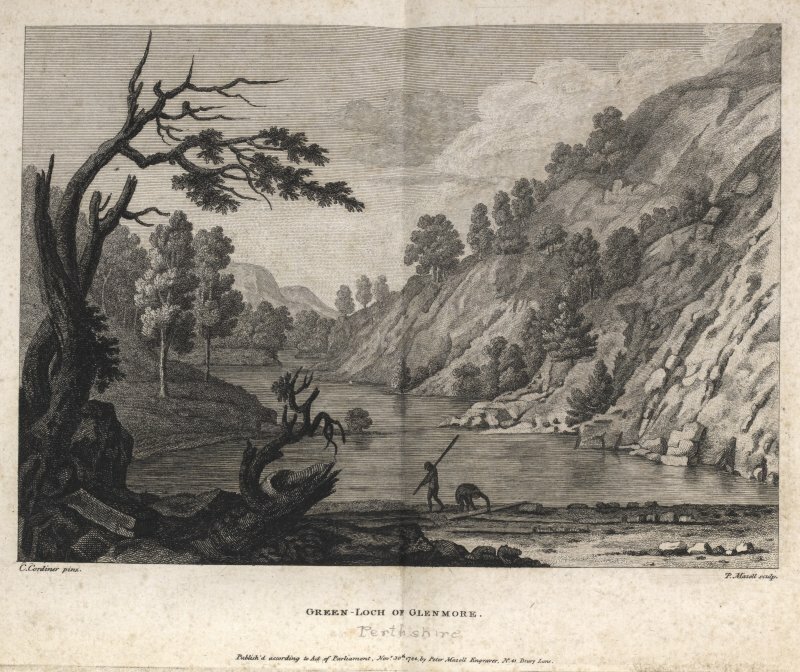 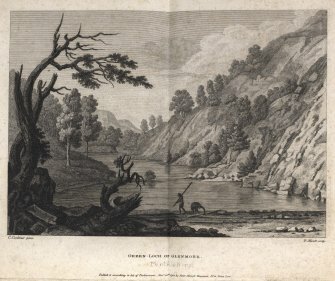 Engraving of river scene. 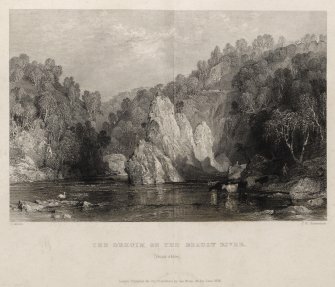 Titled: 'The Drhuim of the Beauly River (Ross-shire.) 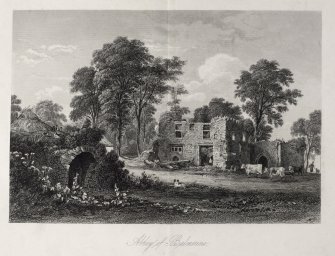 T. Allom. 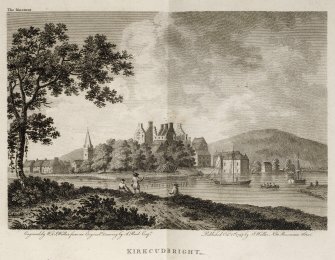 G.K.Richardson. London published for the Proprietors by Geo. Virtue, 26 Ivy Lane, 1836'. 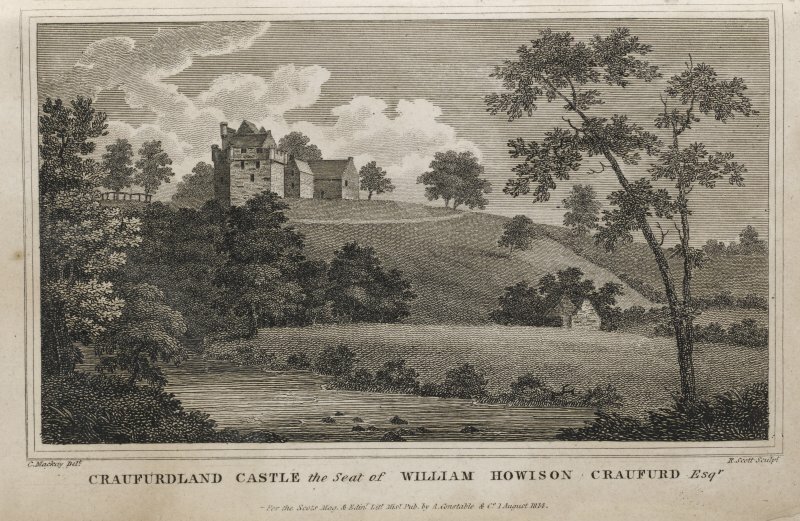 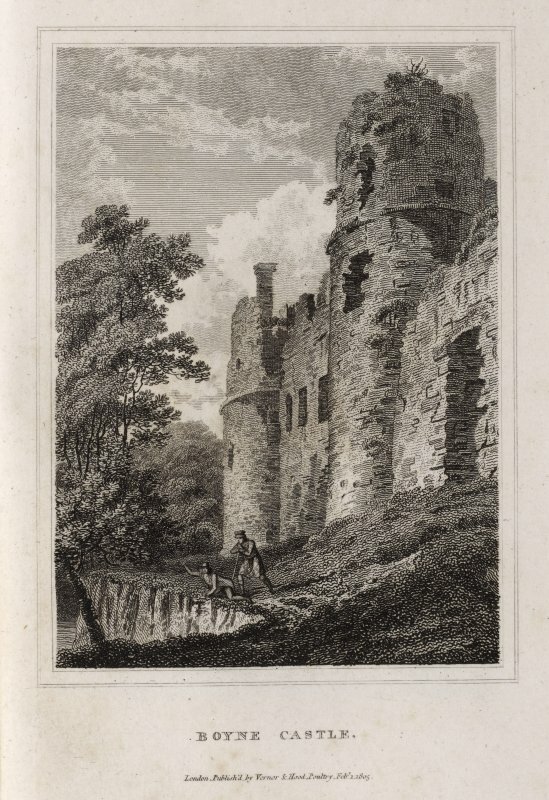 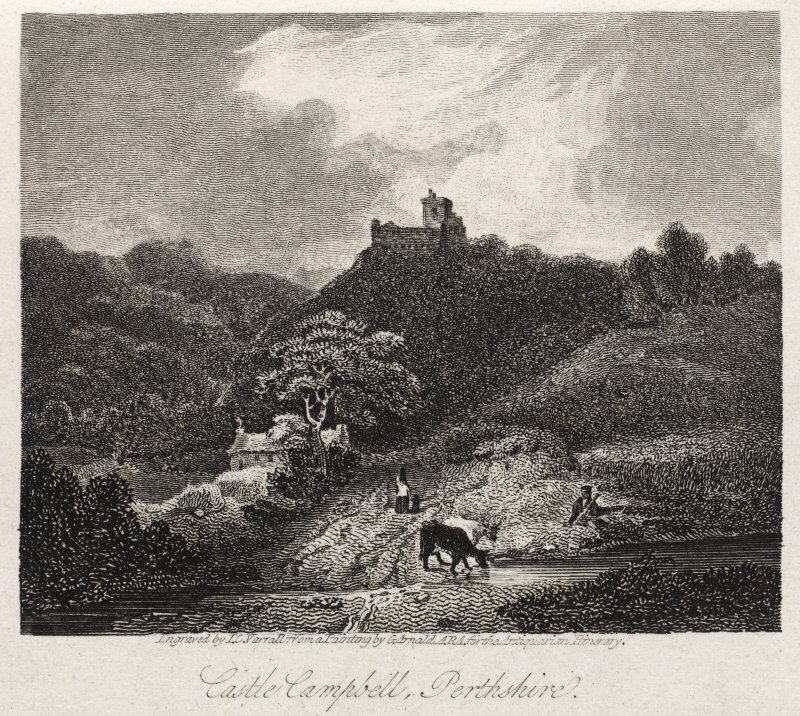 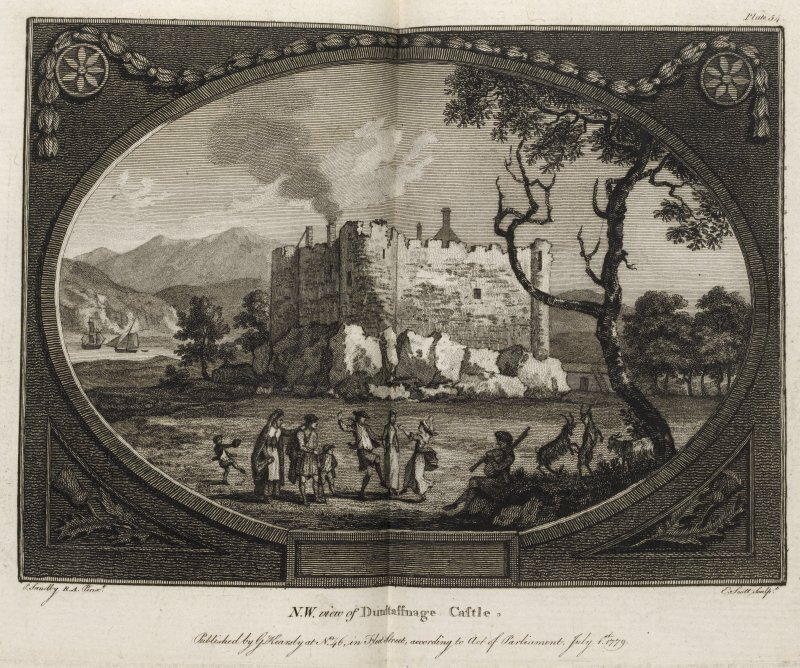 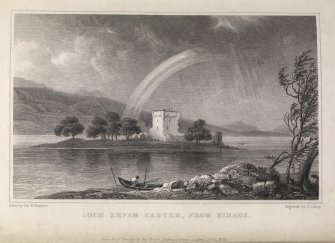 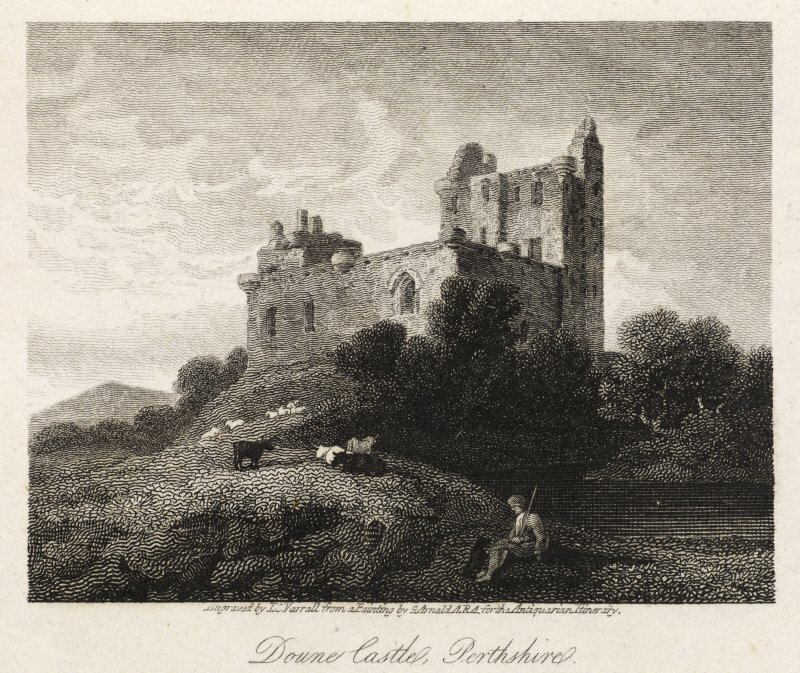 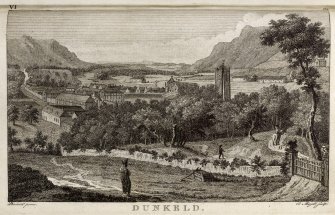 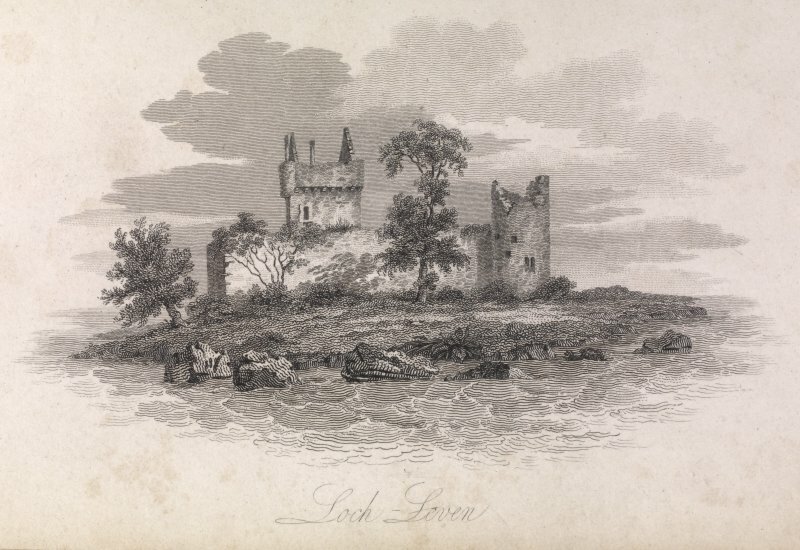 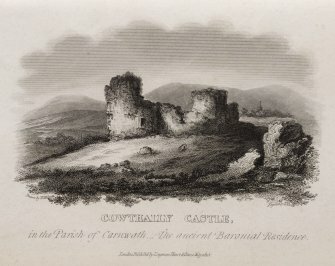 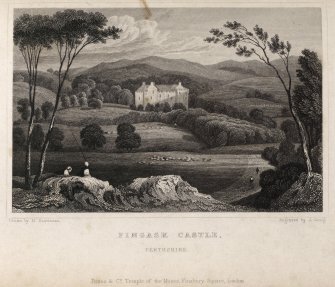 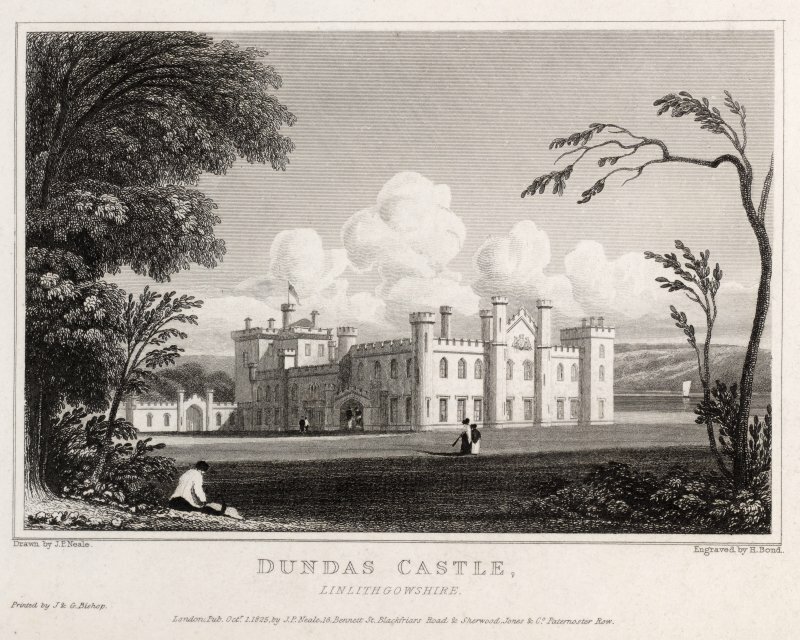 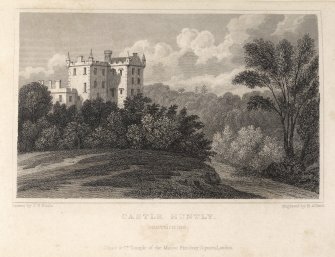 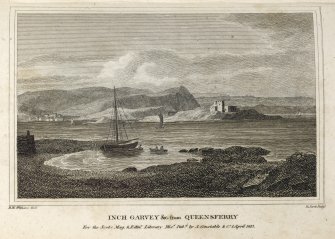 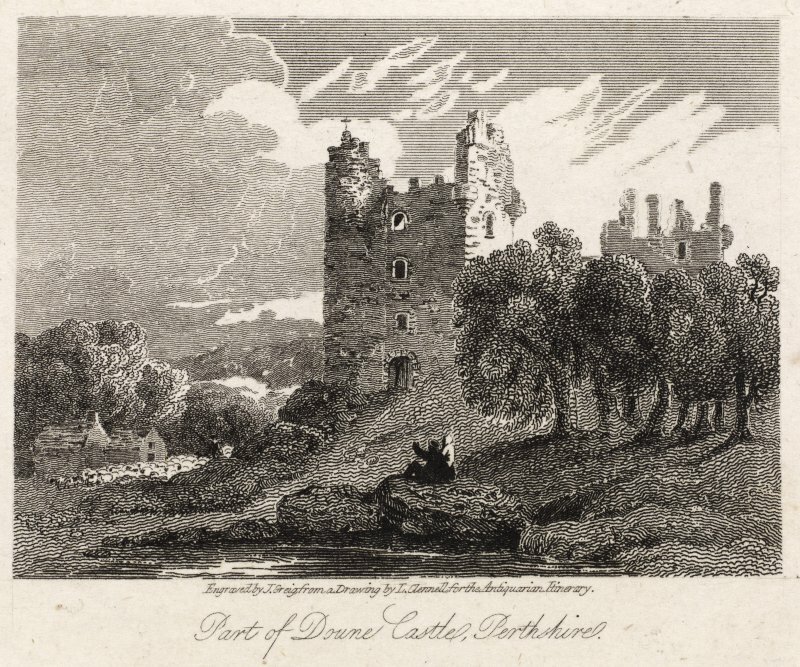 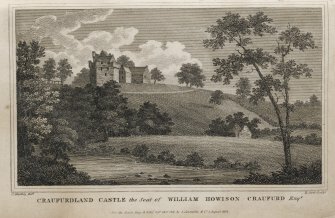 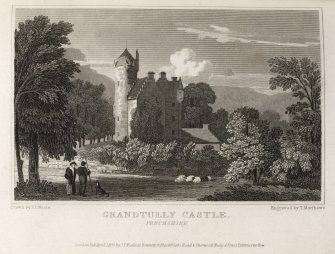 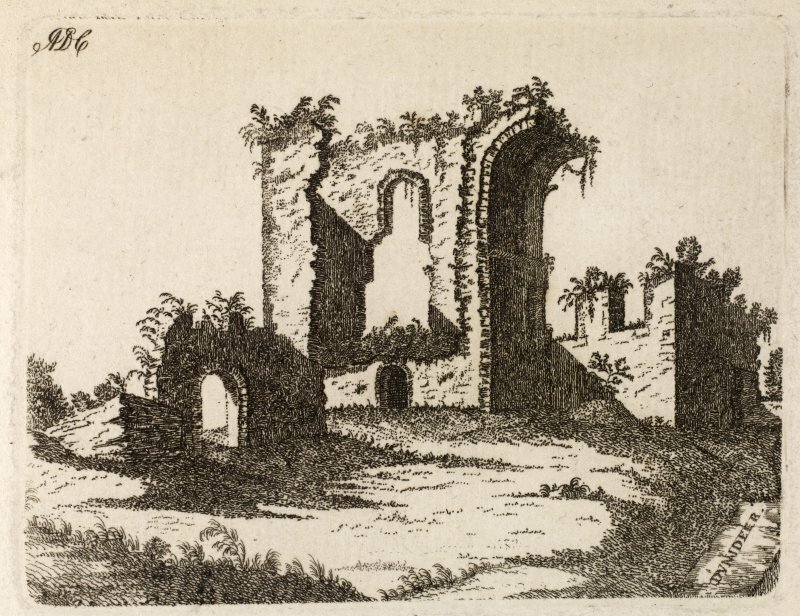 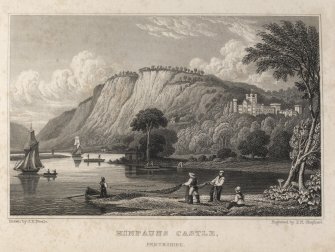 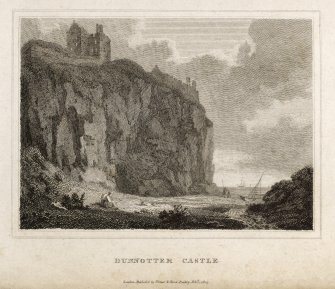 Engraving of Drumtochty Castle in a landscape. Titled: 'Drumtochty, Kincardineshire. 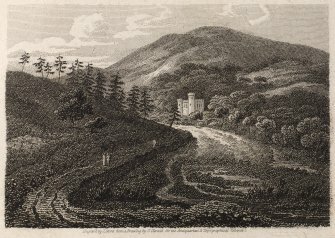 Engraved by J. Storer from a drawing by J. Glennie for the Antiquarian and Topographical Cabinet.' A descriptive paragraph follows referring to the local poet Dr. Beattie. 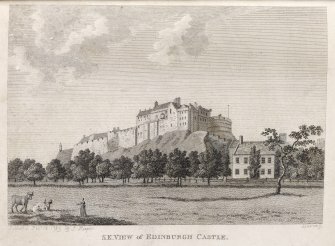 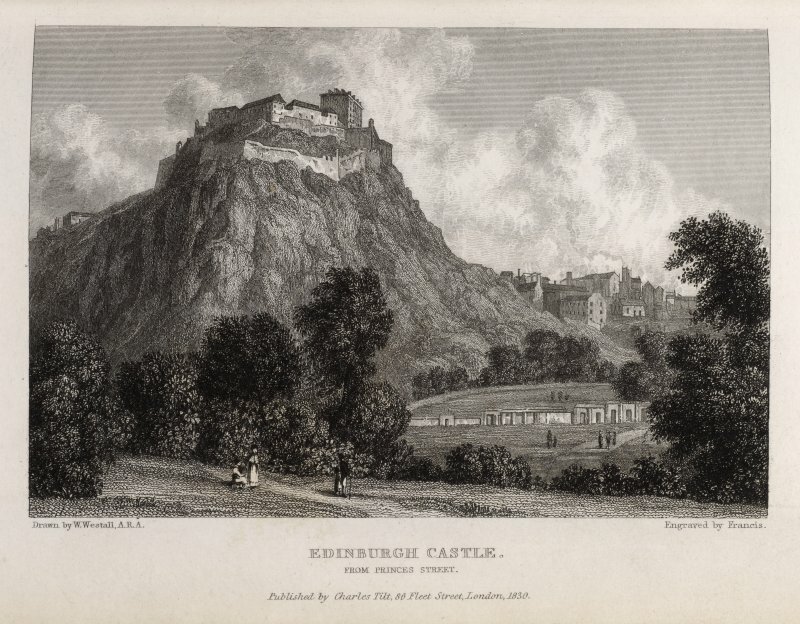 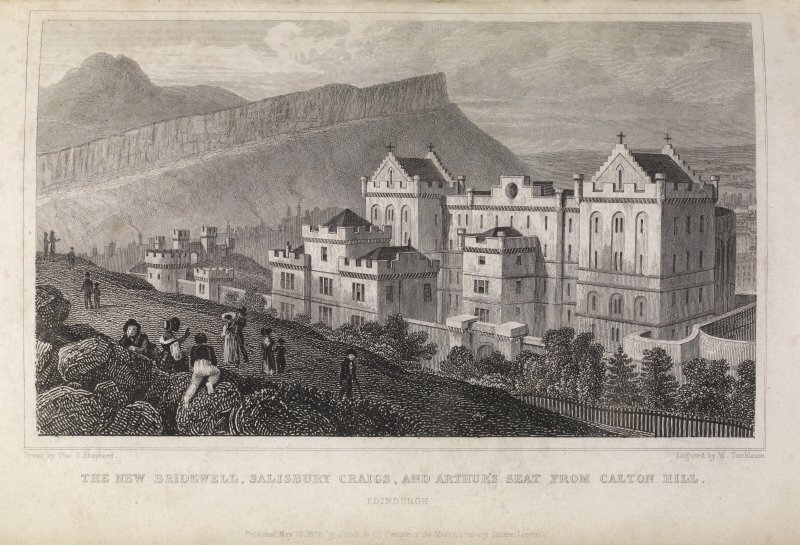 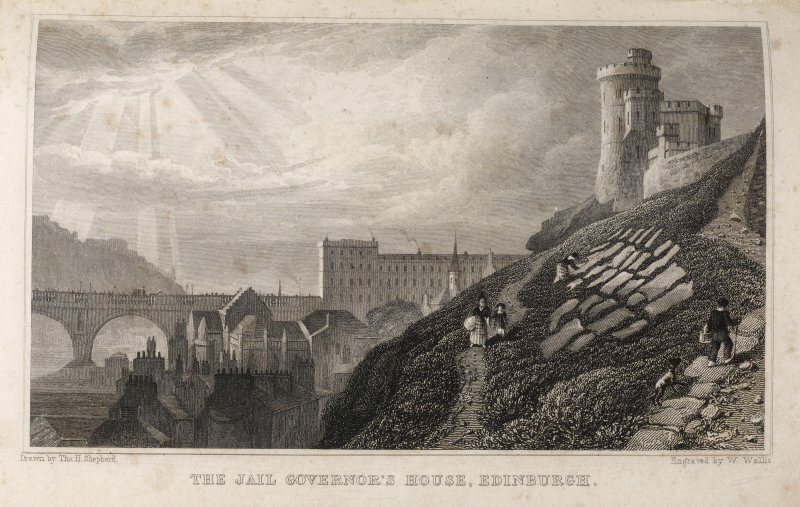 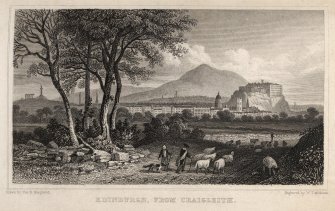 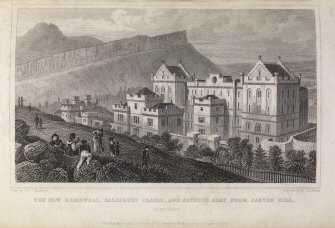 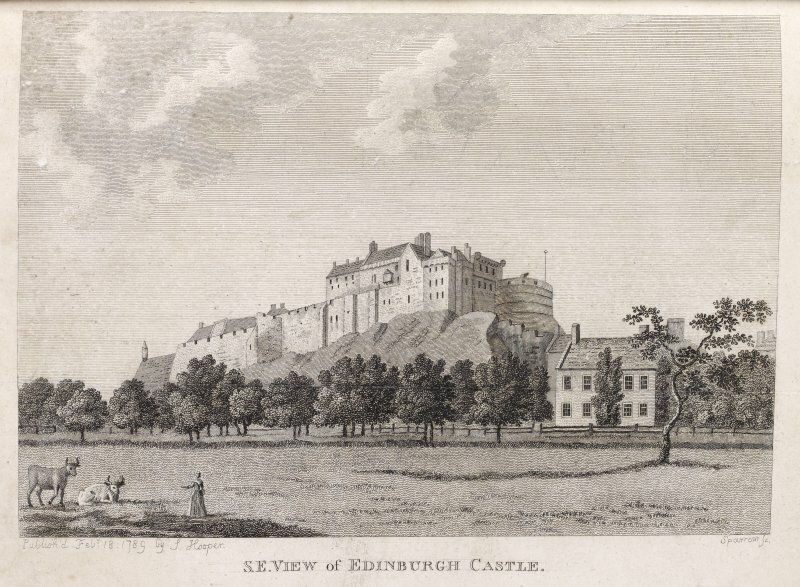 Edinburgh, engraving of NW view of Castle & rock from Gardens below. 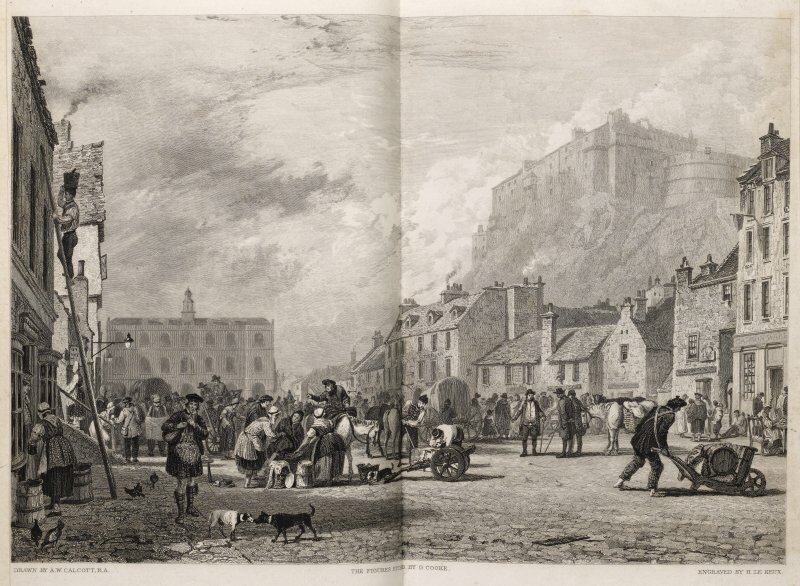 Titled 'Edinburgh Castle from Princes Street. Drawn by W. Westall, ARA. 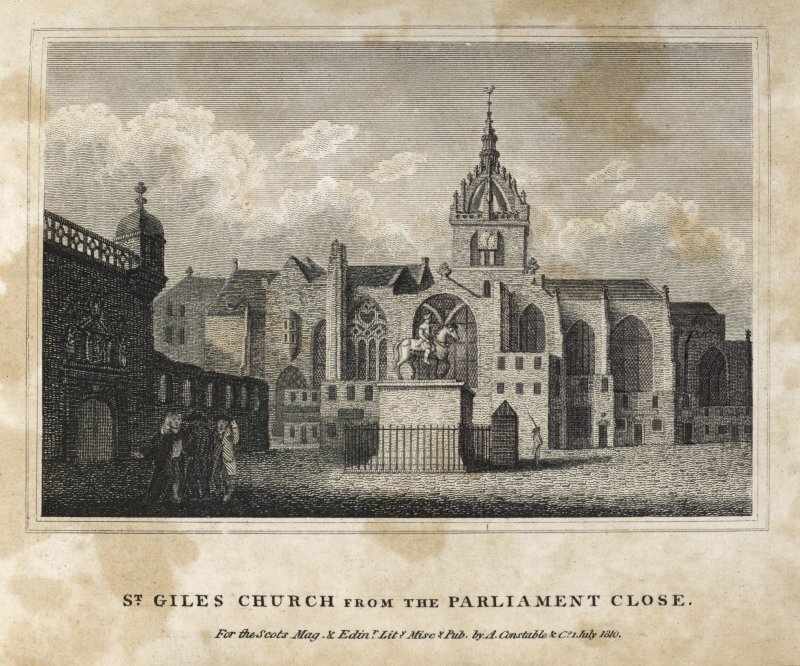 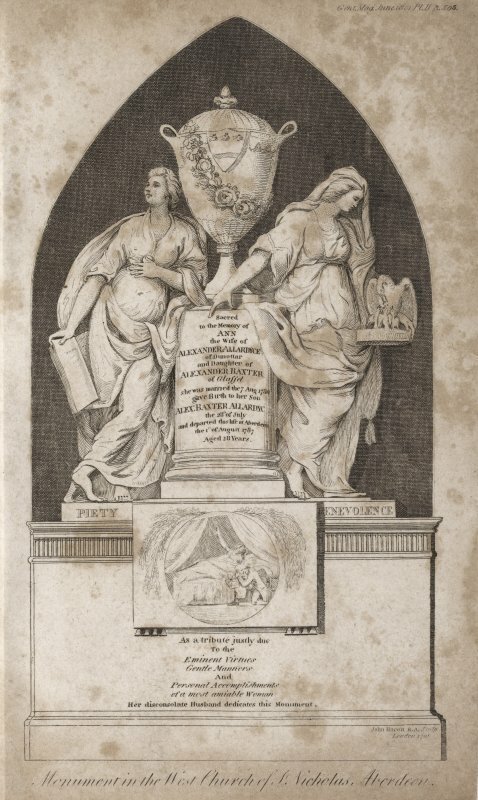 Engraved by Francis. Published by Charles Tilt, 86 Fleet Street, London. 1830. Engraving of Edinburgh Castle from southeast. Titled 'S.E.view of Edinburgh Castle. 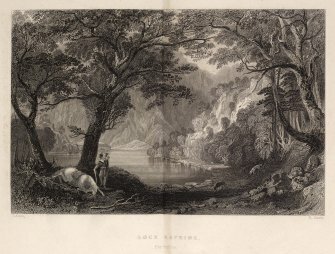 Published Feb.18 1789 by S. Hooper. 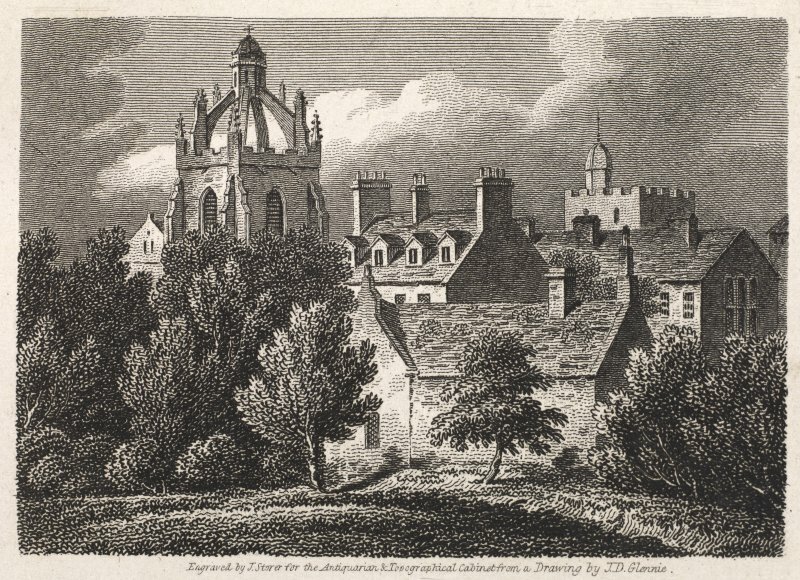 Sparrow Sc. 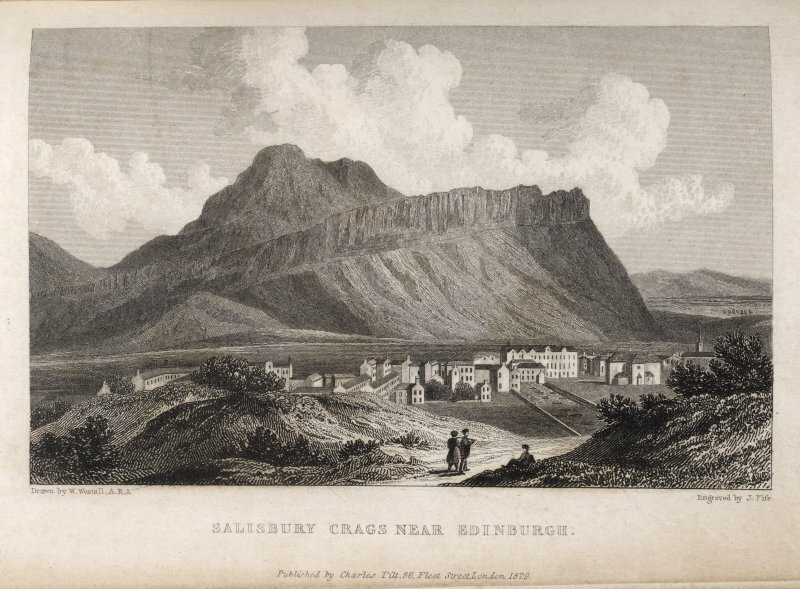 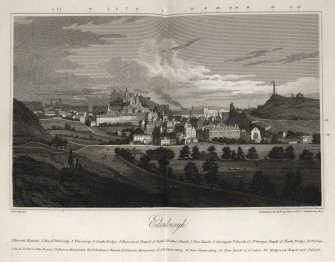 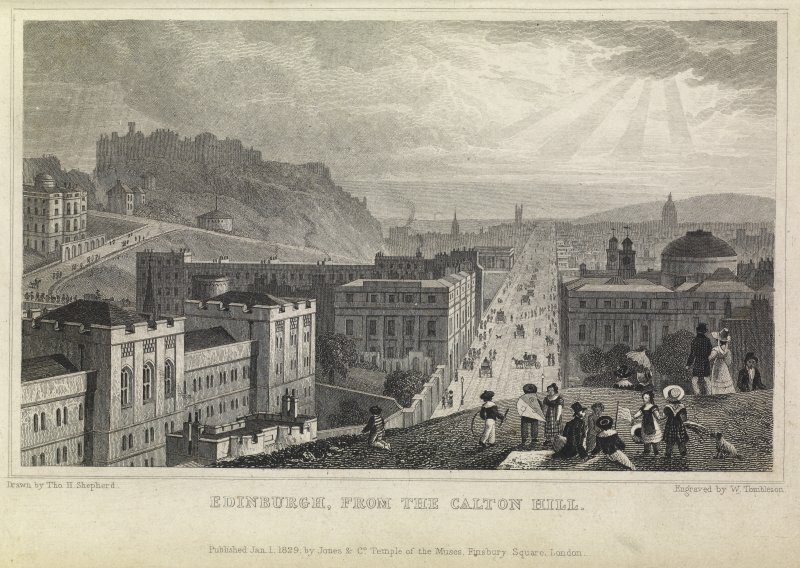 Engraving of Edinburgh from Craigleith. Titled 'Edinburgh from Craigleith. 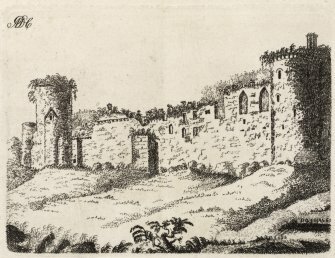 Drawn by Tho. 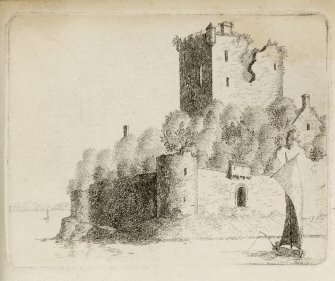 H. Shepherd. 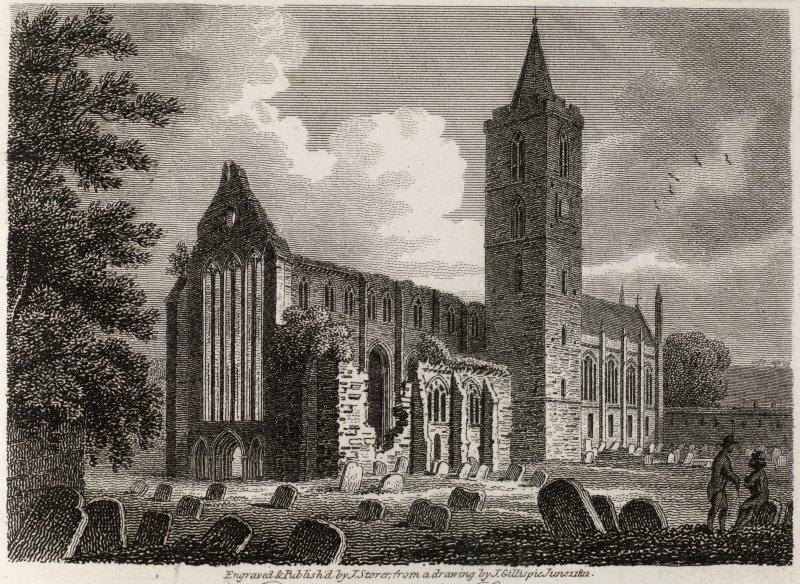 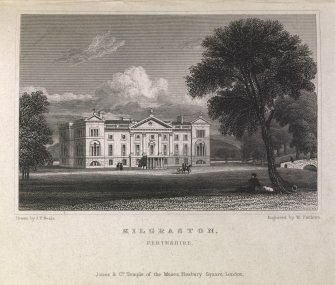 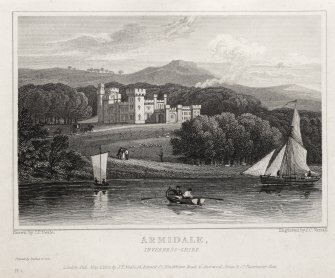 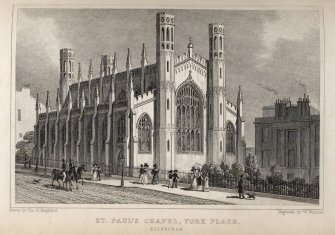 Engraved by W. Tombleton. 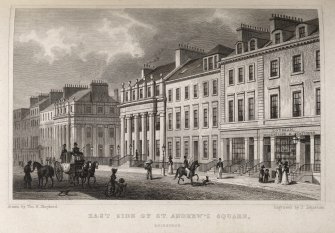 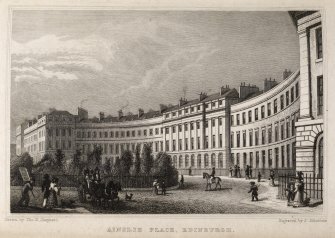 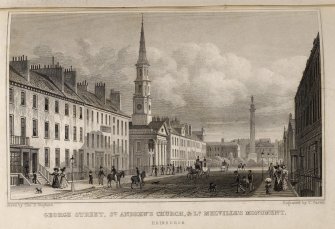 Edinburgh, engraving of Ainslie Place. 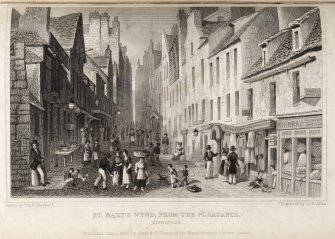 Titled 'Ainslie Place, Edinburgh. 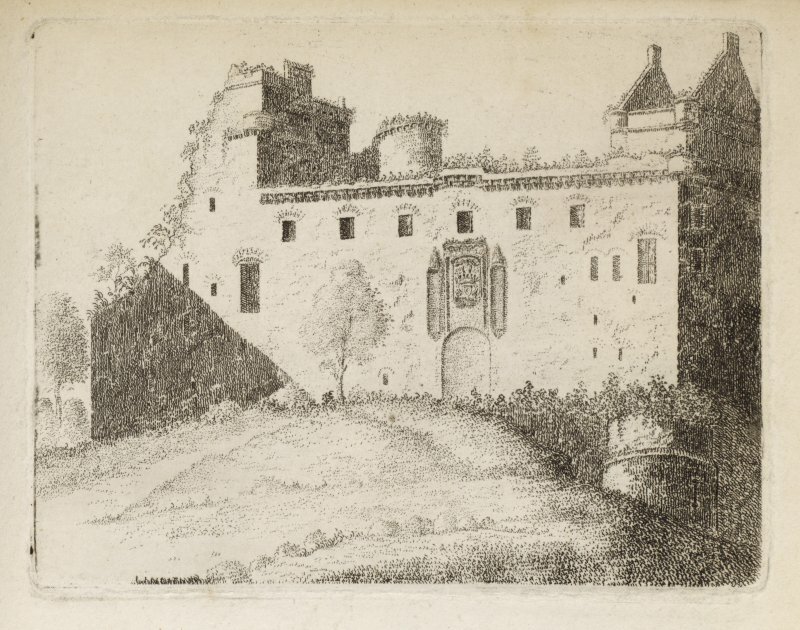 Drawn by Tho. H. Shepherd. 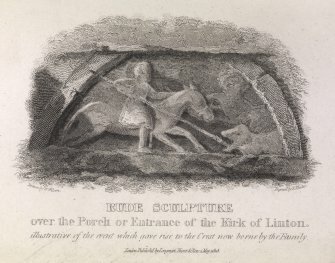 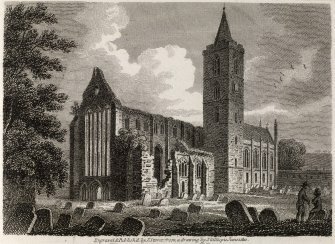 Engraved by J. Johnstone. 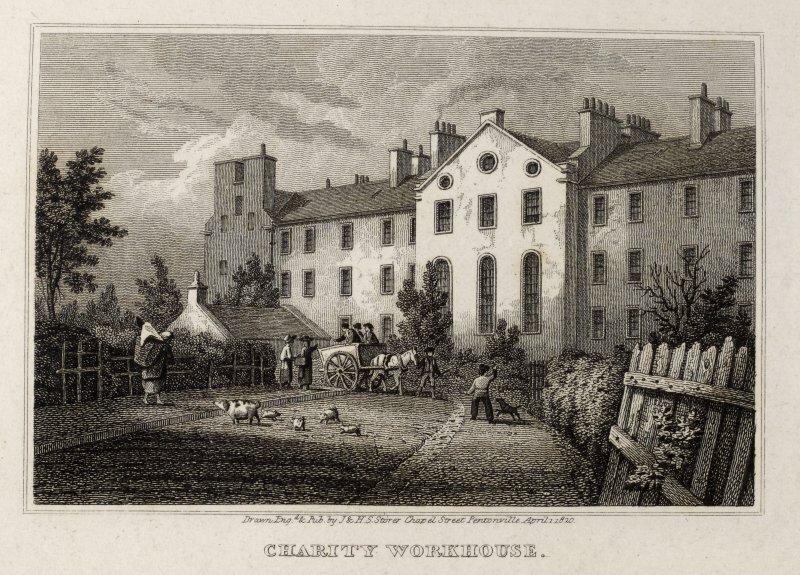 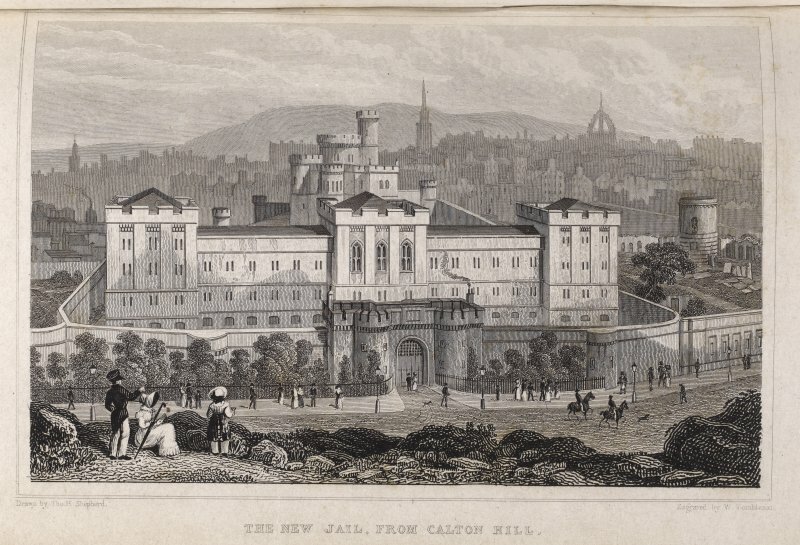 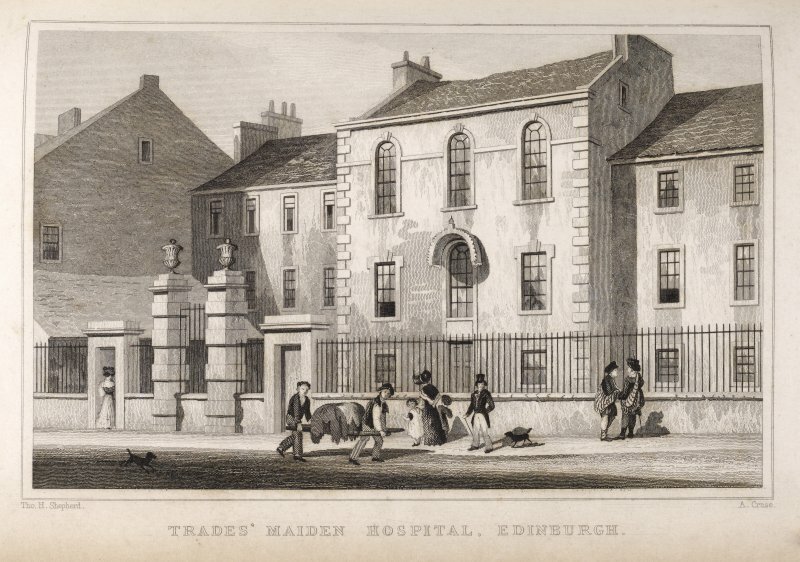 Edinburgh, engraving of the Asylum for the Industrial Blind with sedan chair, carriage and pair and showing the premises of Morton, Wines & Spirits. Possibly 58 Nicholson Street, Edinburgh. 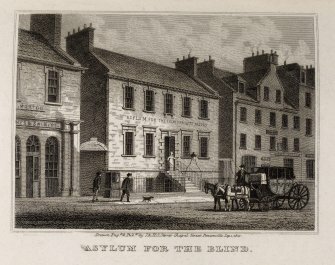 Titled 'Asylum for the Blind. 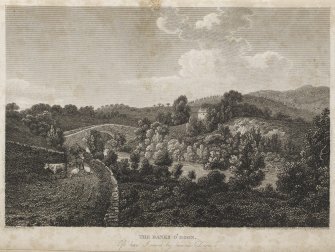 Drawn, engraved and published by J. & H.S. Storer, Chapel Street, Pentonville Square. 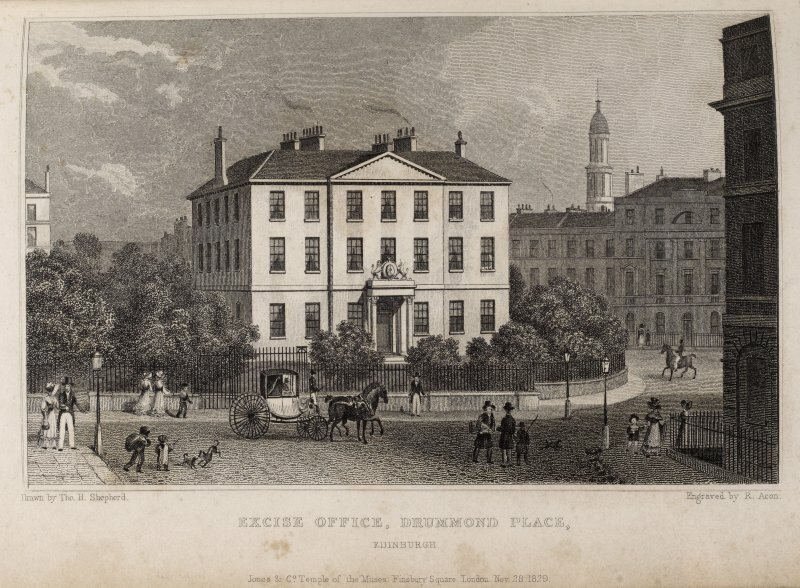 Edinburgh, engraving showing New Custom House, see RAB/292/110 Excise Office, Bellevue House, Drummond Place. 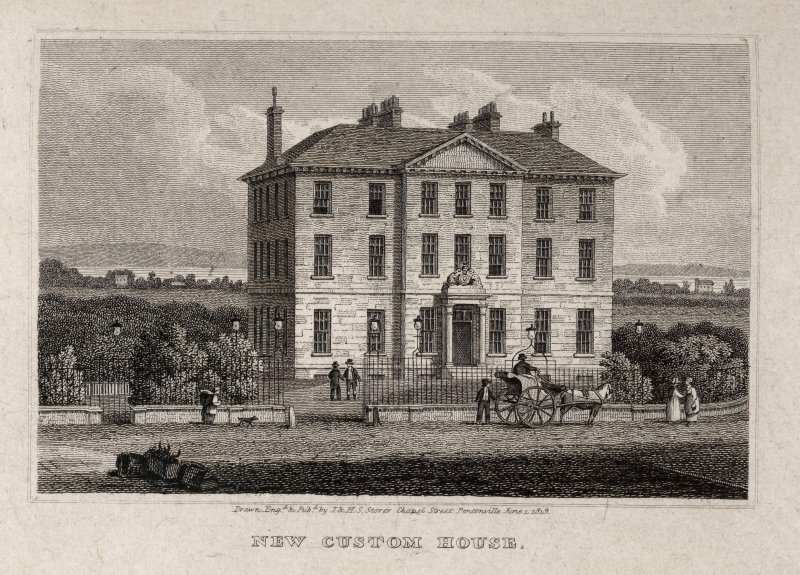 Titled 'New Custom House. Drawn, engraved and published by J. and H.S. Storer, Chapel Street, Pentonville, June 1, 1819. 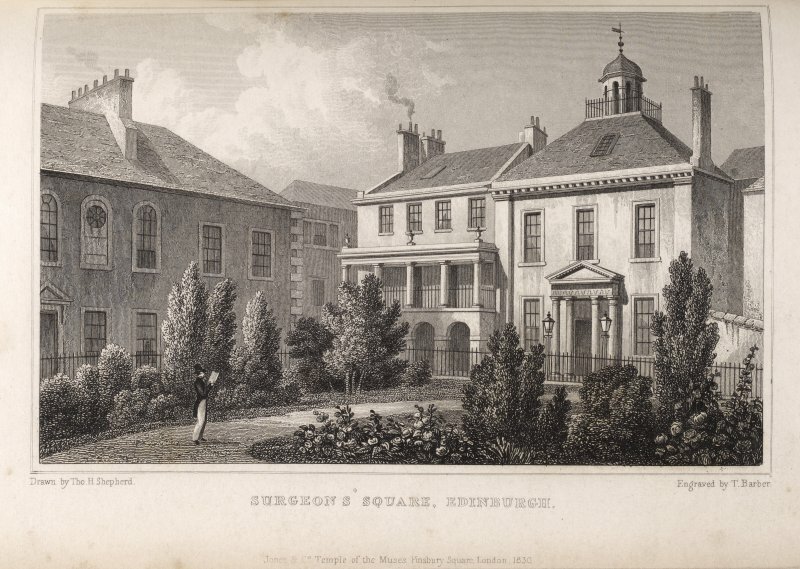 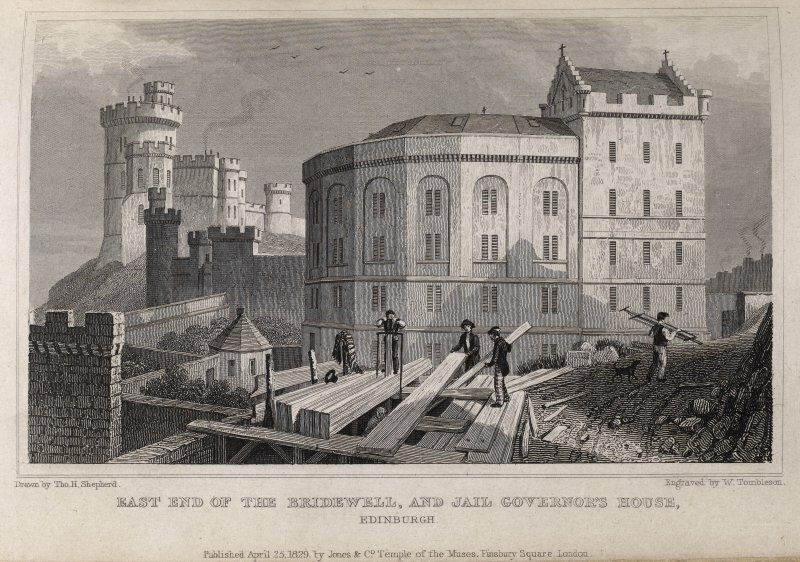 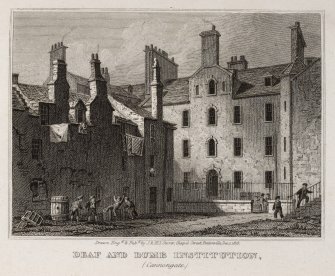 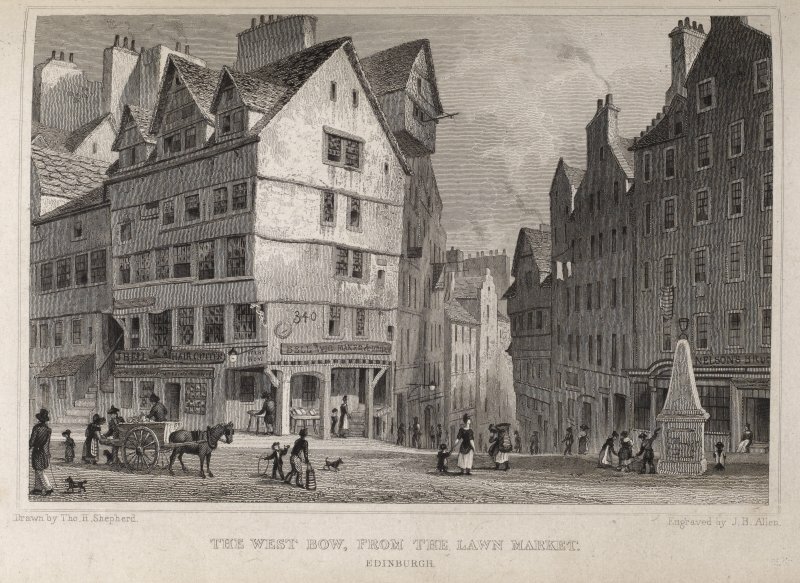 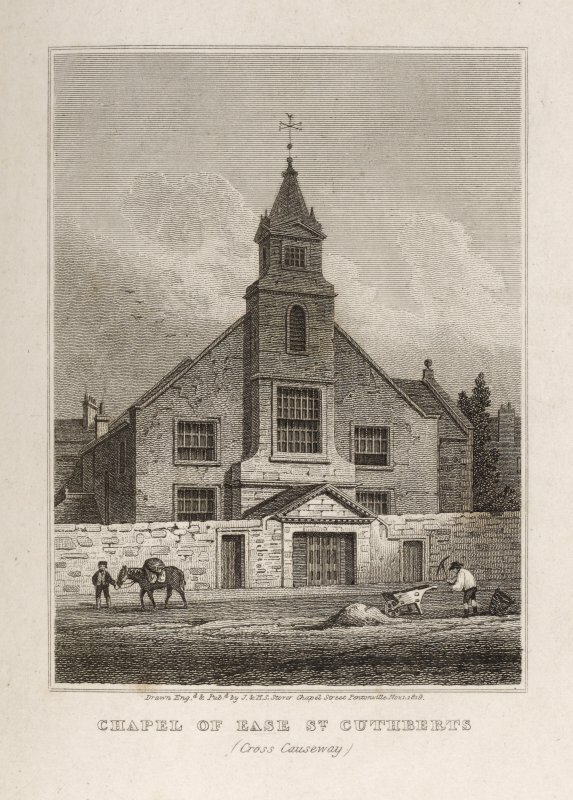 Engraving showing Chessel's Court, Edinburgh from North West Titled: 'Deaf and Dumb Institution (Canongate)'. 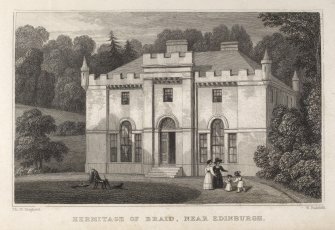 Inscribed: 'Drawn Engd. 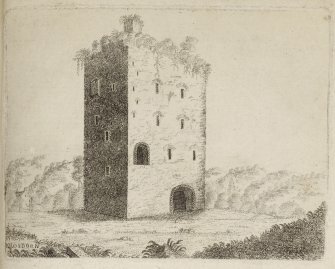 & Pubd. by J. & H.S. 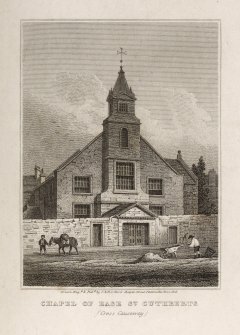 Storer, Chapel Street, Pentonville, Dec, 1, 1819'. 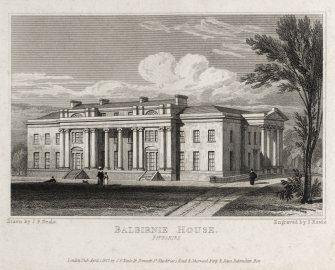 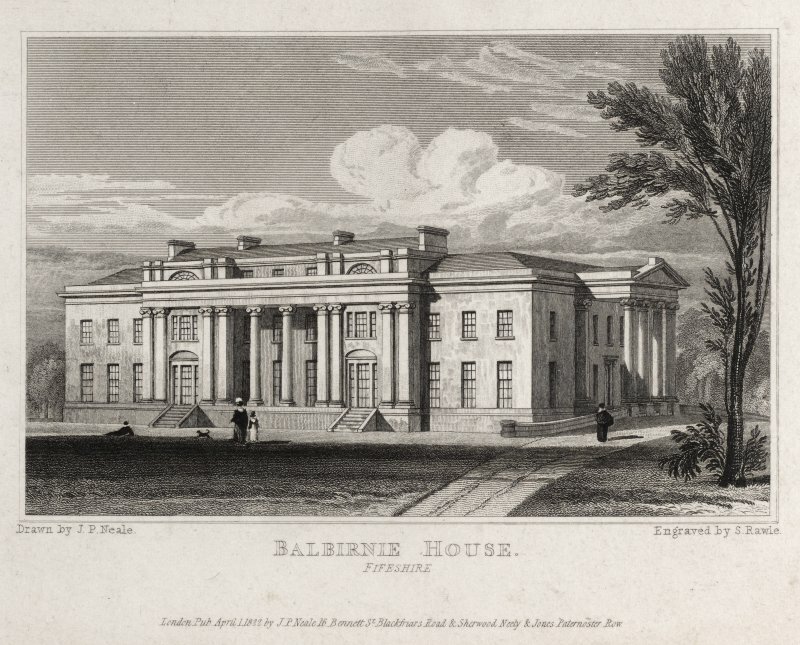 Engraving of Bellevue House, see RAB 292/108 New Custom House. 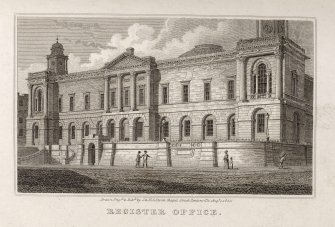 Titled, 'Excise Office, Drummond Place, Edinburgh. 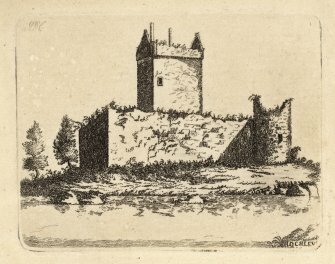 Drawn by Tho. 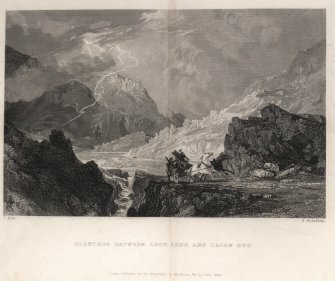 H. Shapherd. Engraved by R. Acon. 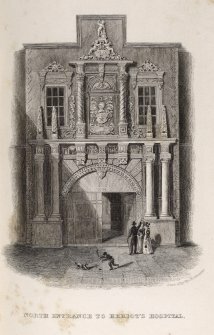 Jones & Co. Temple of the Muses, Finsbury Square. 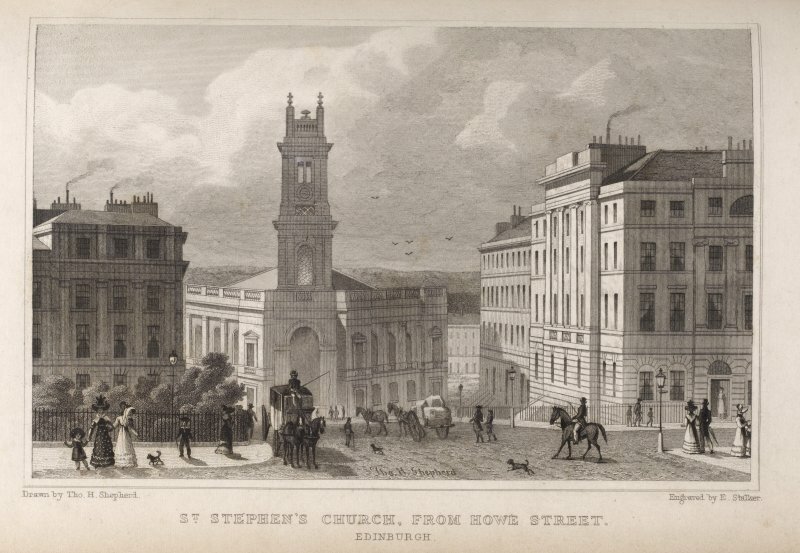 London, Nov. 28, 1829. Engraving of Findlater Castle on cliff above sea. 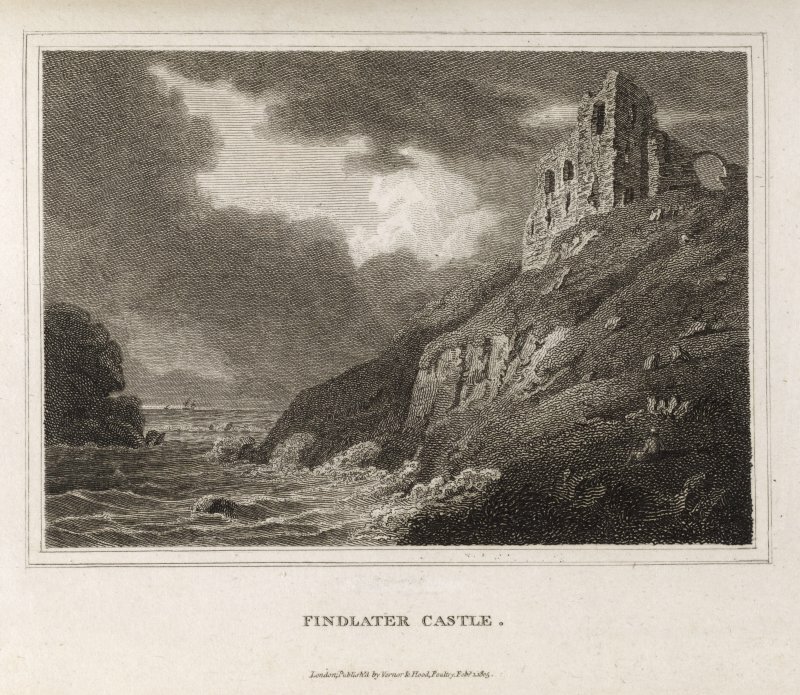 Titled 'Findlater Castle. 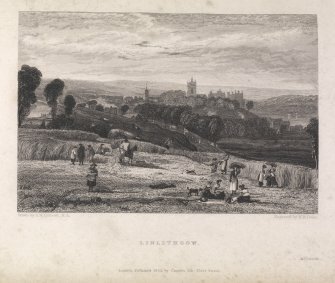 London, Published by Vernor & Hood, Poultry, Feby. 1, 1805. 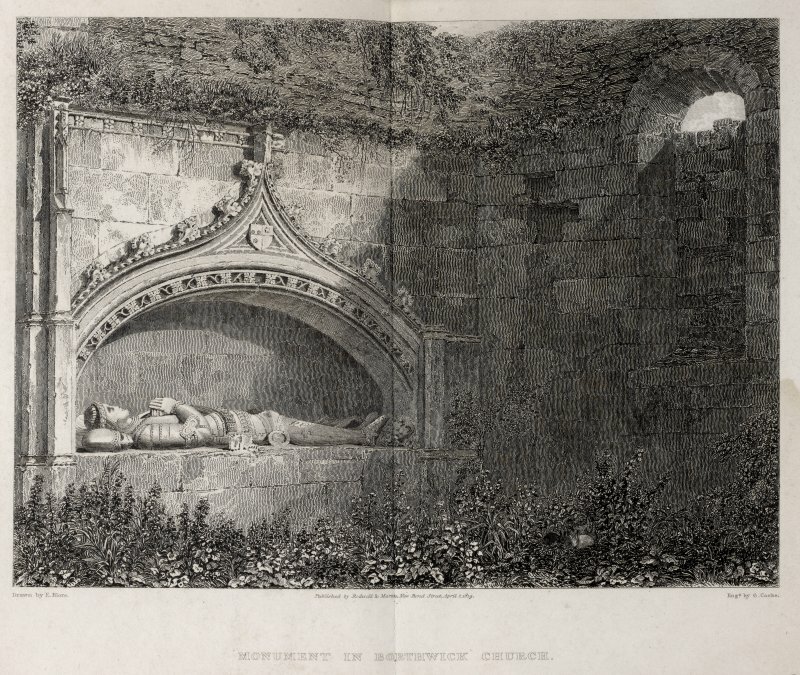 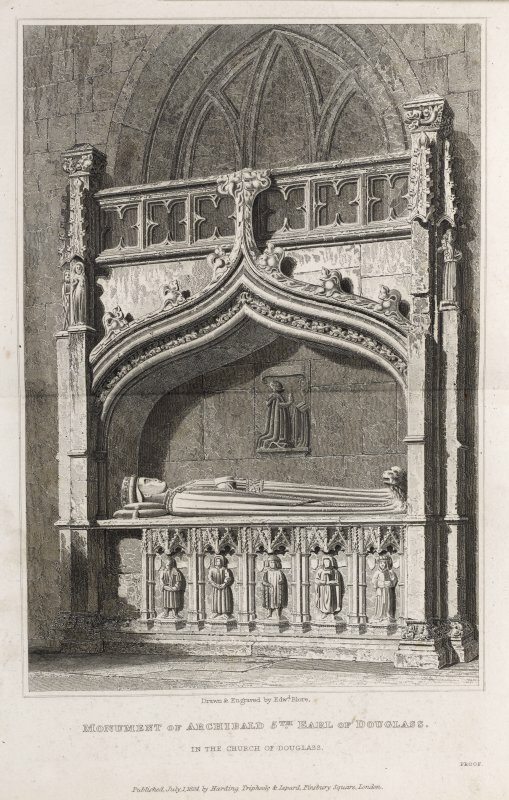 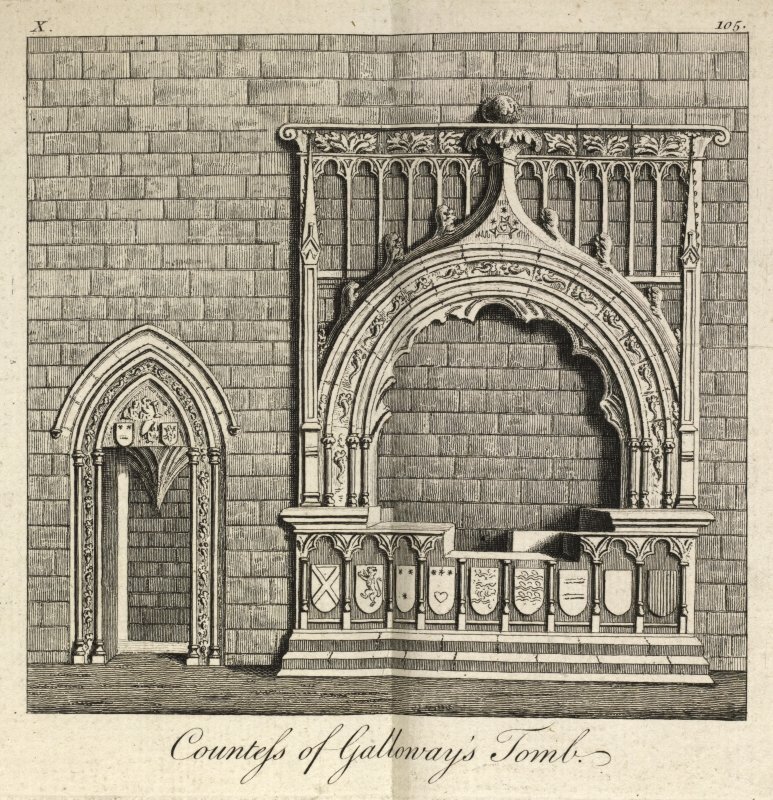 Engraving of Countess of Galloway's Tomb. 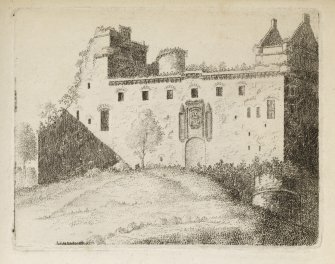 105. 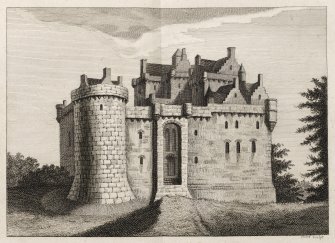 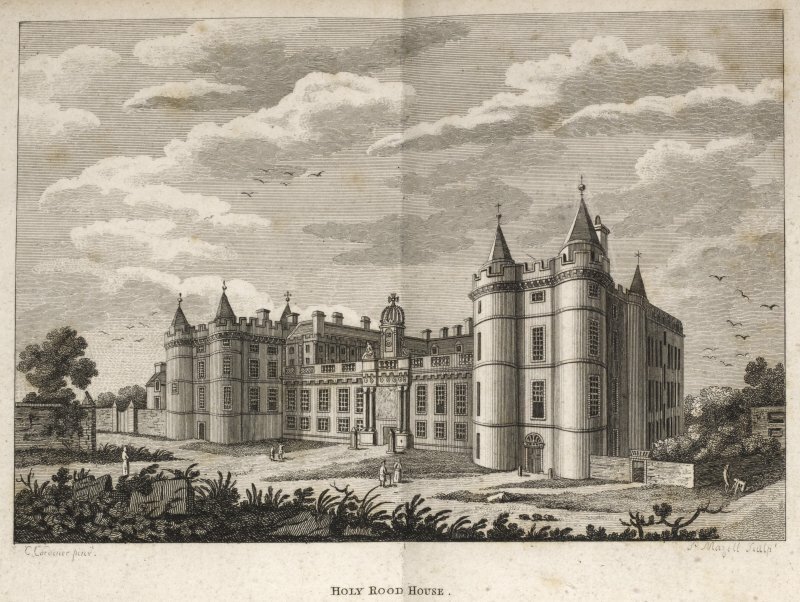 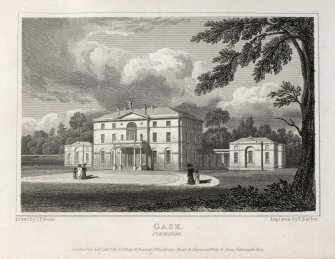 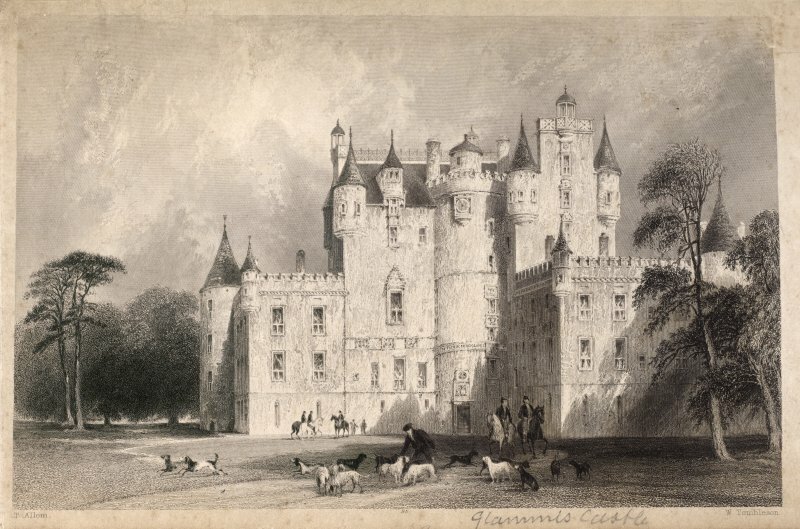 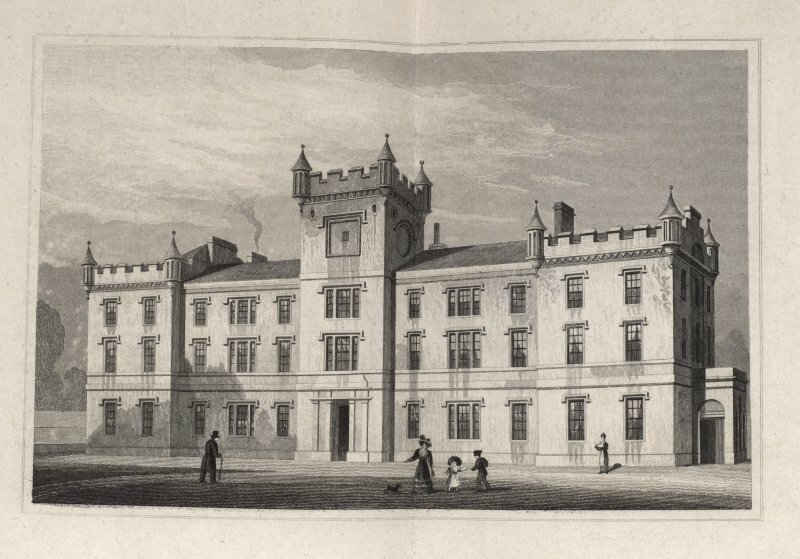 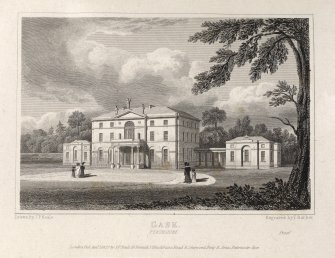 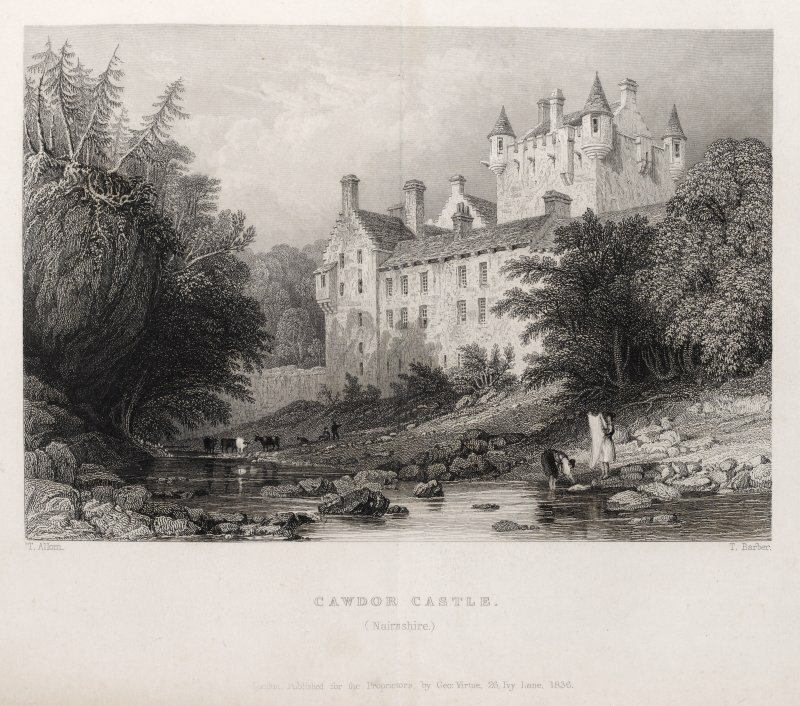 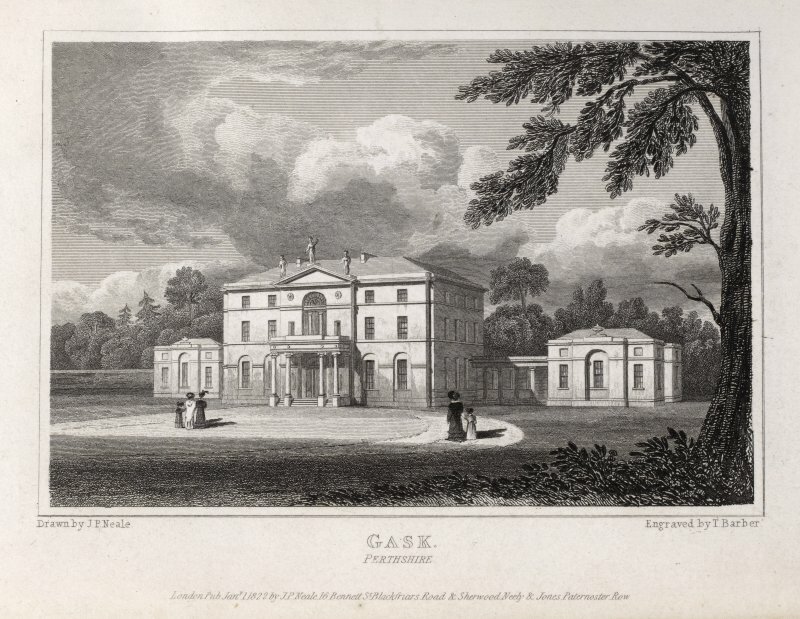 Engraving of Gordon Castle showing main block & extended wings. 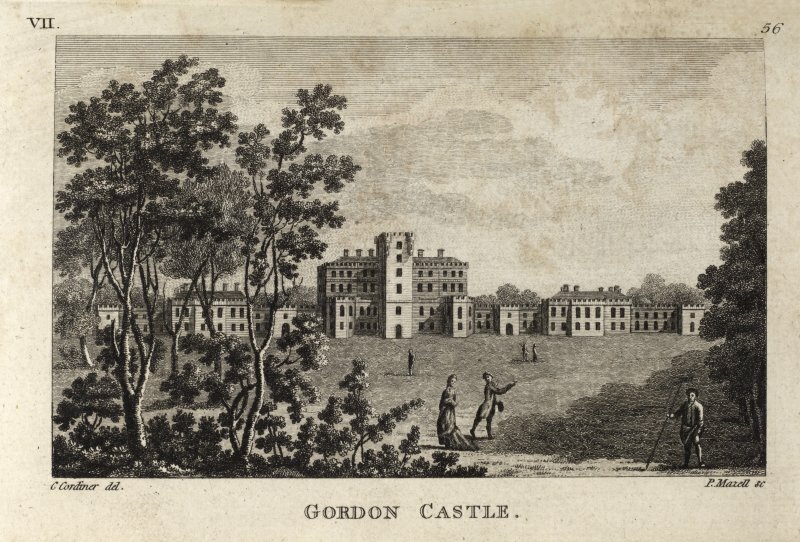 Titled 'Gordon Castle. 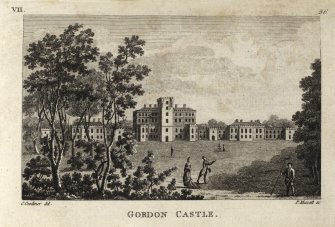 G. Cordiner del. P. Mazell sc. 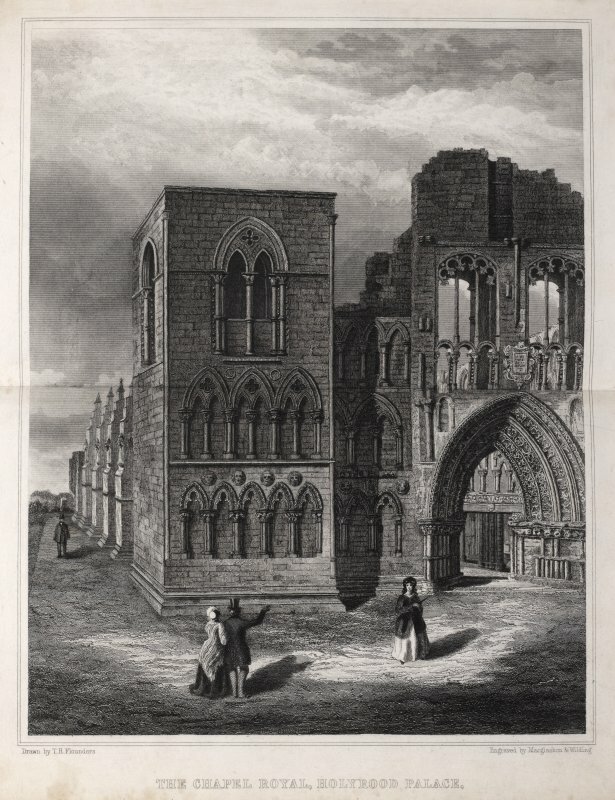 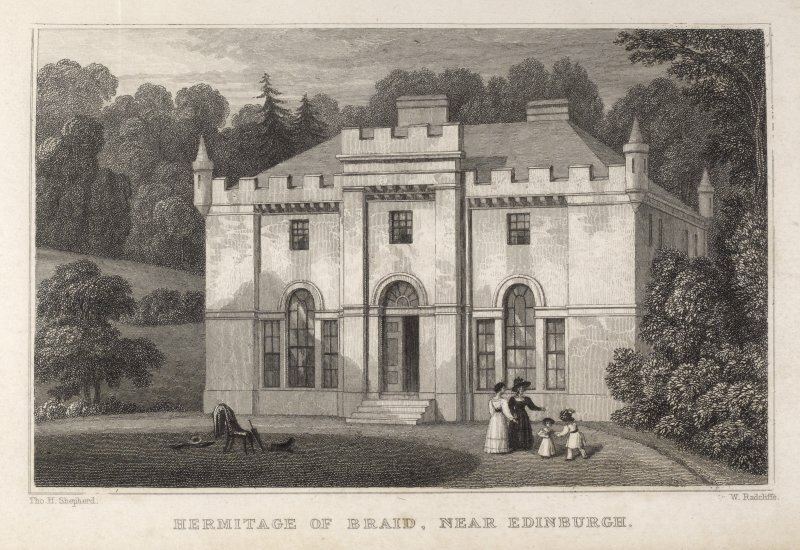 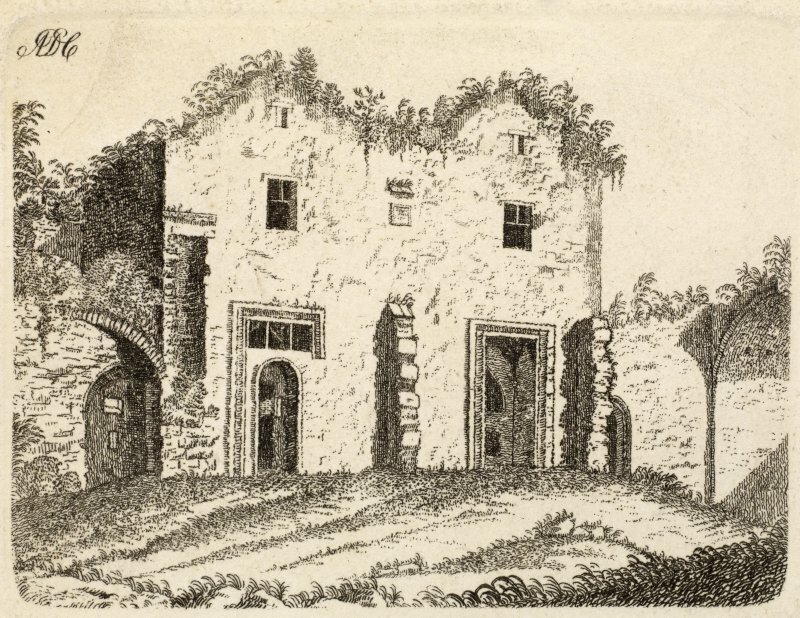 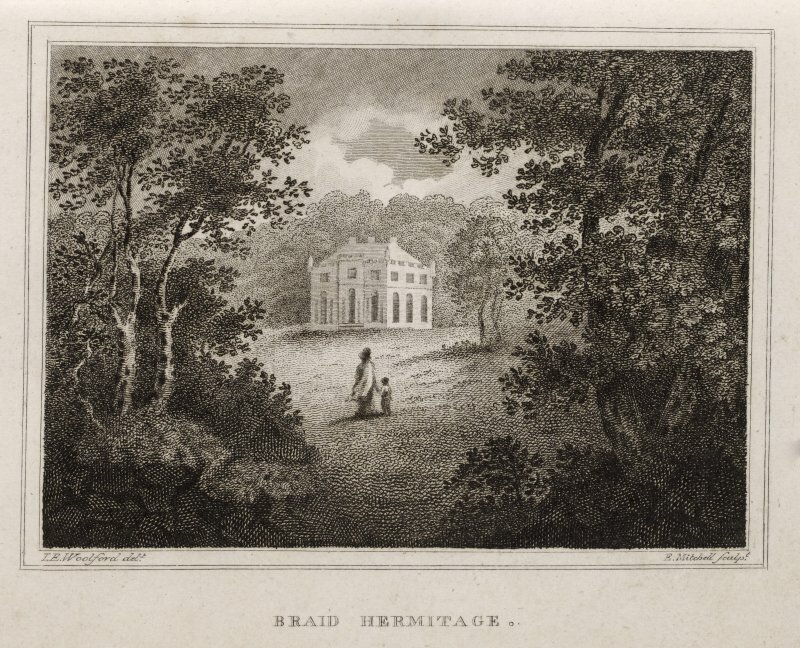 Edinburgh, engraving of Hermitage of Braid, front view. 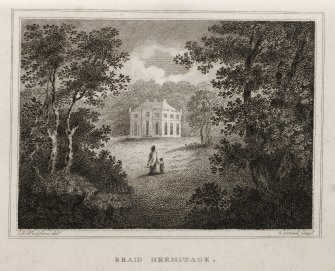 Titled: 'Hermitage of Braid, Near Edinburgh. 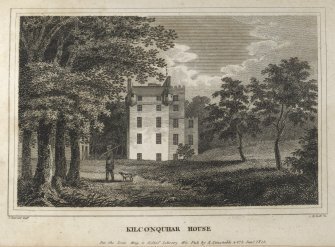 Tho. 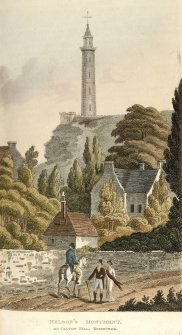 H. Shepherd. 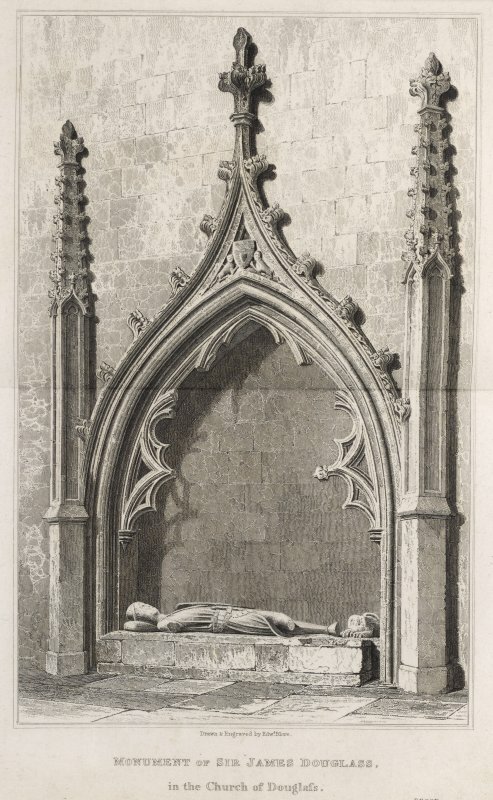 W. Radcliffe. 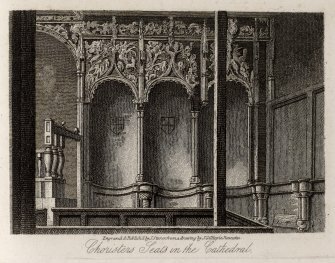 Engraving of a corner of interior of the Chapel of Holyrood, Edinburgh, showing 5 arched niches with decorative stonework below. Titled ' Interior of the Chapel of Holyrood, Edinburgh. 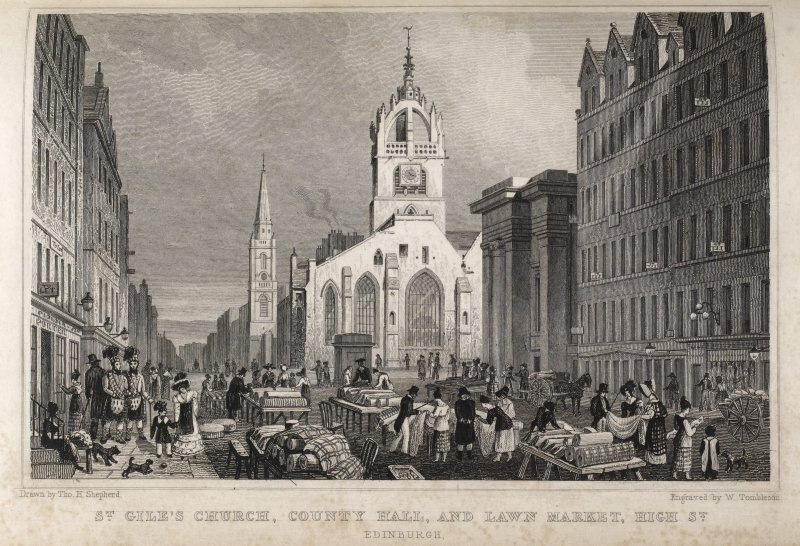 London, Published Jan.1st, 1815 for the Proprietors by Longman & Co. Paternoster Row. 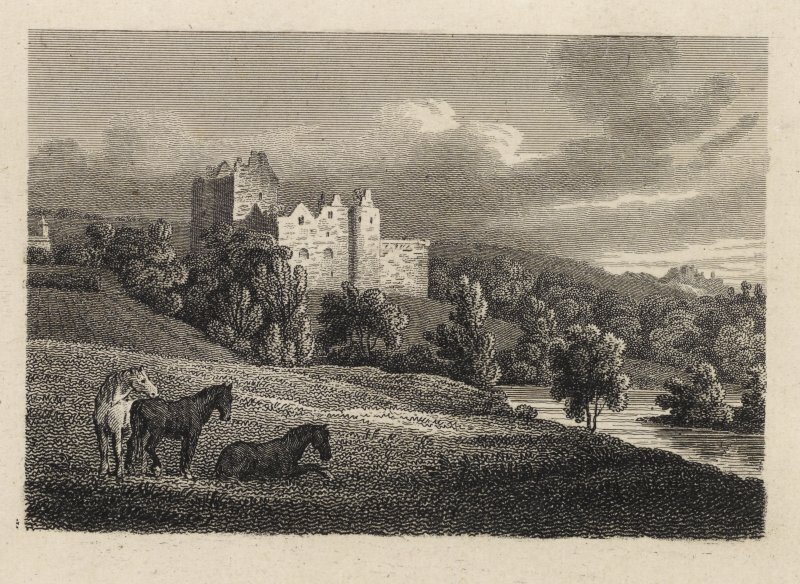 Engraved by J. Greig from a painting by L. Clennell for the Border Antiquities of England & Scotland. Engraving from southwest of part of the front of Linlithgow Palace showing five arched windows of the chapel. 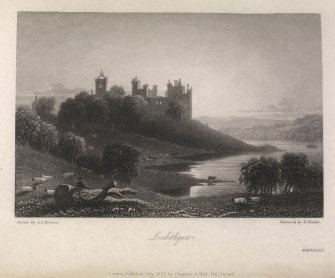 Titled 'Linlithgow, Plate 1.